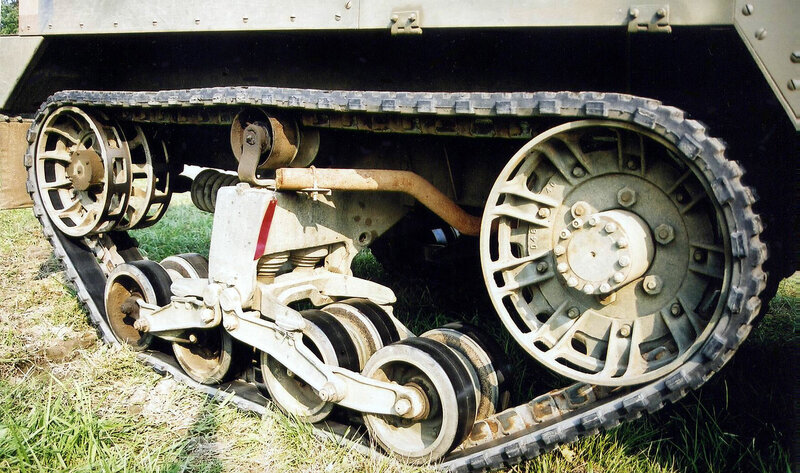 For some 30 years, Tamiya was really the only game in town when it came to U.S. half-tracks, aside from a couple older Monogram sets that disappeared by the early 1970s. 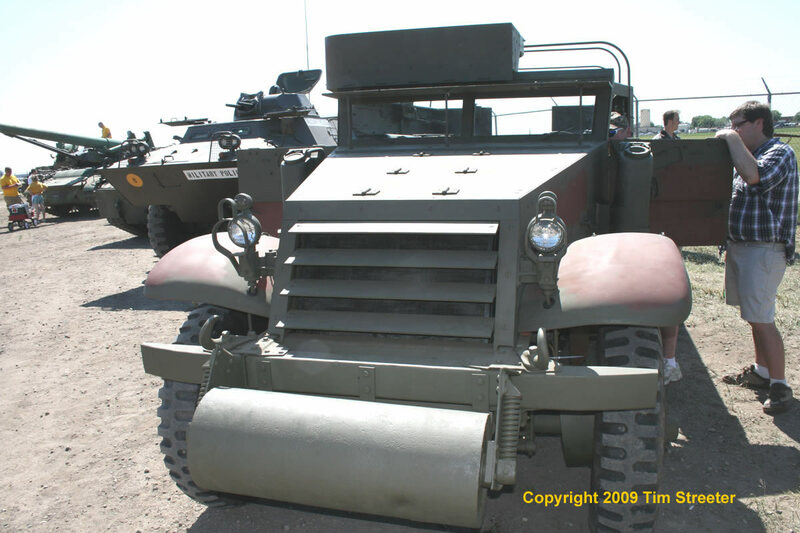 Tamiya's renditions of the M3A2 (which never went into production, but which can be easily adapted to the M3 or M3A1 versions), the M16 machine gun motor carriage, and the M21 mortar carrier all needed a bit of TLC to bring them up to snuff, but could be turned into respectable facsimilies. 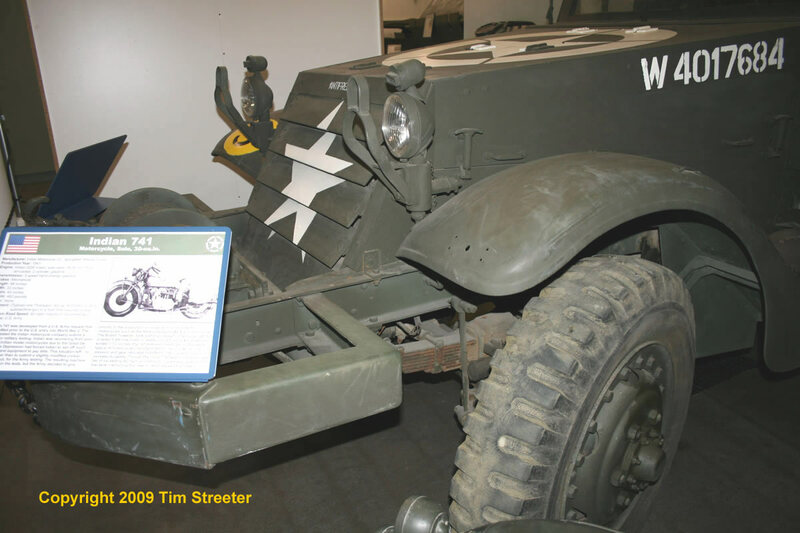 Given that this vehicle was the workhorse of the U.S. military throughout WWII, it's surprising that it has taken so long for it to receive the attention it deserves. 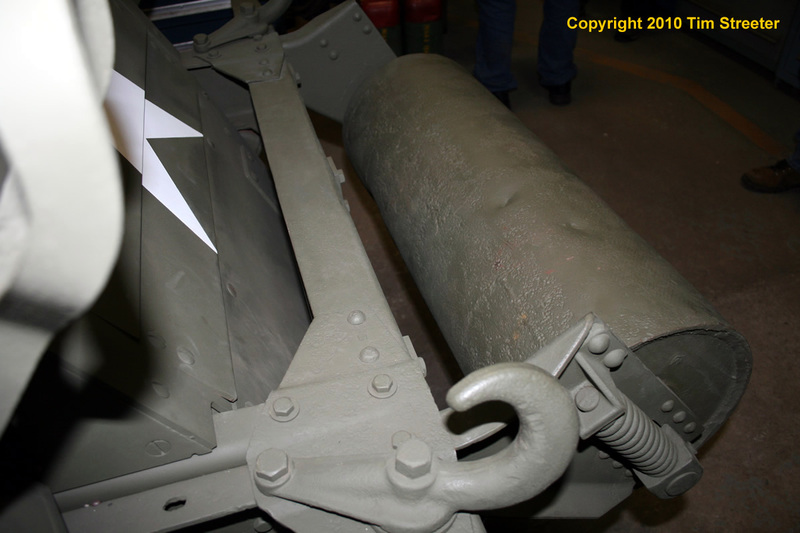 Then again, the lack of a balkenkreuz or large phallic barrel probably has had a lot to do with it. 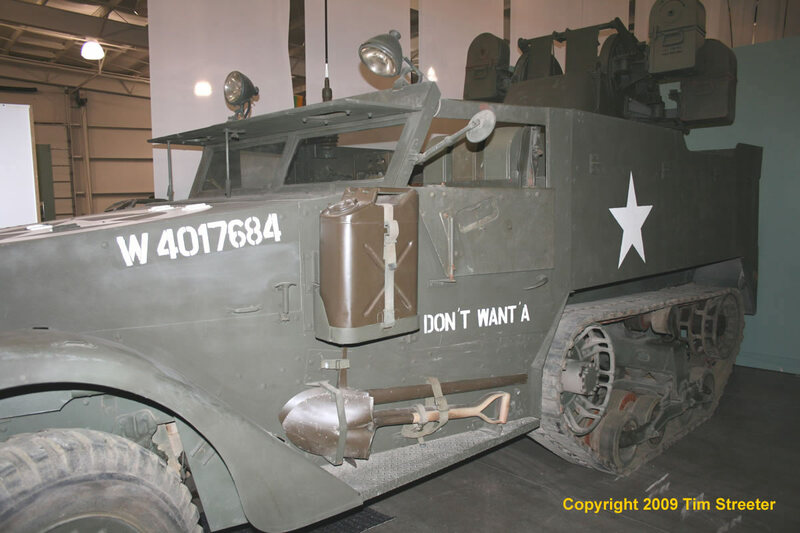 Fortunately, that all changed in 2006, when DML released its M2/M2A1 half-track. 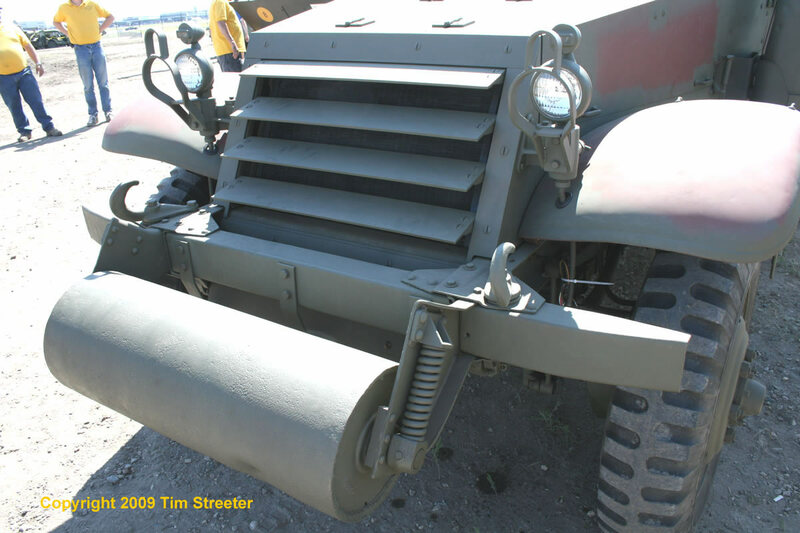 You can model this style half-track from Tamiya's M3A2 kit and Verlinden Production's update set by leaving off the machine gun pulpit. 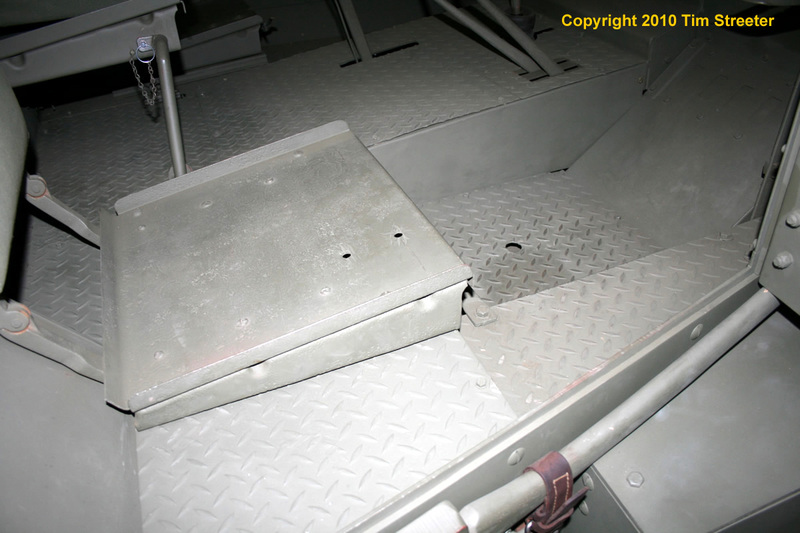 The VP set has the pedestal mount for the .50 mg that was bolted to the center of the floor just behind the front seats. 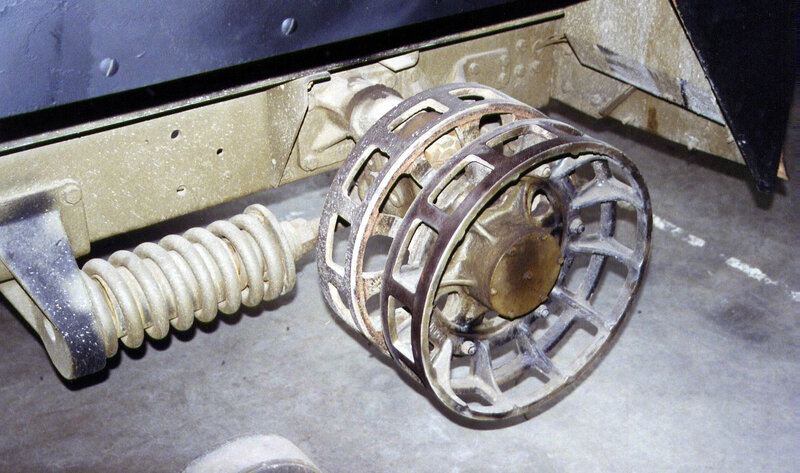 Both The Tank WorkShop and K59 make delicate resin sprocket and idler wheel sets that have the correct lightening holes to replace the solid Tamiya parts. 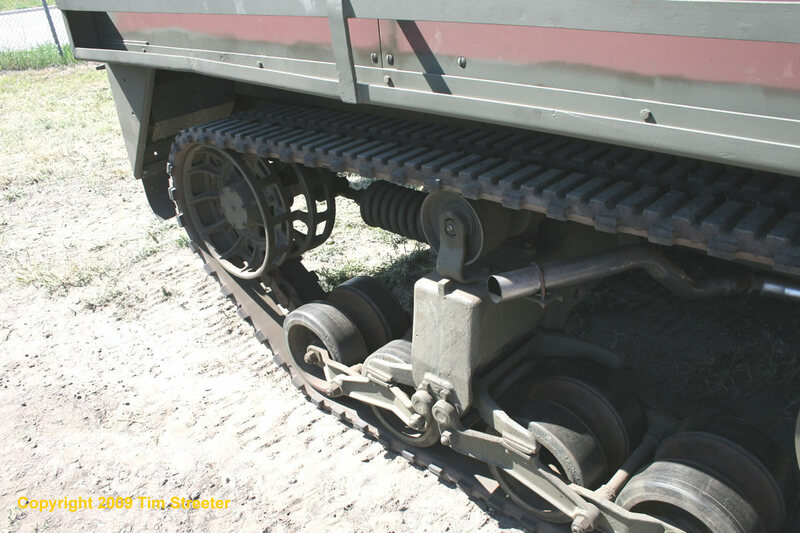 The Tank WorkShop's set includes new bogies and replacement resin track that is slightly more accurate than Tamiya's rubber band track, but the track teeth are too large for the wheel guides and resin tracks can be tricky to bend and manipulate, so it's your call. 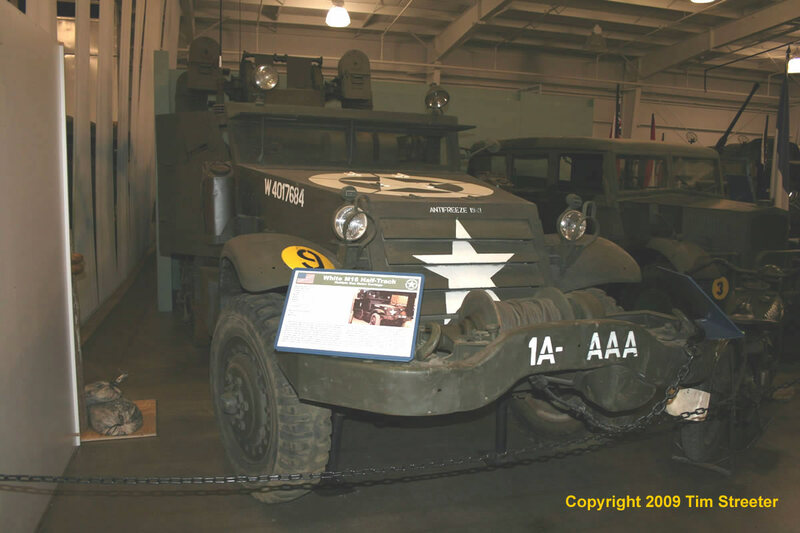 Be aware that the M3A2 half-track that Tamiya's model represents out of the box was only a prototype and never went into production. 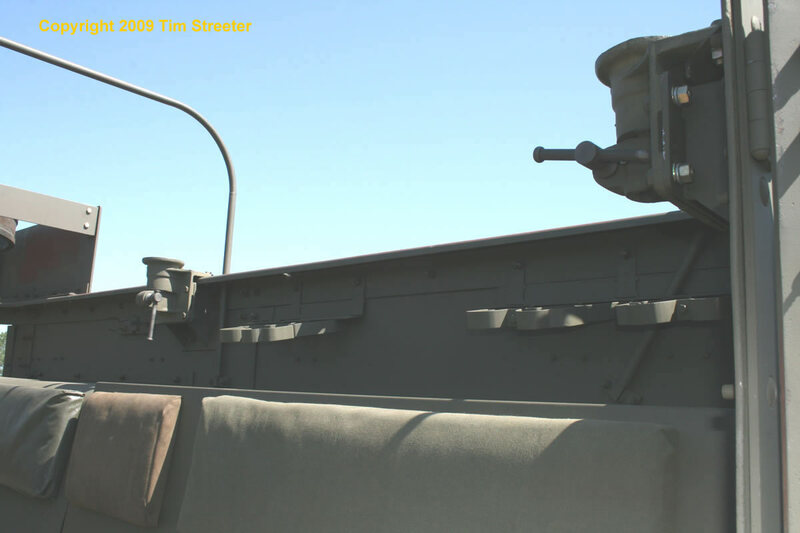 Richard Hunnicutt has written the definitive book on U.S. half-tracks, but Steve Zaloga' U.S. Half-track in Combat 1941-1945 from Concord will provide the essential information to get the best out of the Tamiya kit. 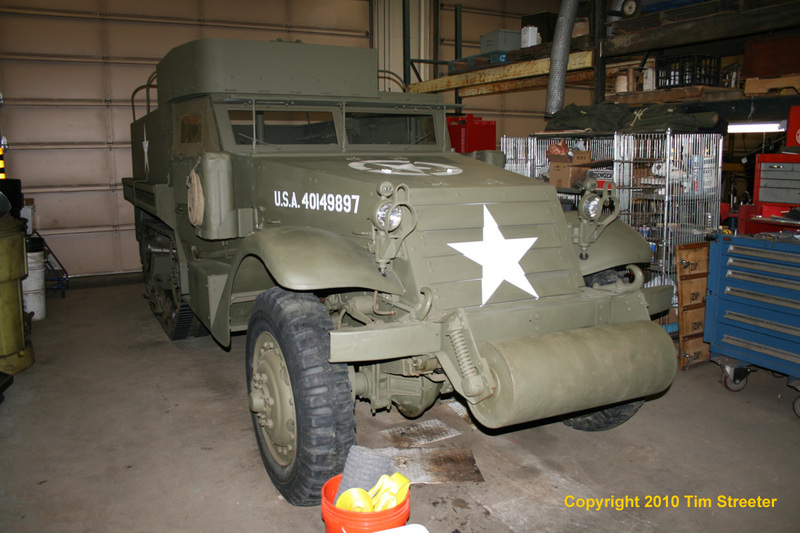 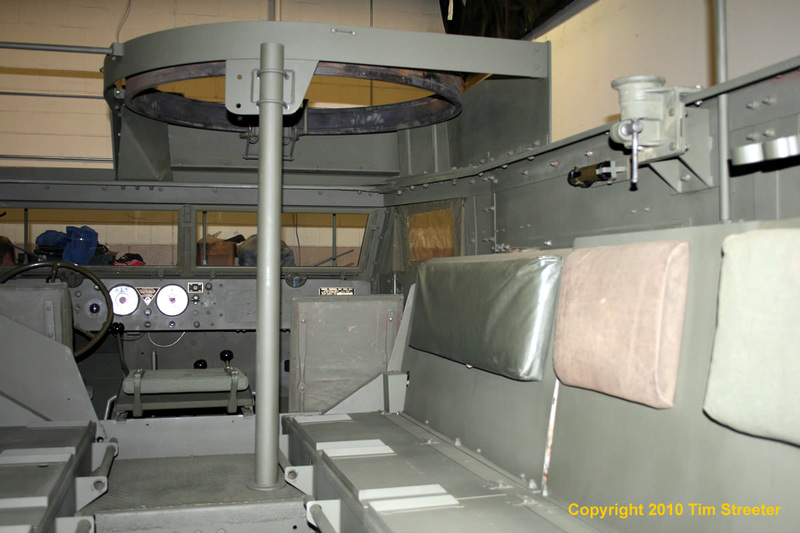 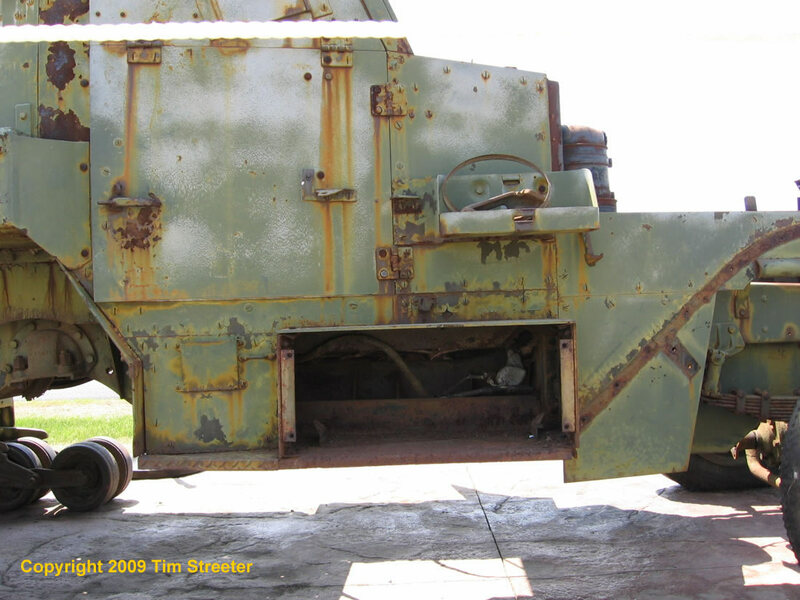 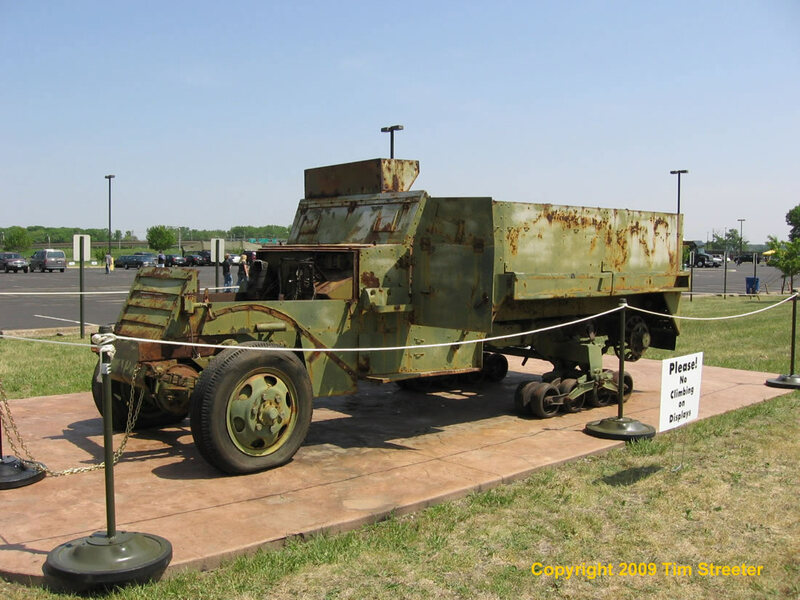 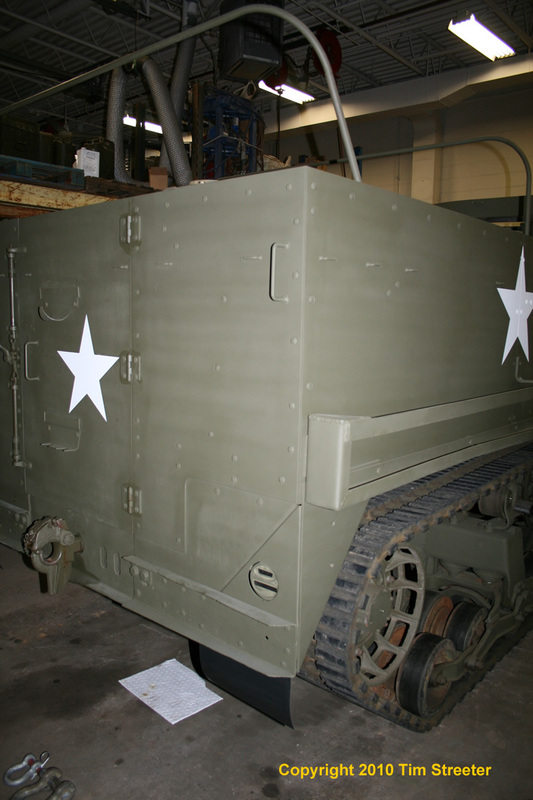 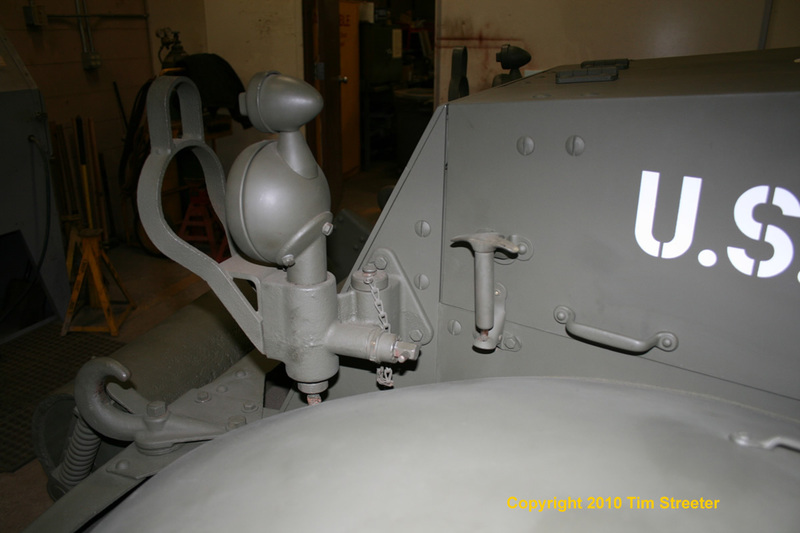 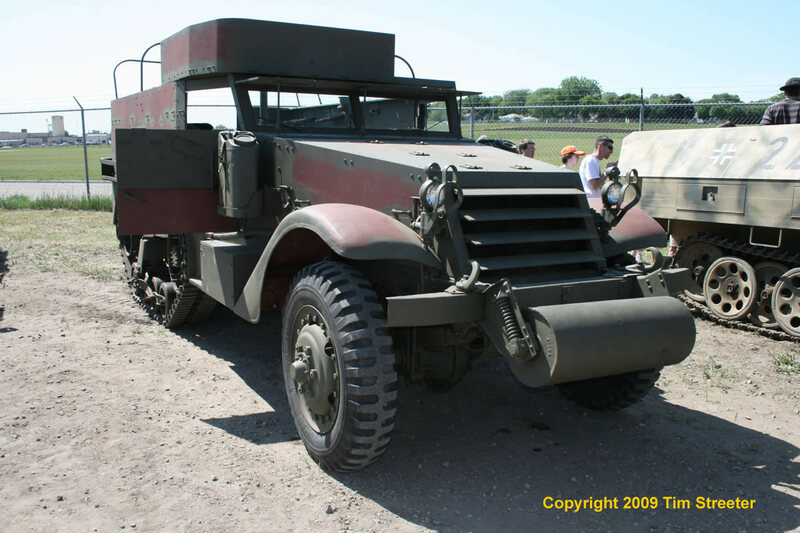 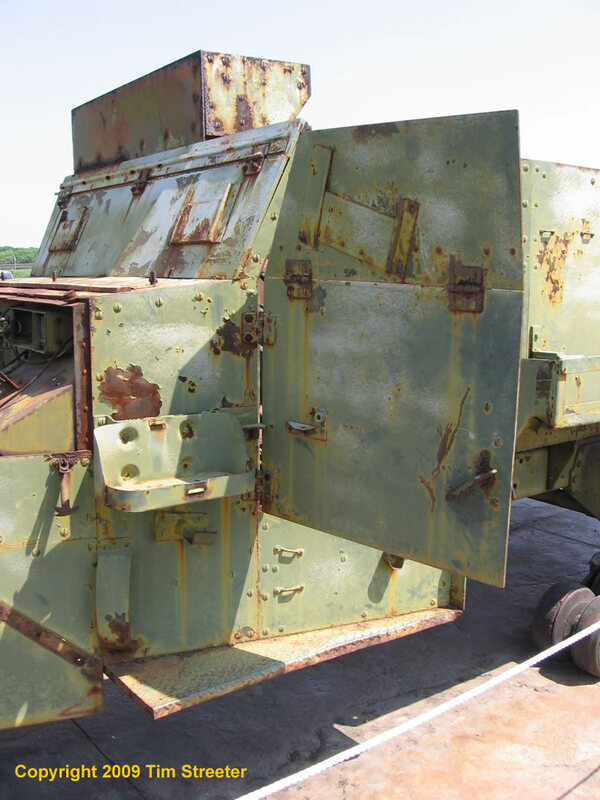 This next M3A1 was nearing completion of its restoration in the summer of 2009 when it was on dispaly at the Fort Snelling Military Expo. 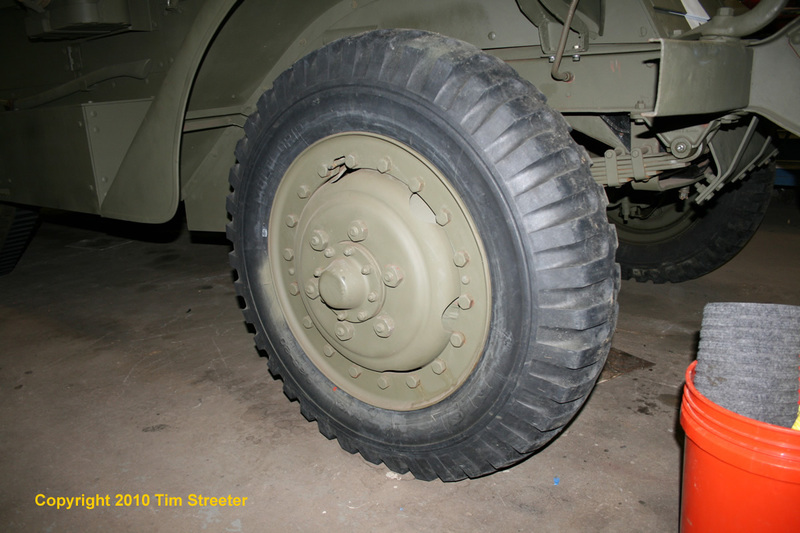 I was told that the red oxide color of the new primer is identical to what was found underneath the original paint. 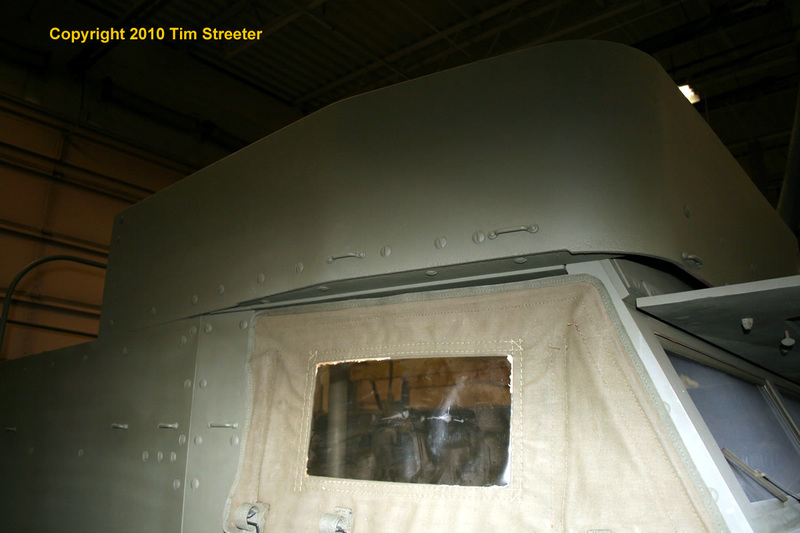 I was invited back to the museum in January 2010 when the reconstruction was completed. 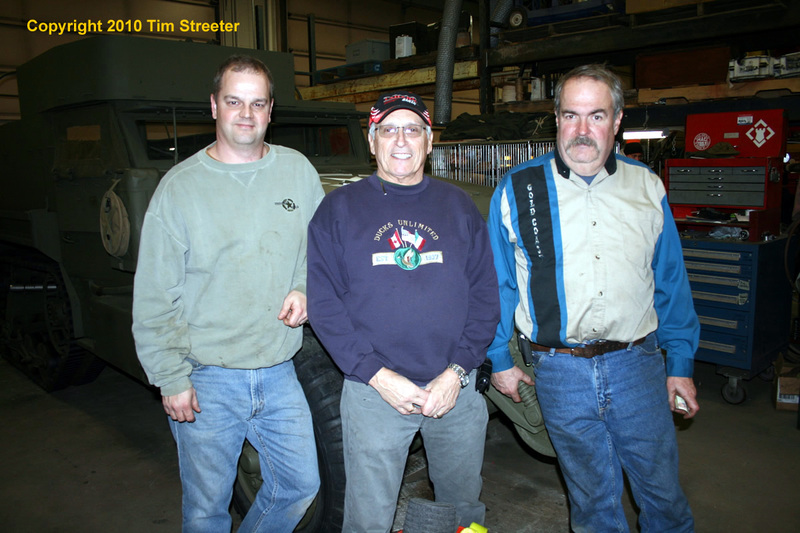 Art Hubbard (center below, with main refurb crew Ian Carter and Ken Emme) estimates more than 3,000 hours were put into bringing this vehicle back to life. 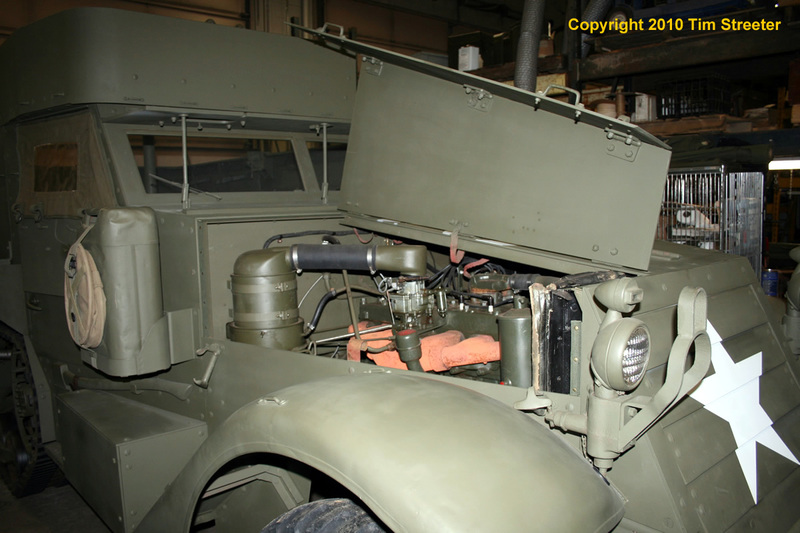 The majority of it came from a Diamond T manufactured in November 1943 and two donors seen at the bottom of this page. 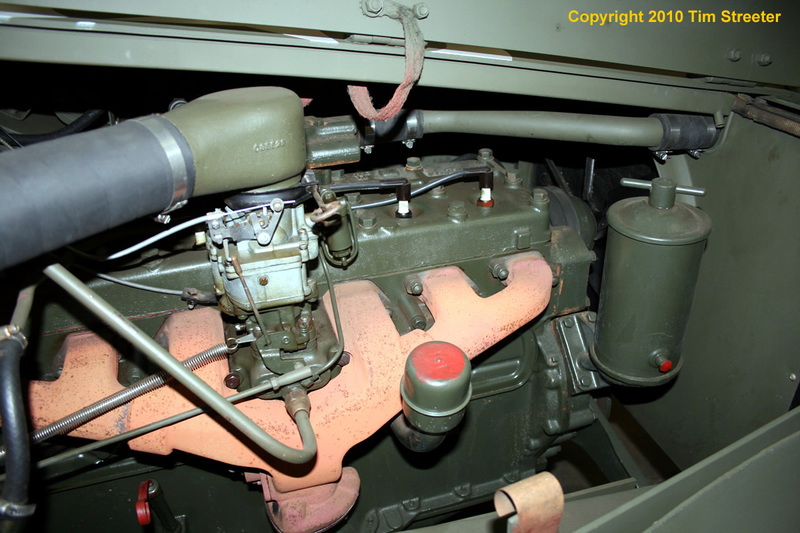 The engine was rebuilt in France after the war and eventually shipped back to the states. 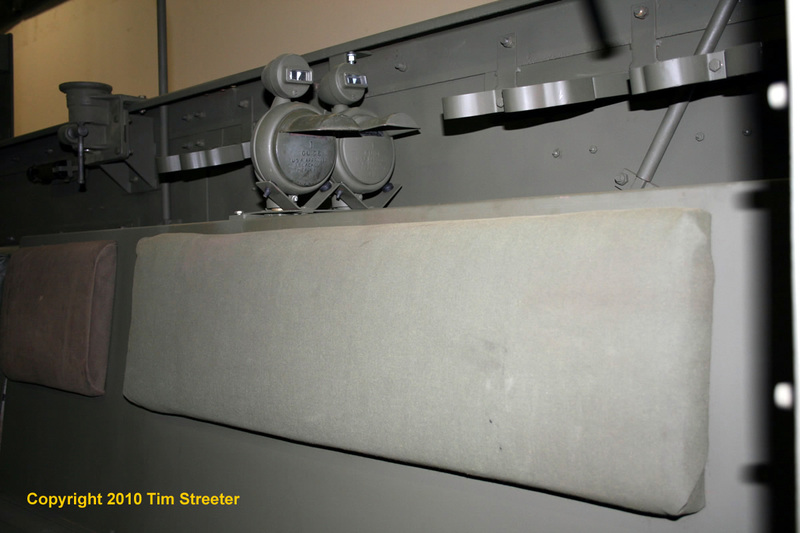 When the museum received it more than 50 years later, it was still wrapped in its post-war packaging "cocoon." 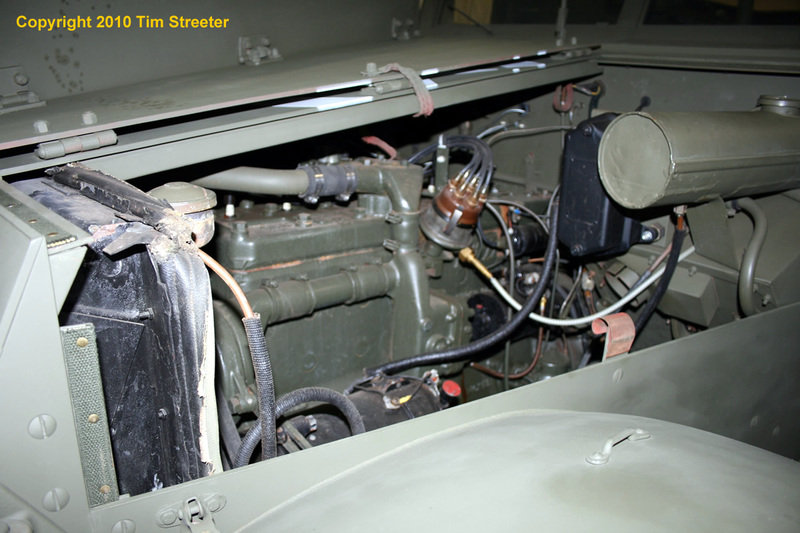 After easing it into the engine bay and making all the necessary connections, they figured it would require some additional attention before they would be able to get it running, but they started it up on a whim. 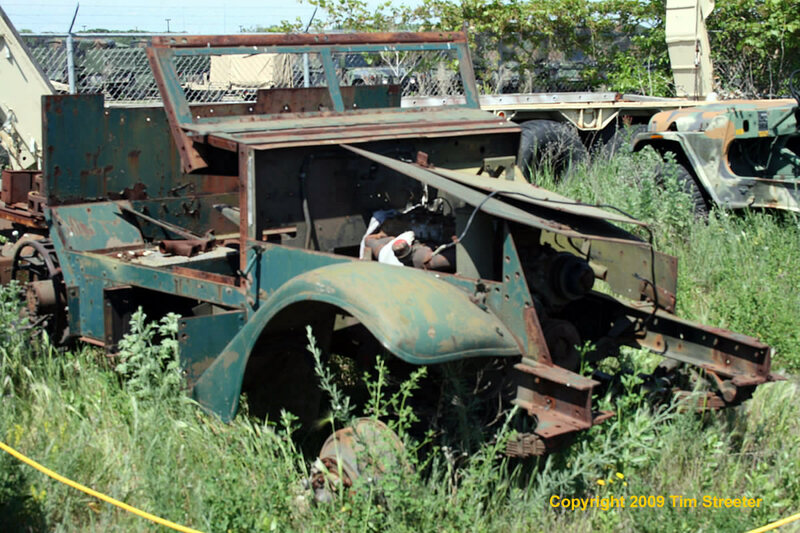 After giving it some gas, it turned over as if not a day had passed since 1943. 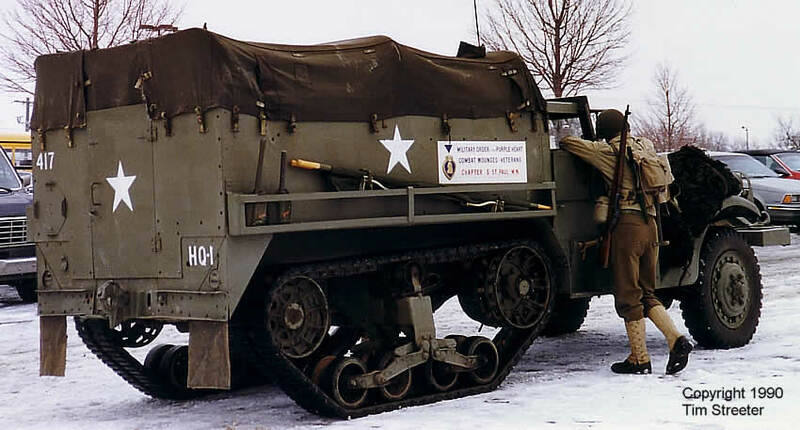 The men were speechless. 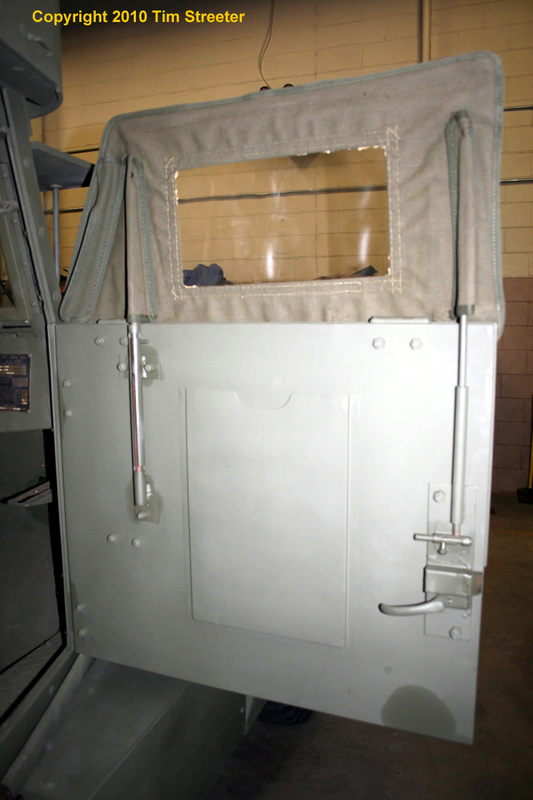 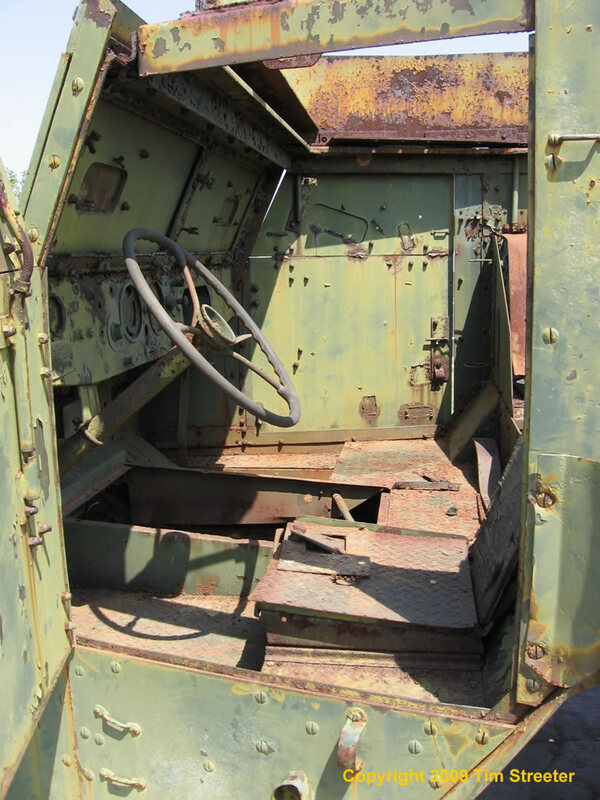 Moving to the insides of the vehicle, we can see details of the cab area. 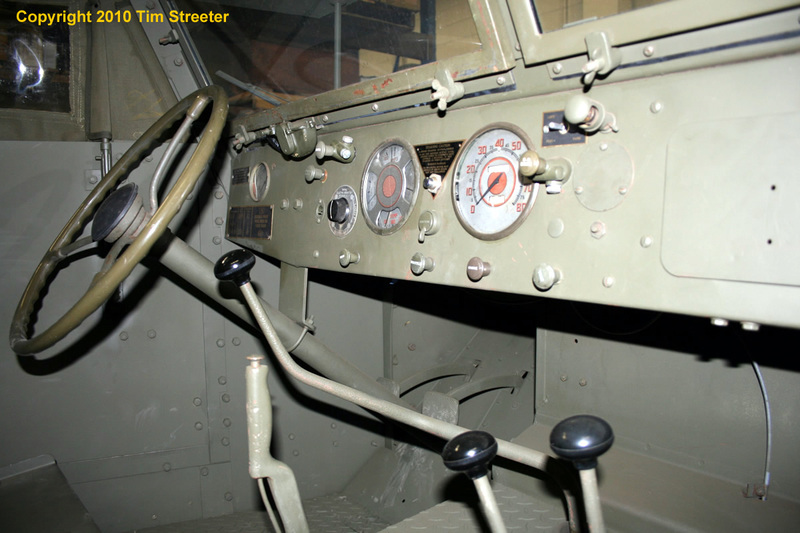 All of the gauges are in working order. 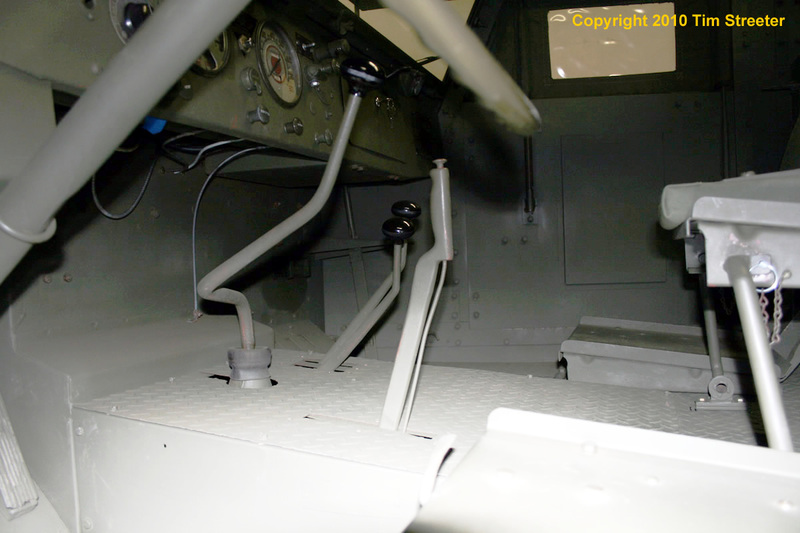 Of note is the lever spanning the floor and firewall on the front passenger side, used to open or close the louvers on the engine grill. 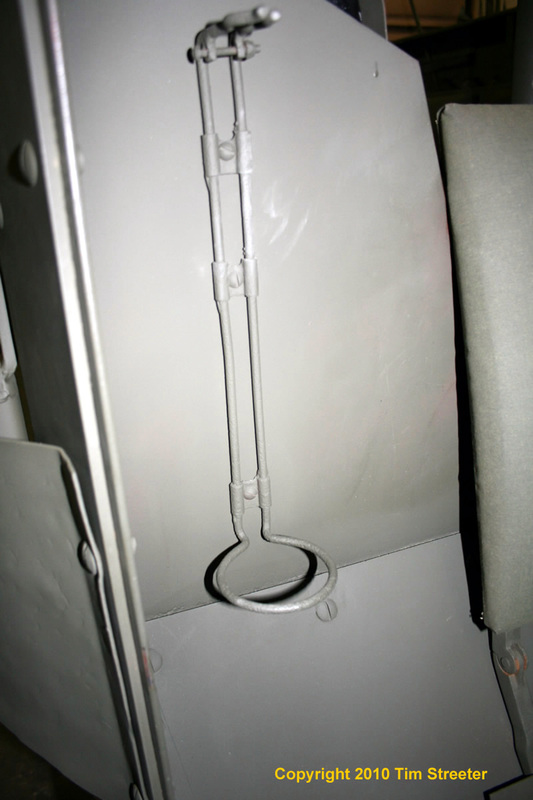 There is a mounting for a fire extinguisher next to the passenger seat. 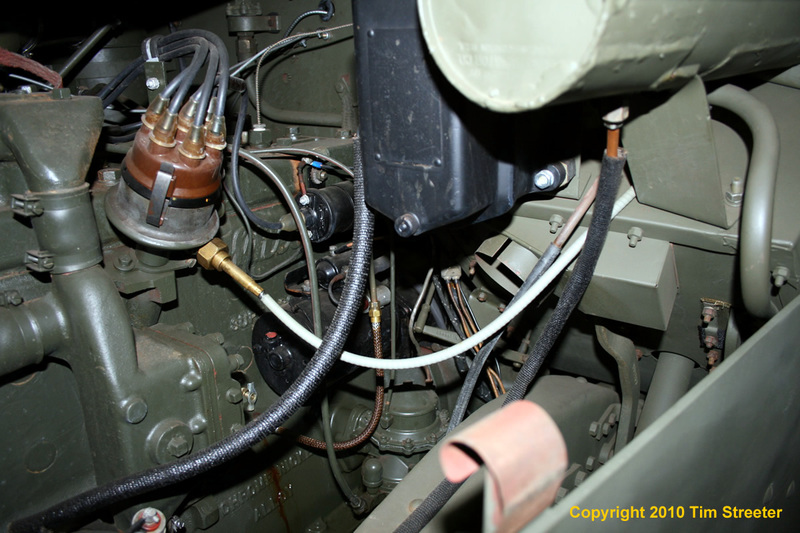 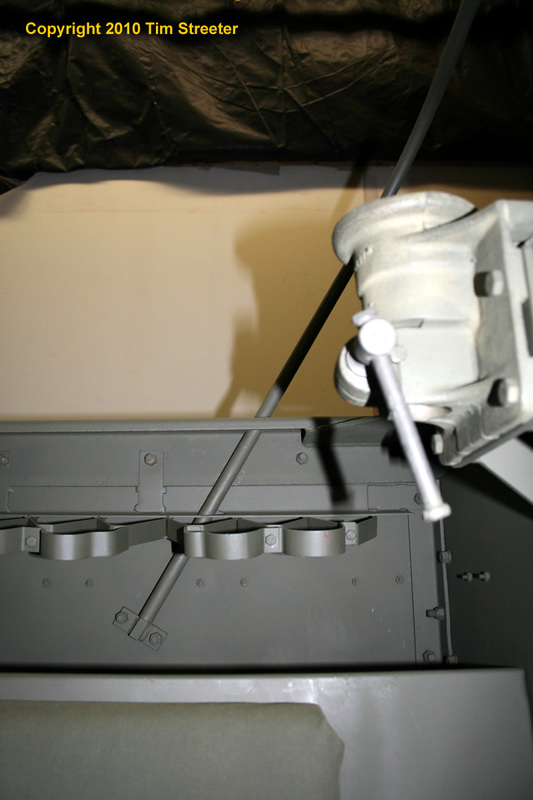 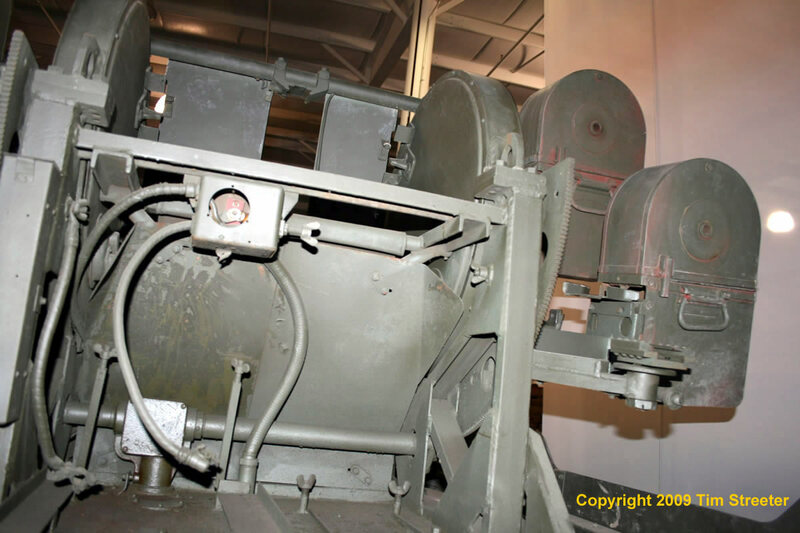 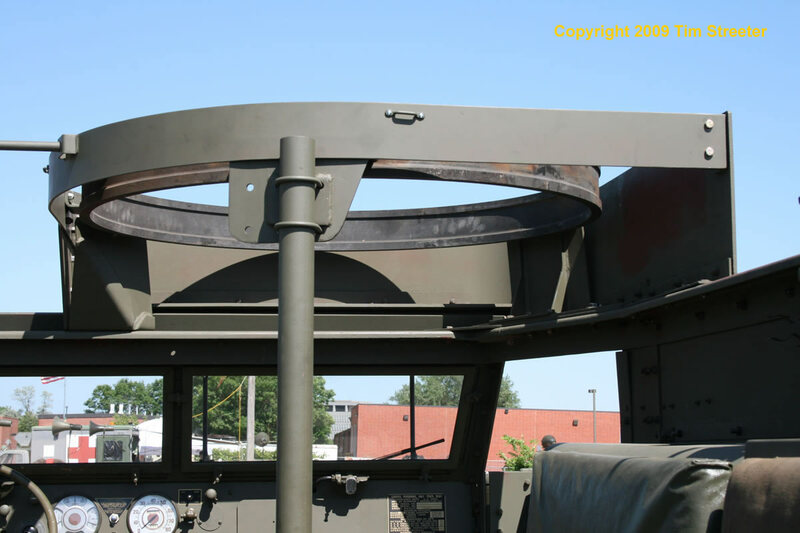 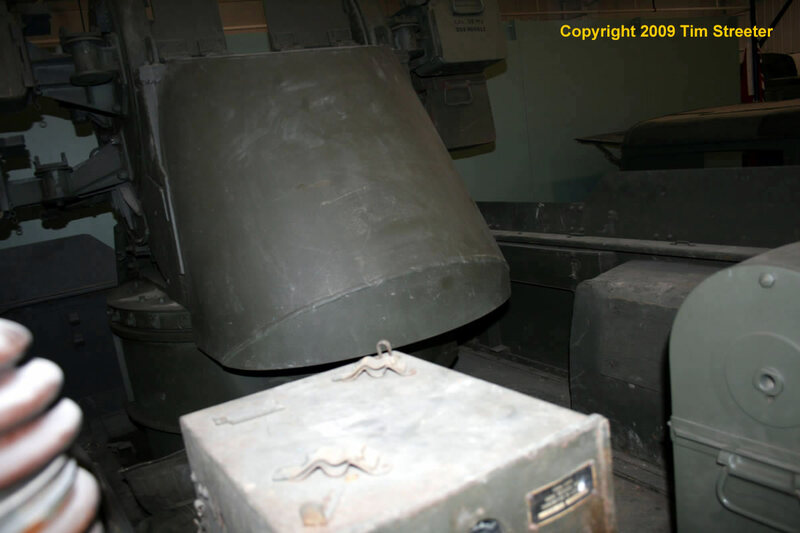 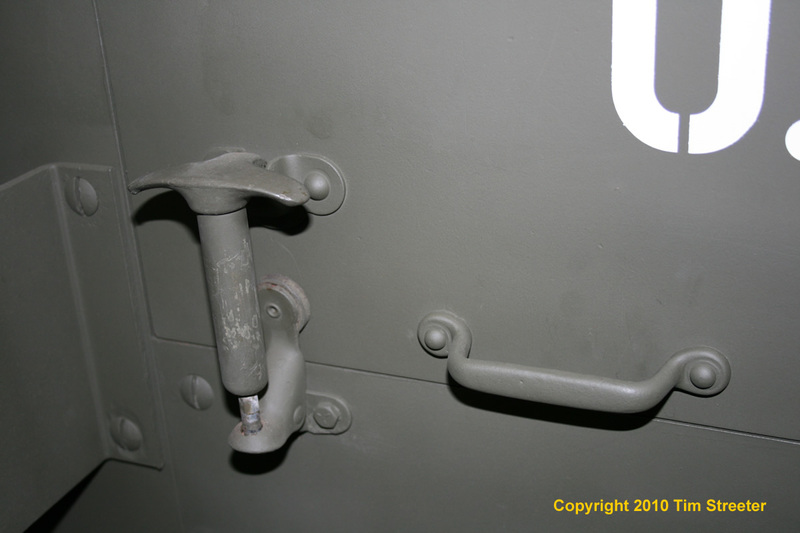 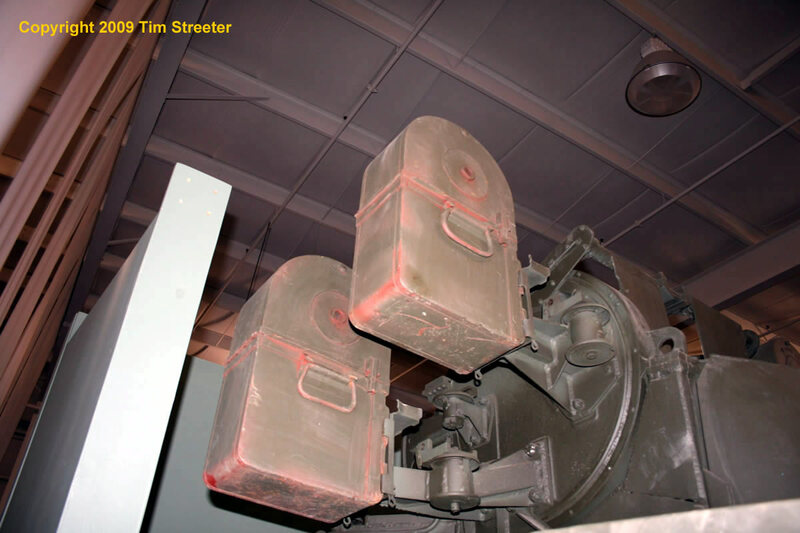 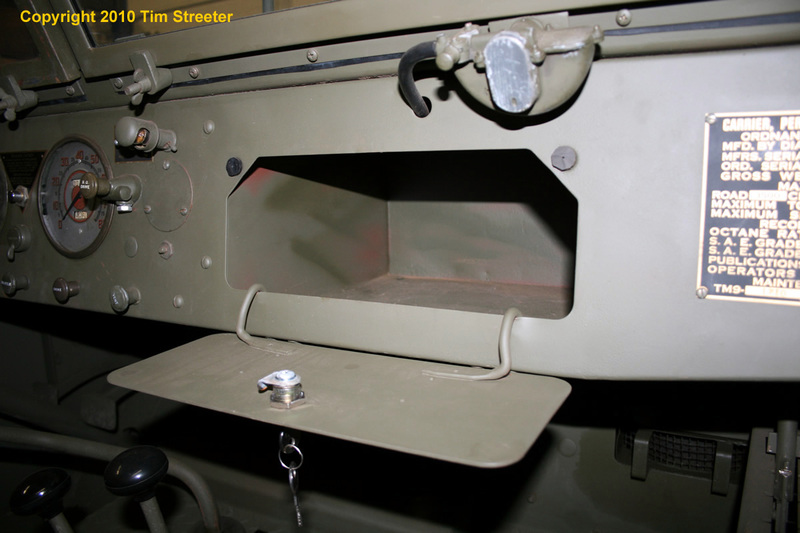 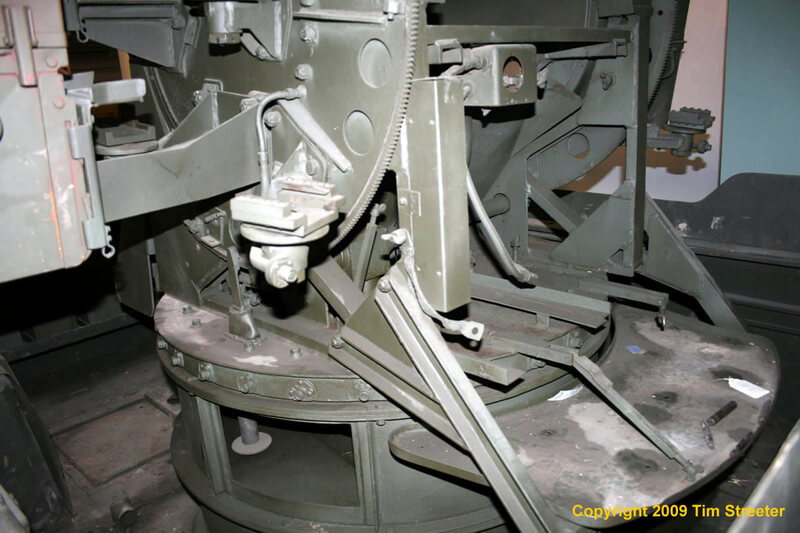 Here are several views of the pulpit and ring mount for the .50 machine gun. 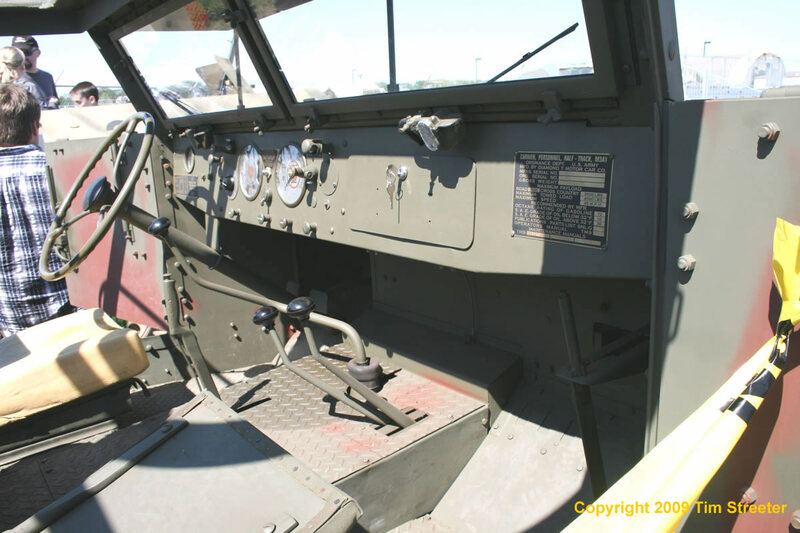 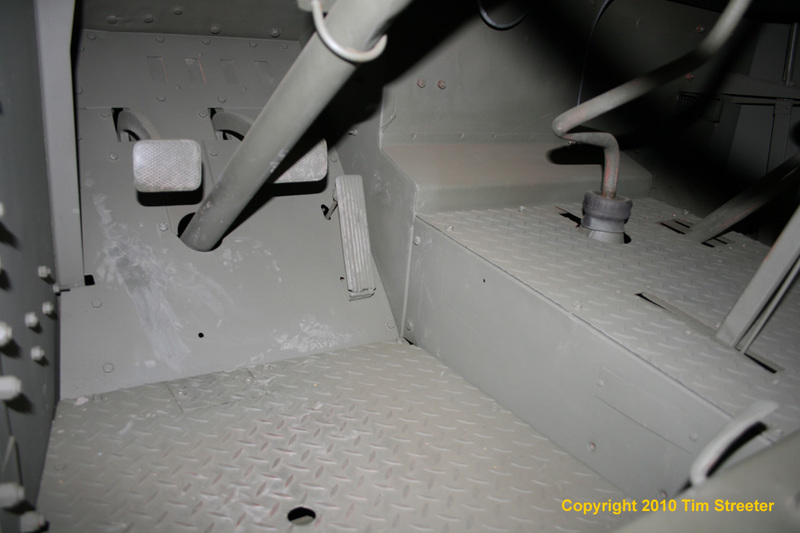 From the cab, we look backward into the crew compartment, then open the rear door and survey the compartment looking forward. 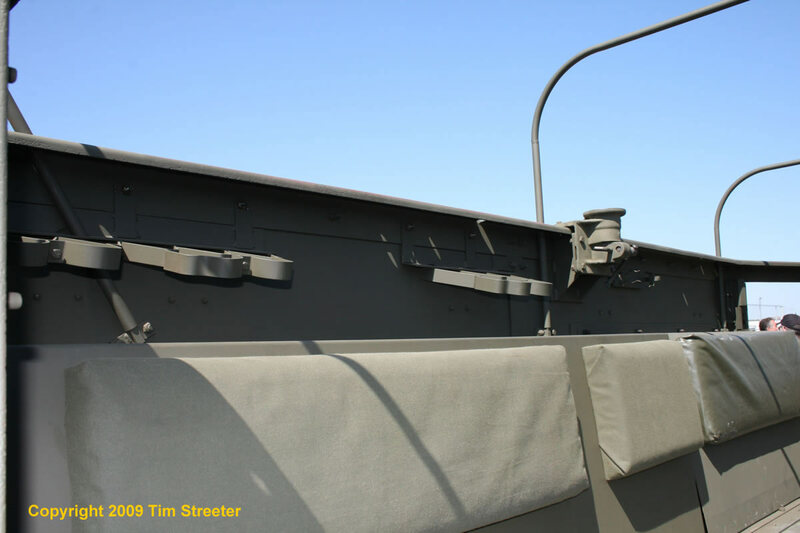 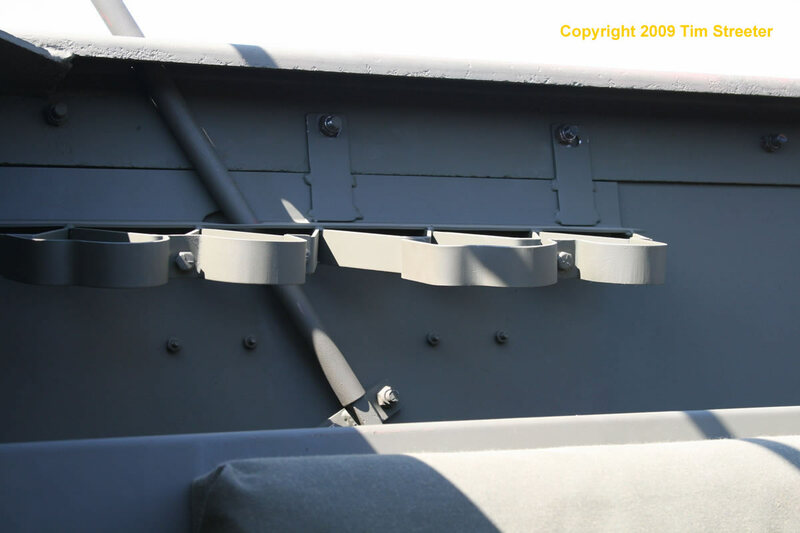 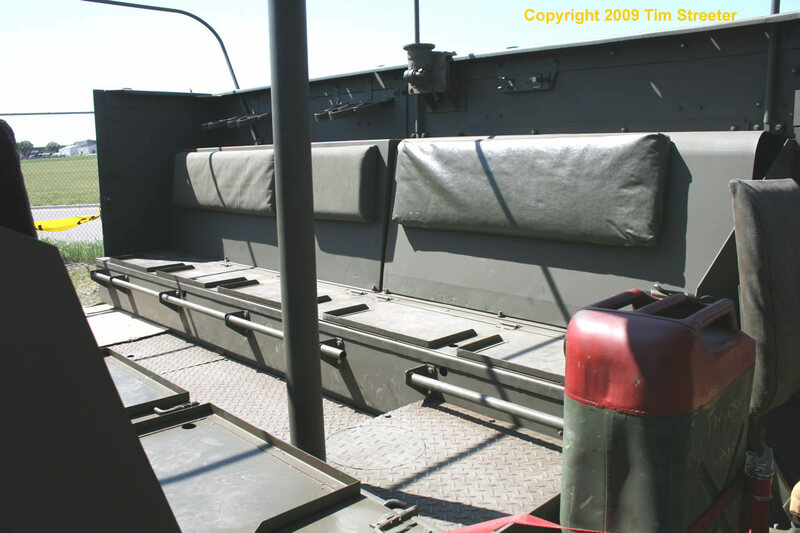 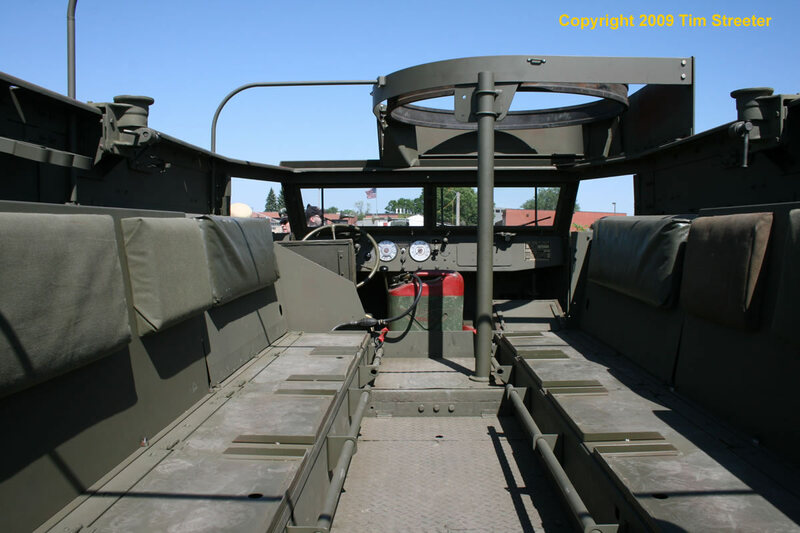 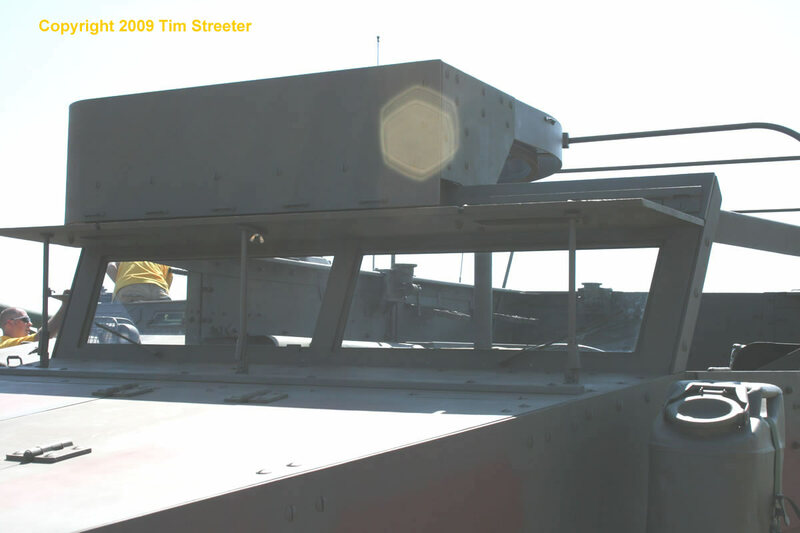 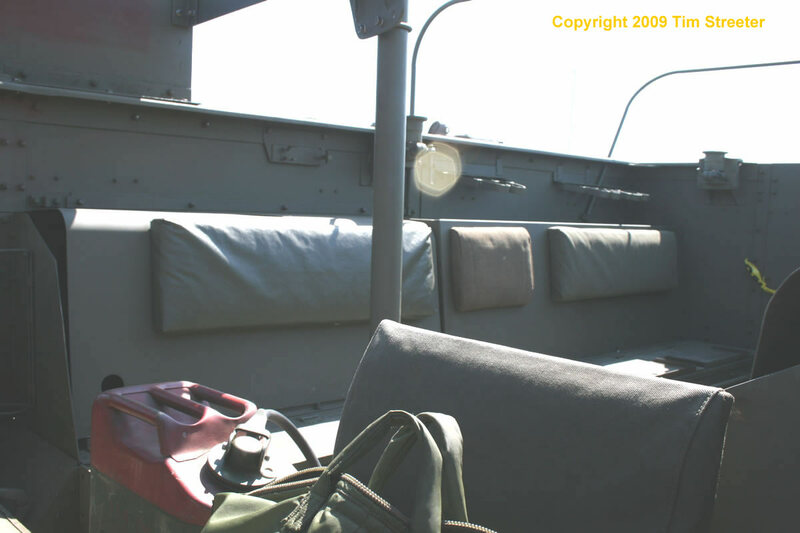 Note the mounts for the .30 cal machine guns, the stowed blackout lights, the stowage area beneath the bench, and how the rear bow for the tarp is angled into its moorings on the side walls. 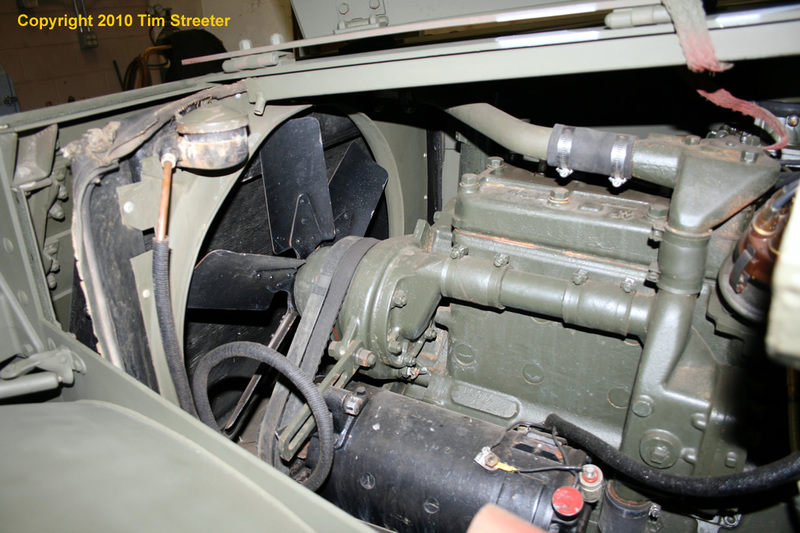 Concluding our walkaround, we get a some good views of the pristine engine from the left and then right sides. 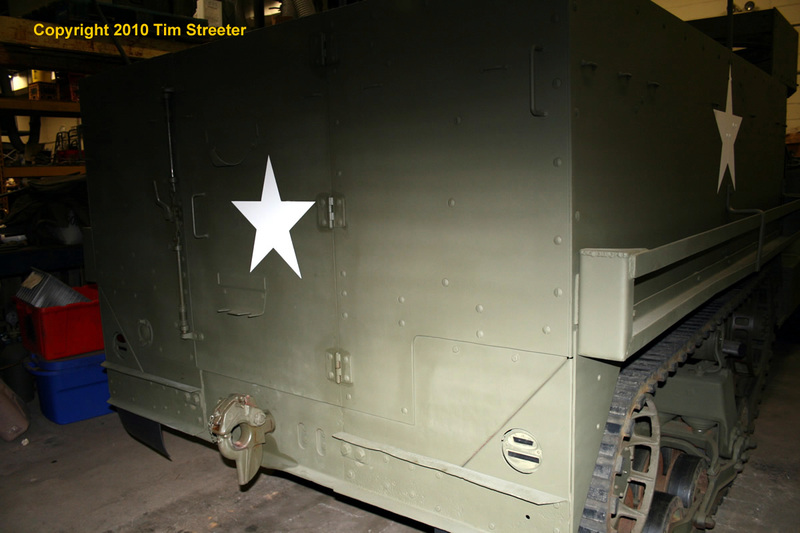 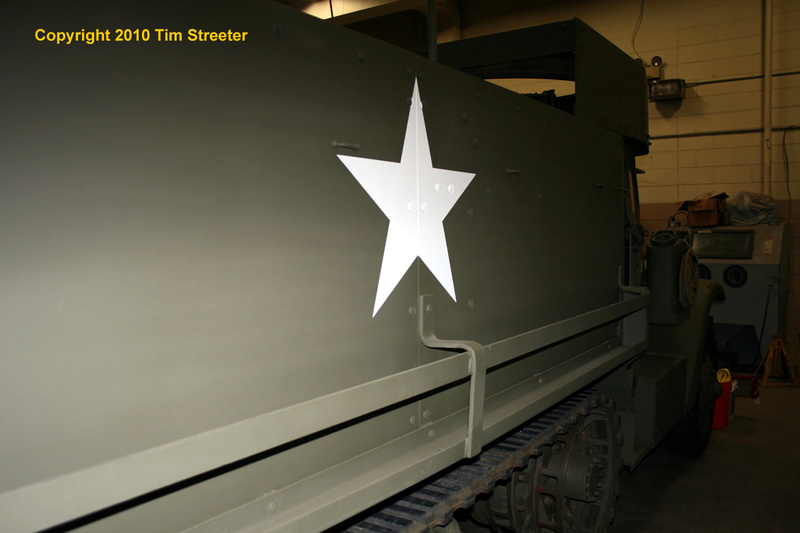 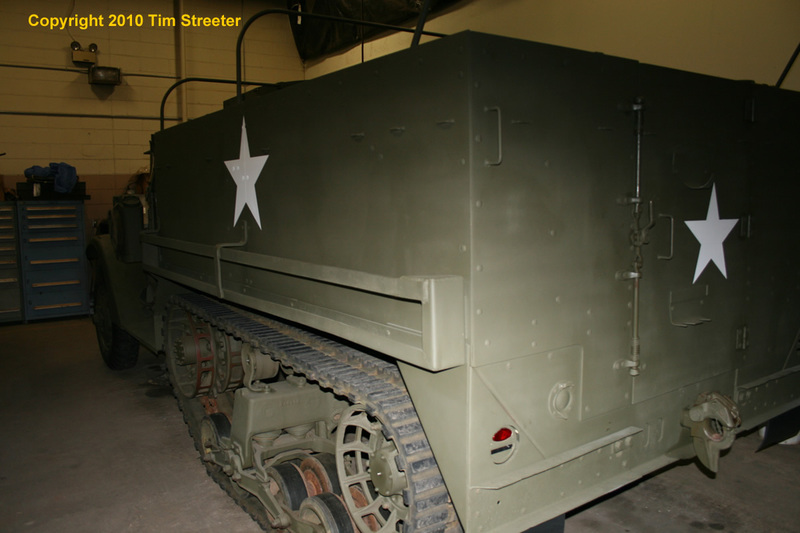 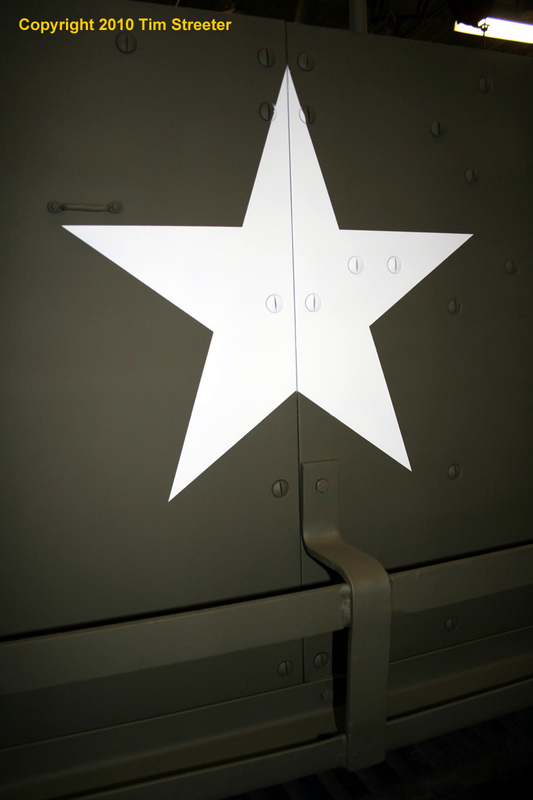 The Victory Museum is the home of M16 White half-track, built in 1944. 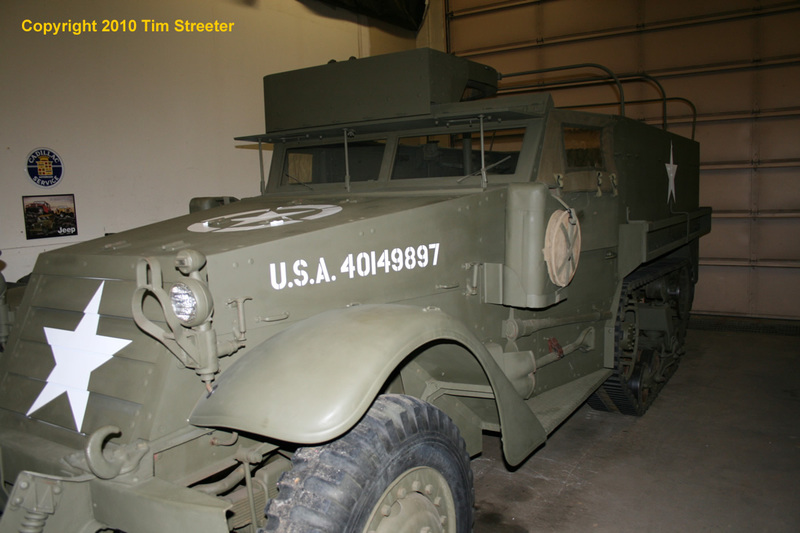 This was an adaptation of the M3 half-track, carrying carrying four Browning M2 .50 cal. 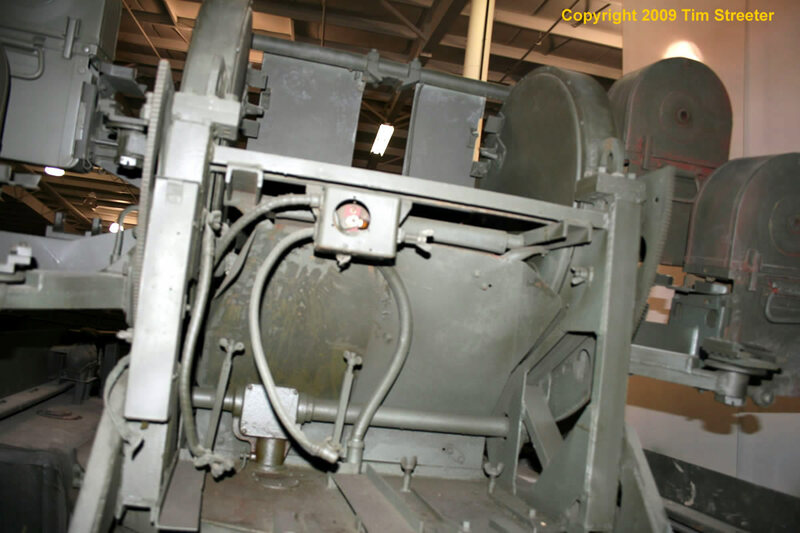 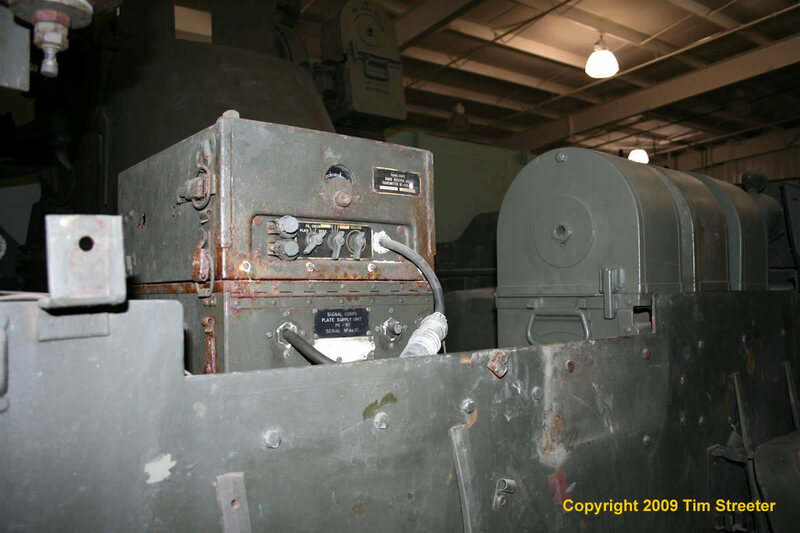 machine guns mounted in the M45 Mxson turret. 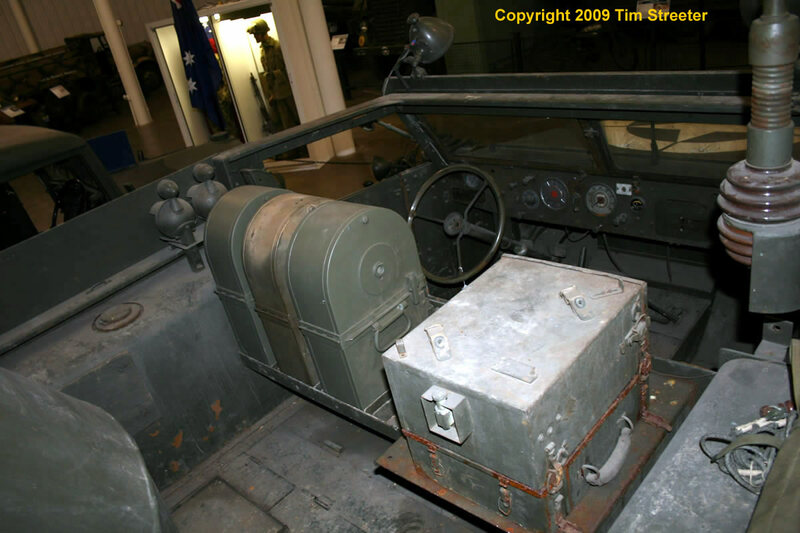 This vehicle is quite similar to the Tamiya M16 kit, including the SCR-609 radio. 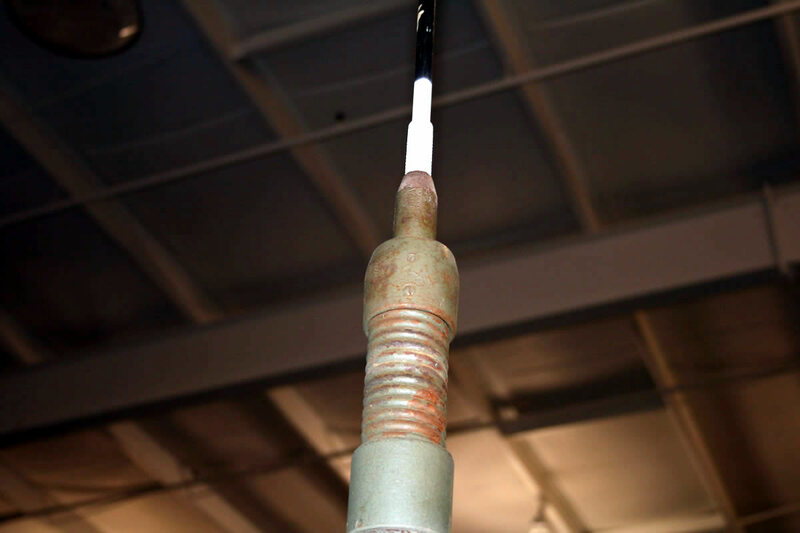 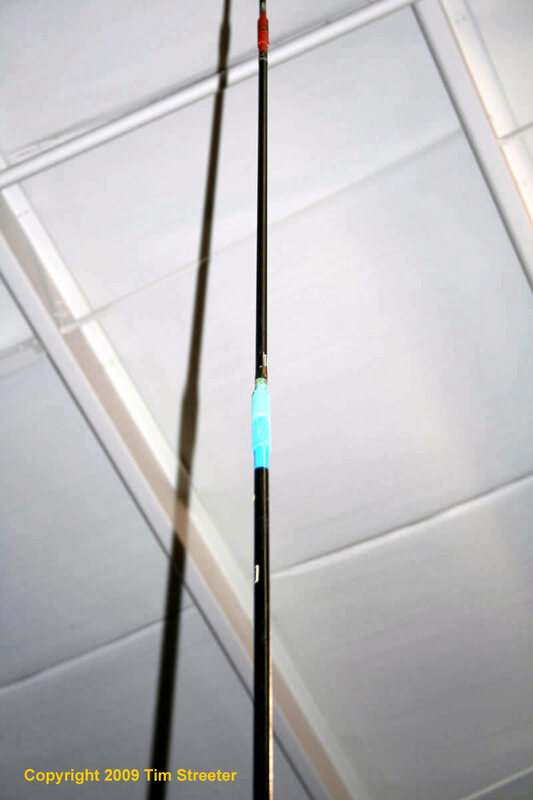 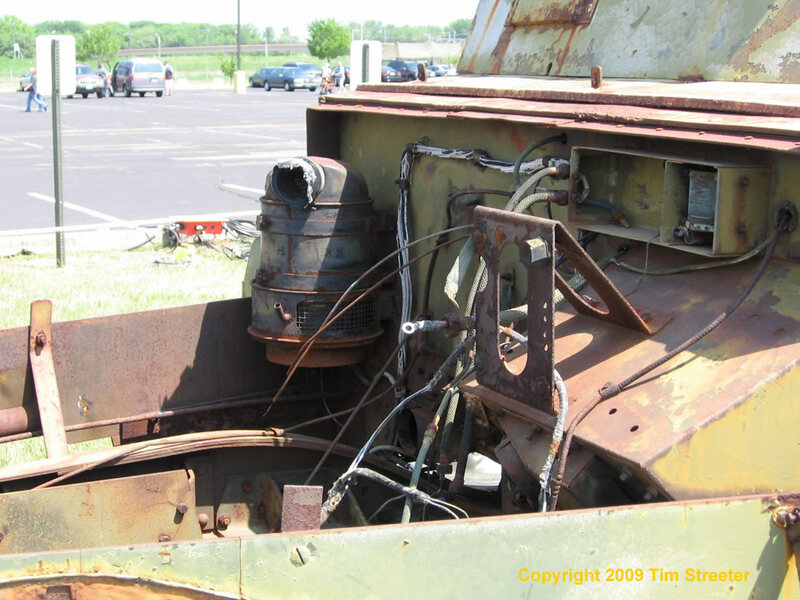 Of note is the antenna, showing the three 3' sections and color-coded junctions typical for this and other vehicle applications. 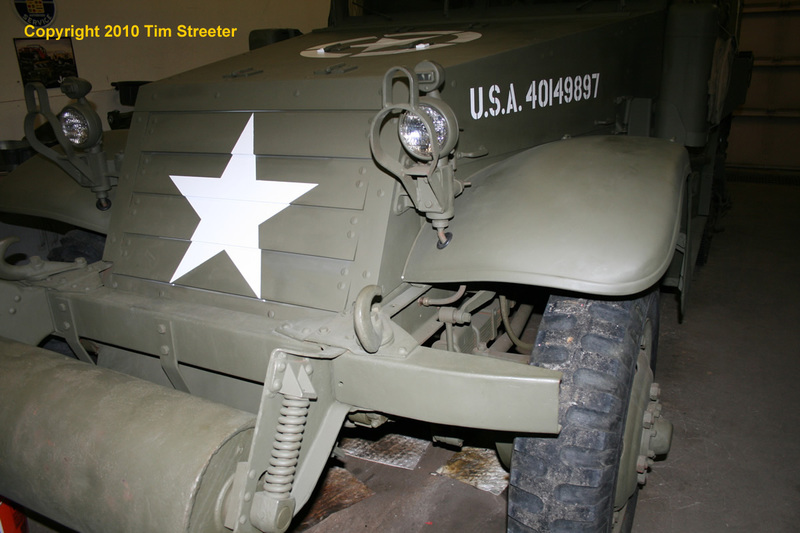 The vehicle typically had a crew of five. 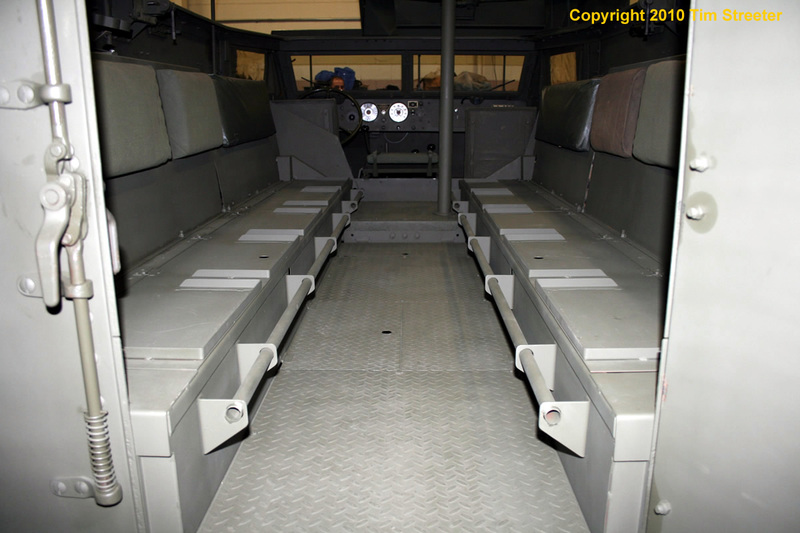 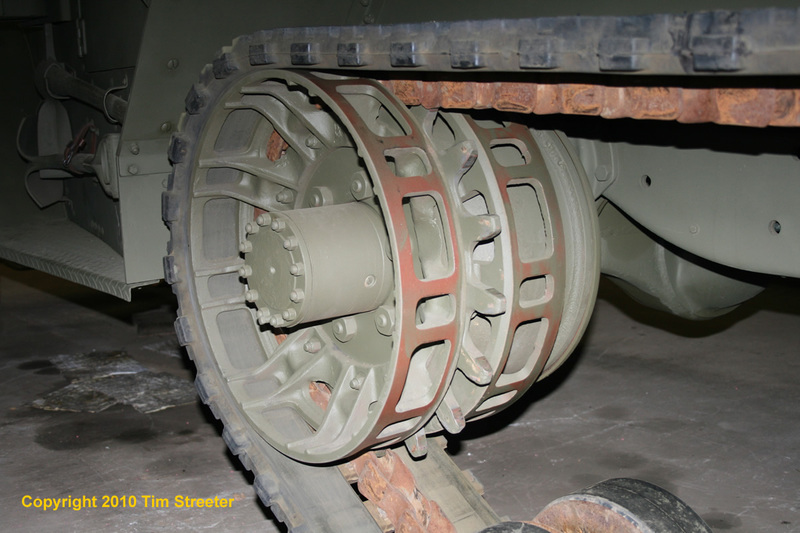 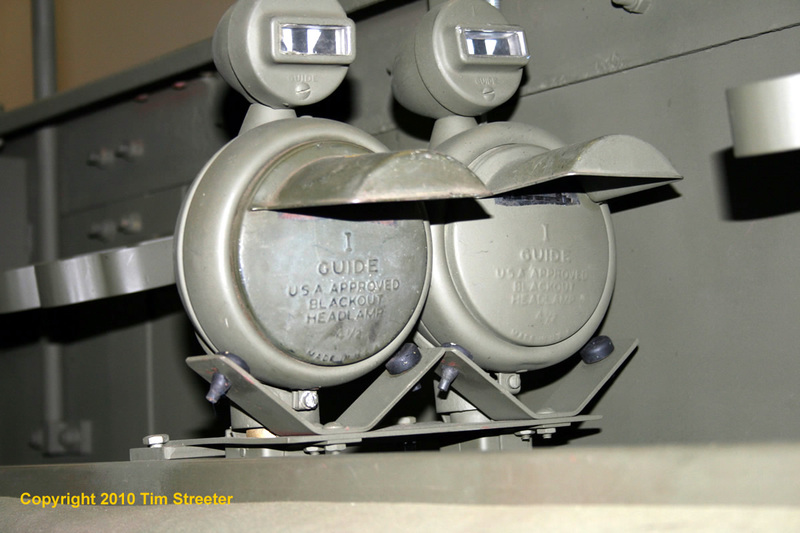 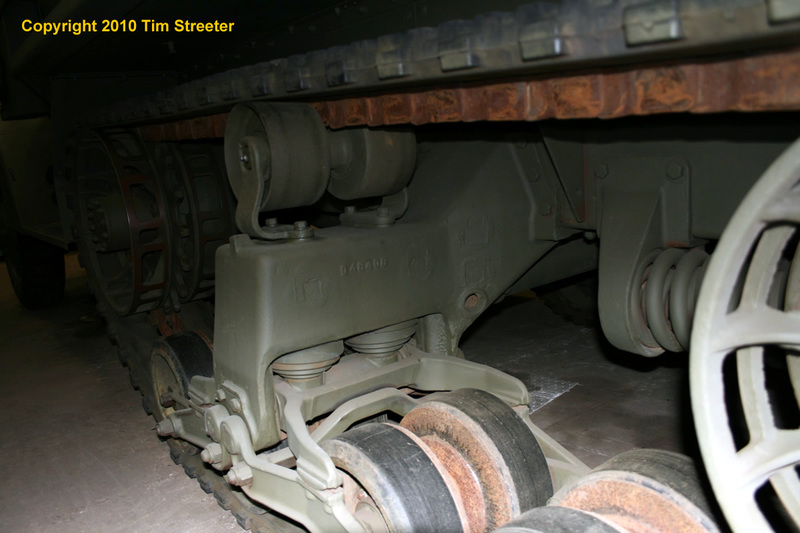 The next series of photos provided by Scott Taylor are of a mix of M2, M3A1, and M16 half-tracks . 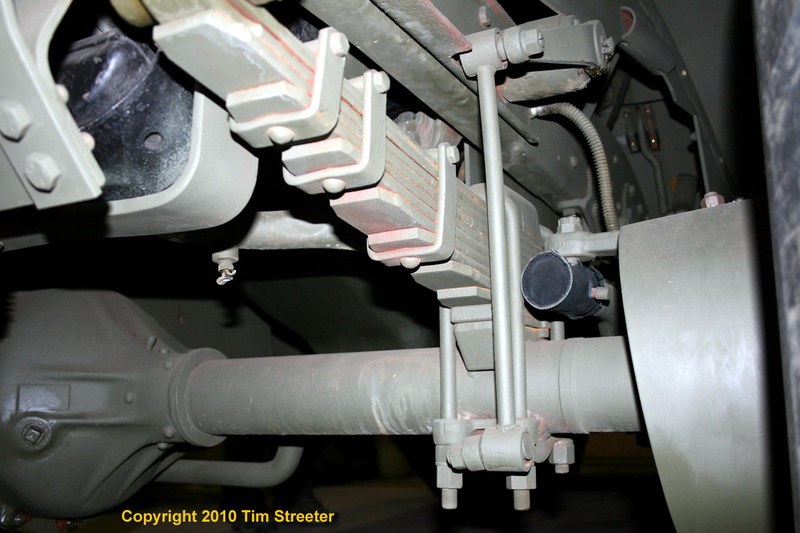 The focus here is on the suspension, which was shared among the different body variants. 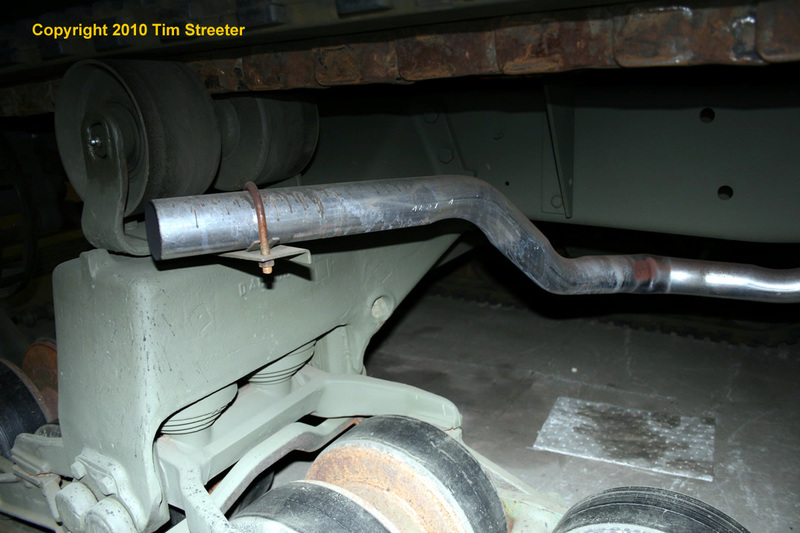 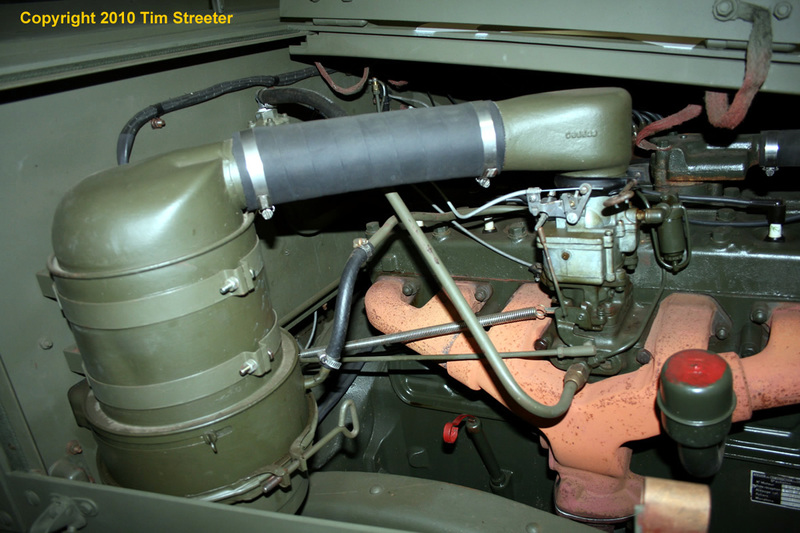 Photo #1 is an overall shot of the right side of an M2 (privately owned vehicle based in Michigan) that gives a good overall impression of the suspension, including the volute springs and the exhaust pipe location. 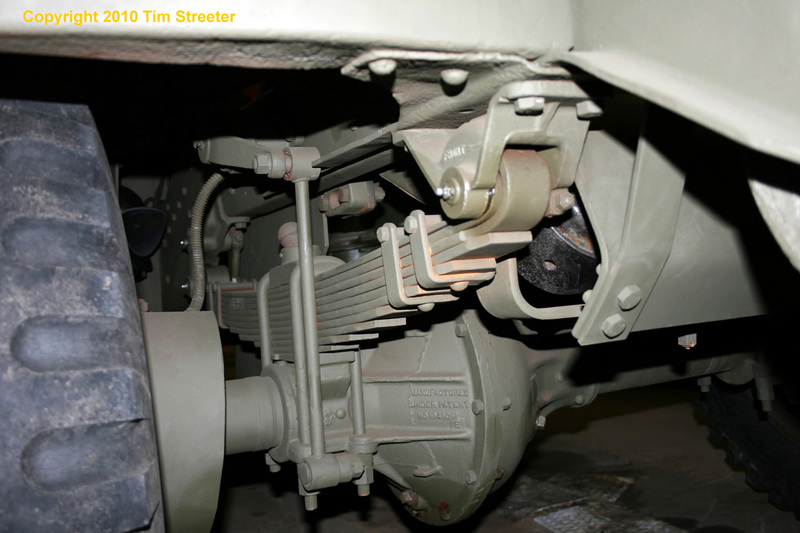 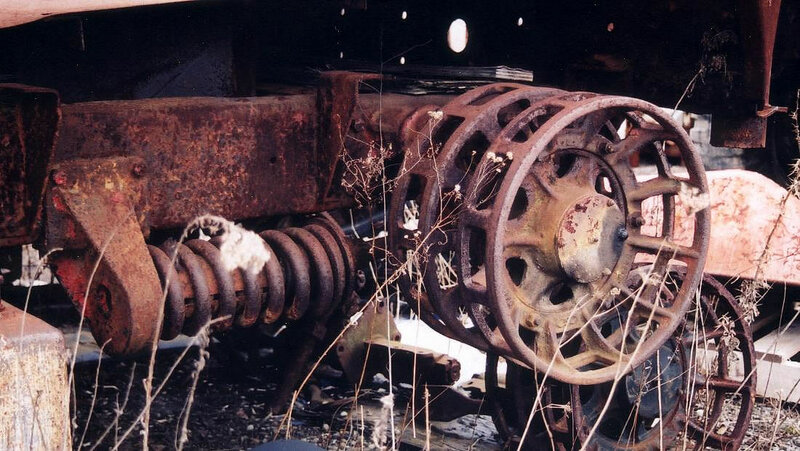 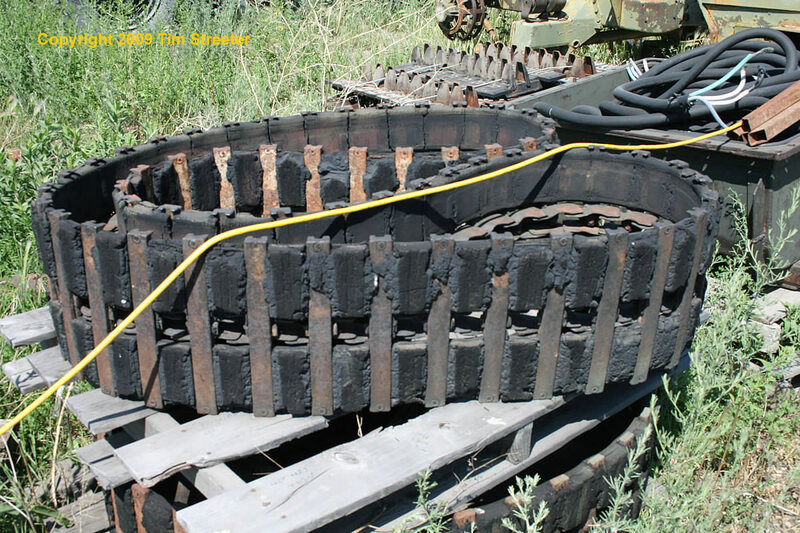 Photo #3 is of the same vehicle, showing the drive sprocket. 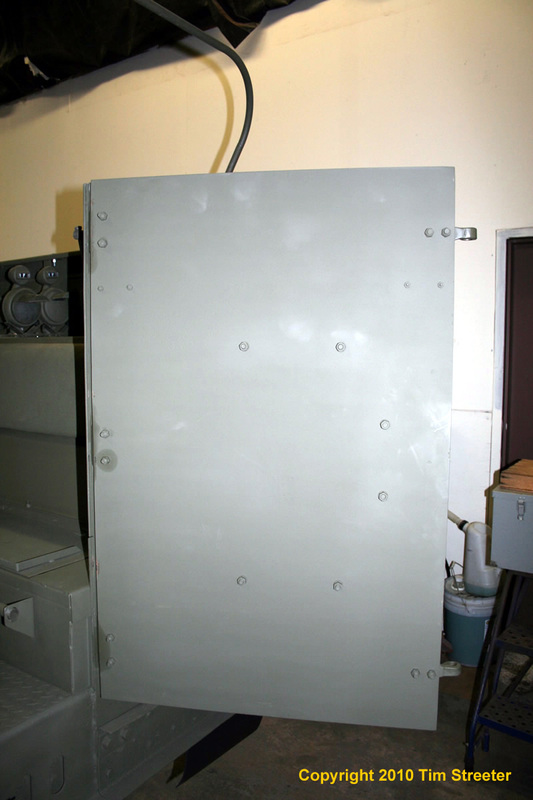 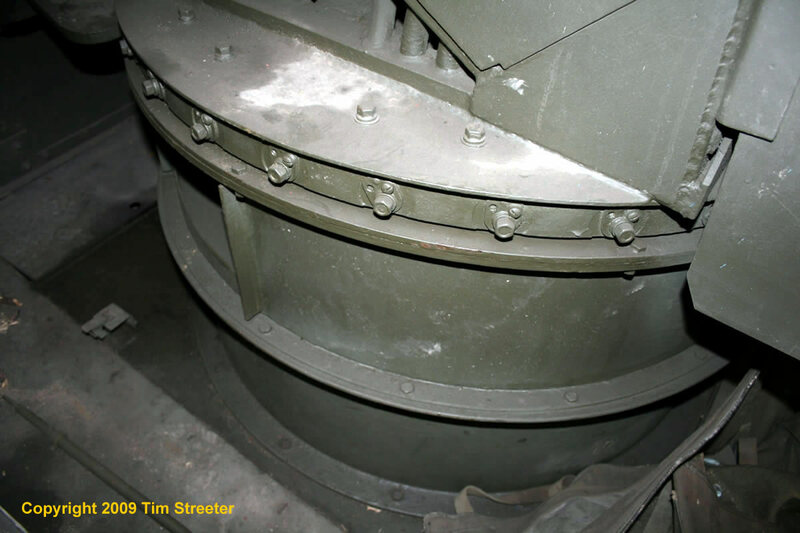 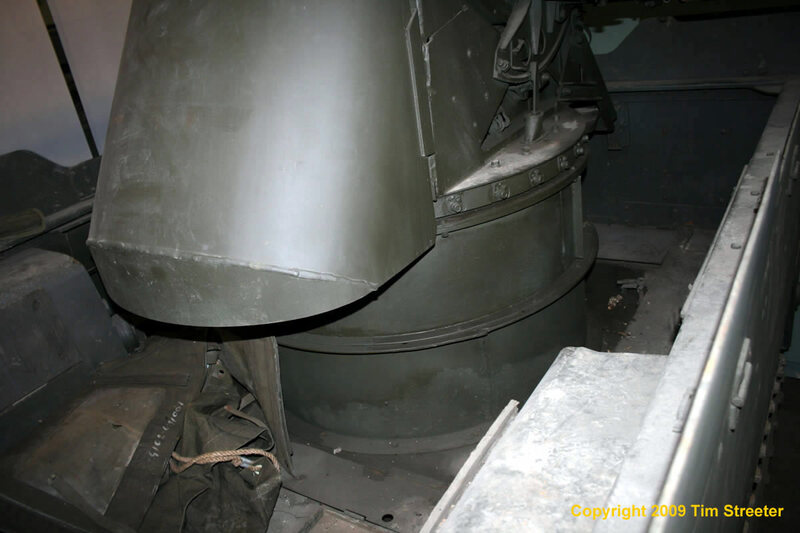 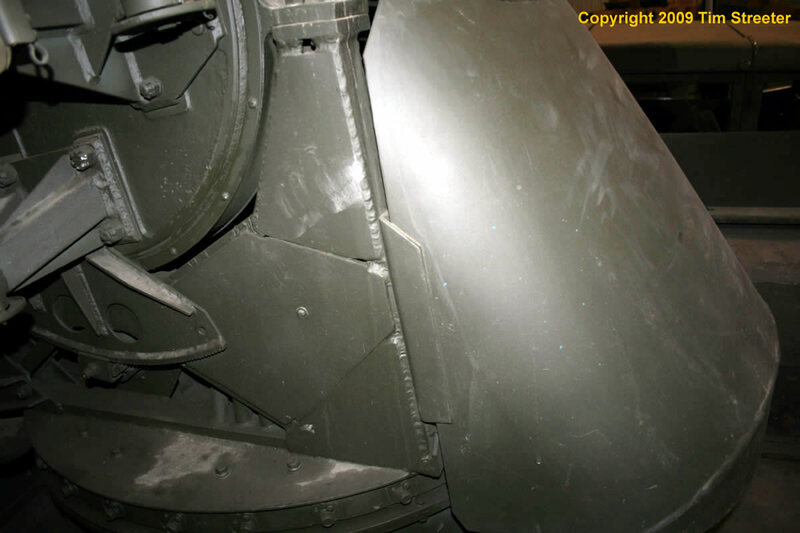 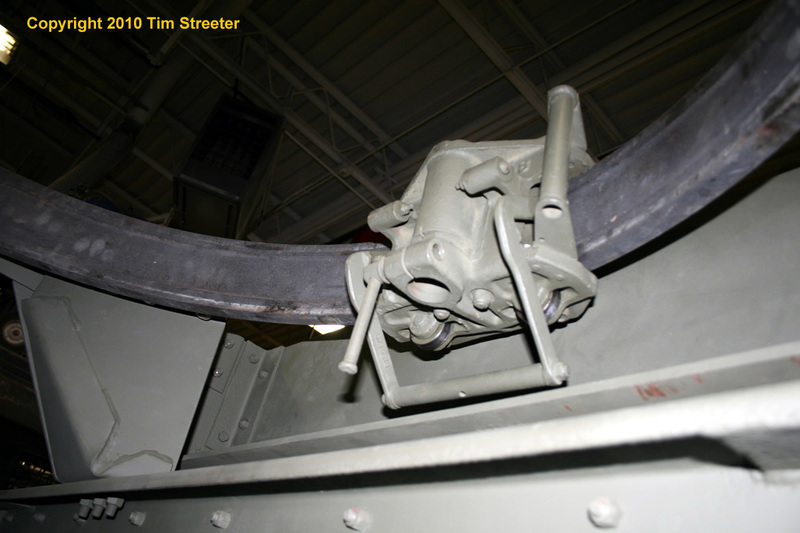 The brake drum and some details of the frame and underside of the rear hull can also be seen. 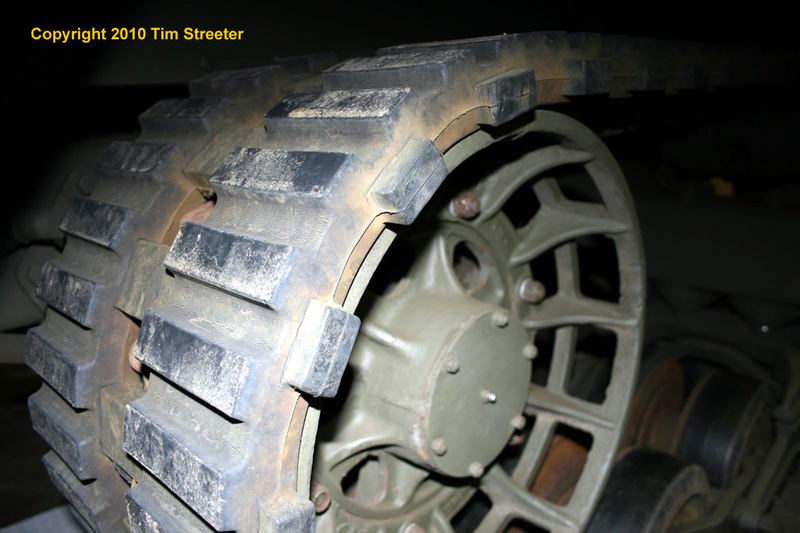 Photo #4 shows some wheel and sprocket details and the inner surface of the track. 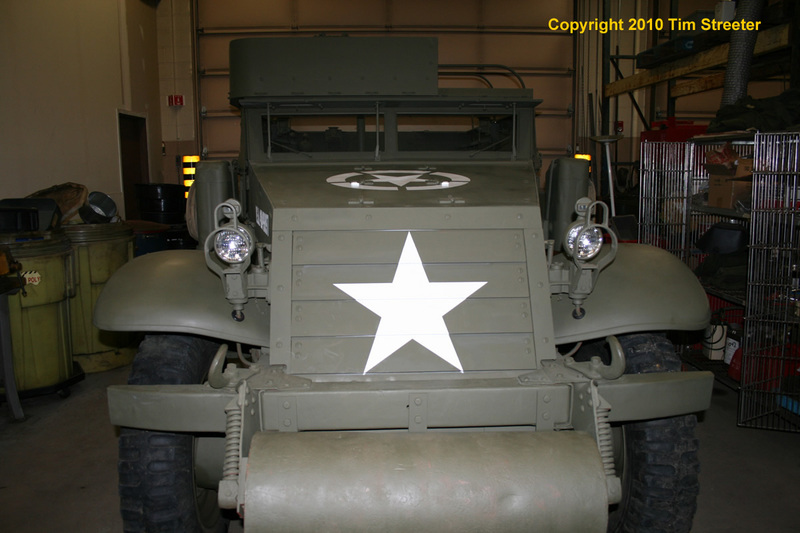 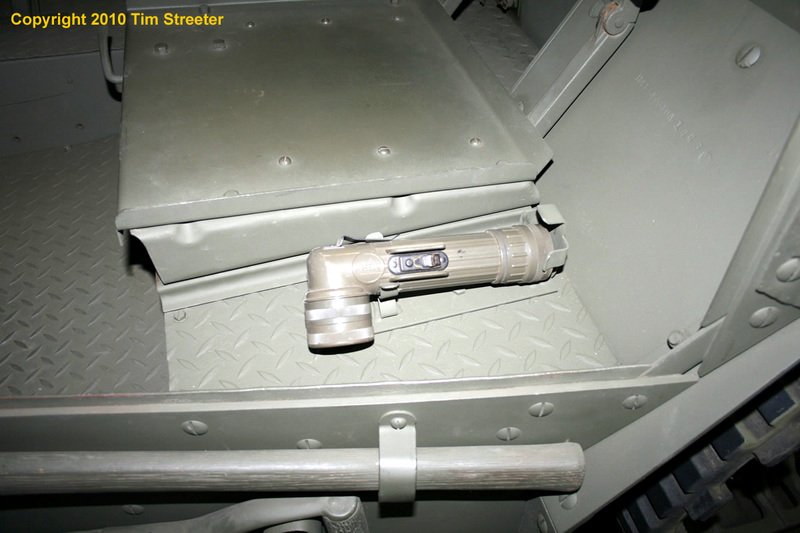 This is the M16 in the collection at the World War II Vehicle Museum in Hubbard, Ohio. 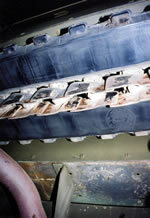 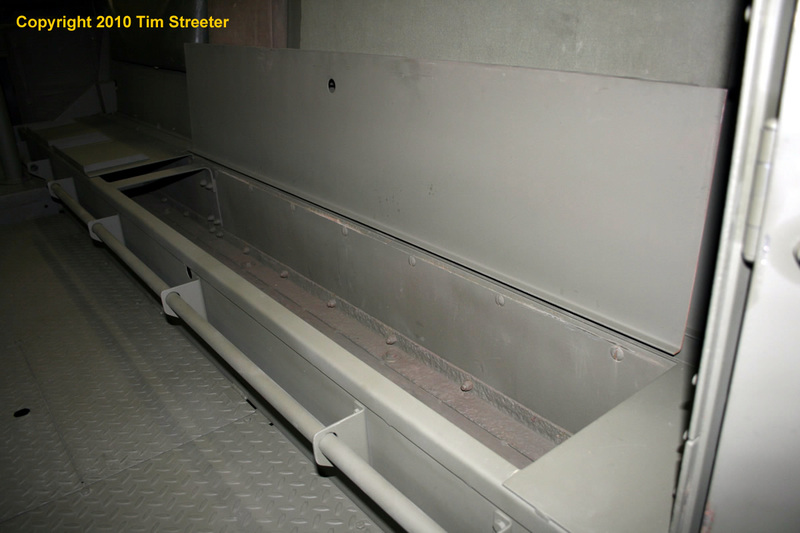 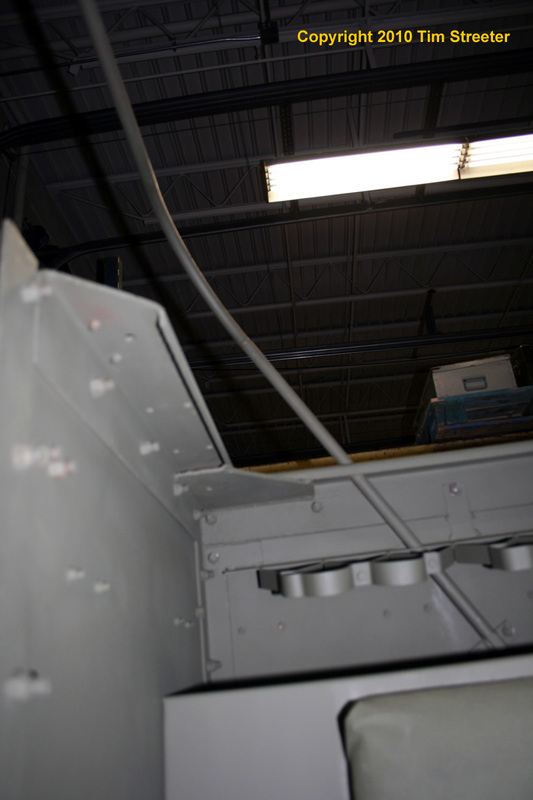 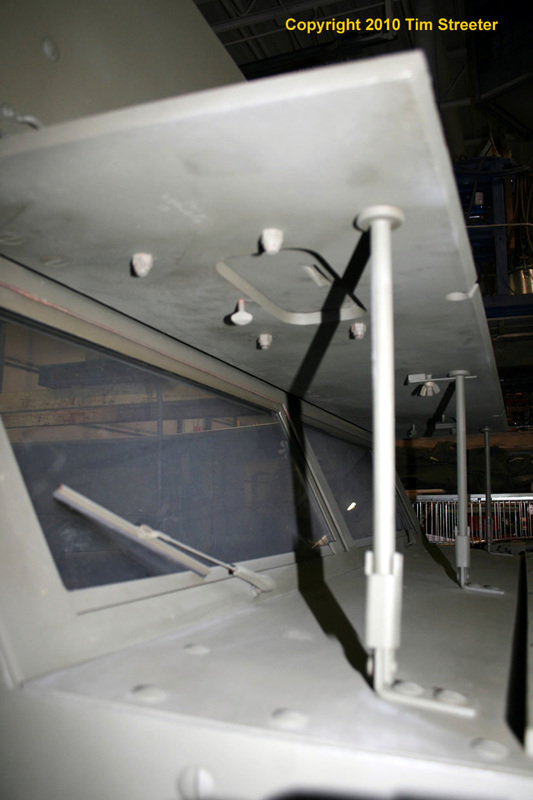 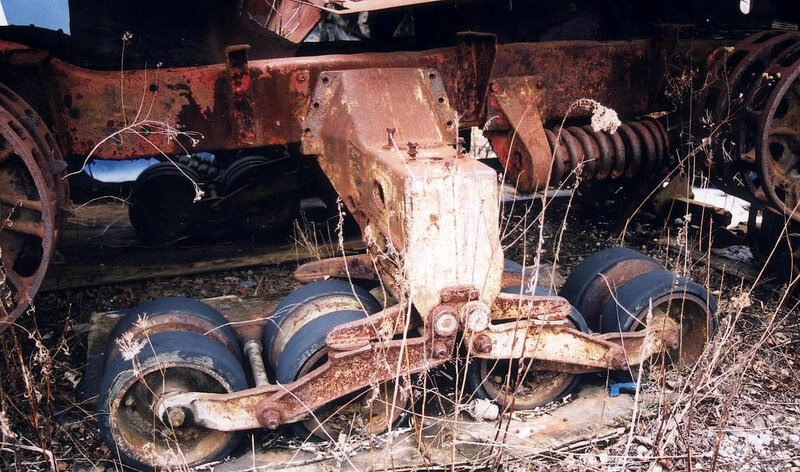 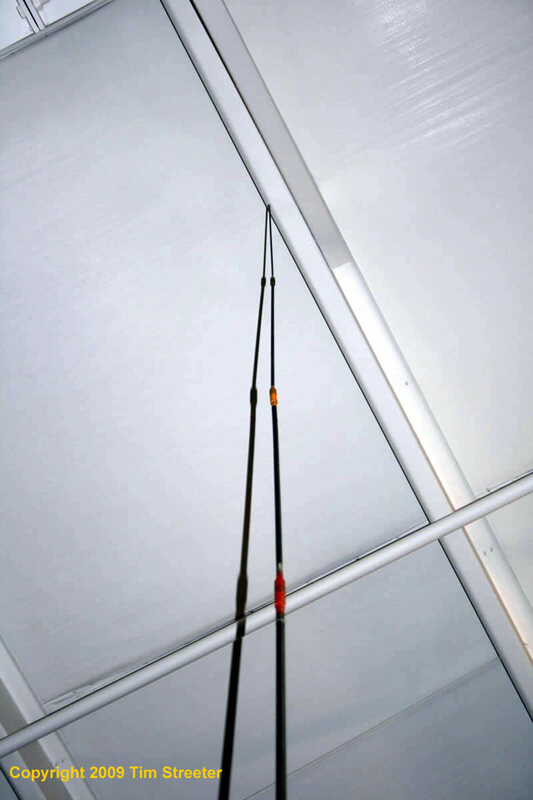 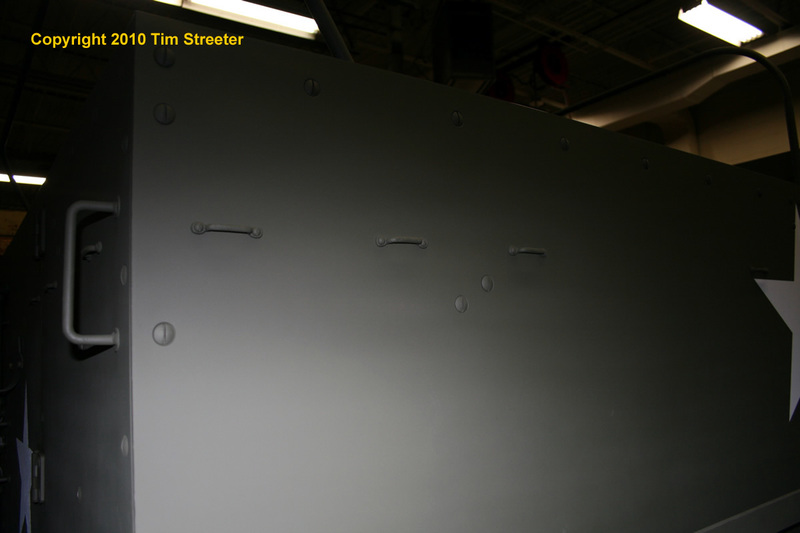 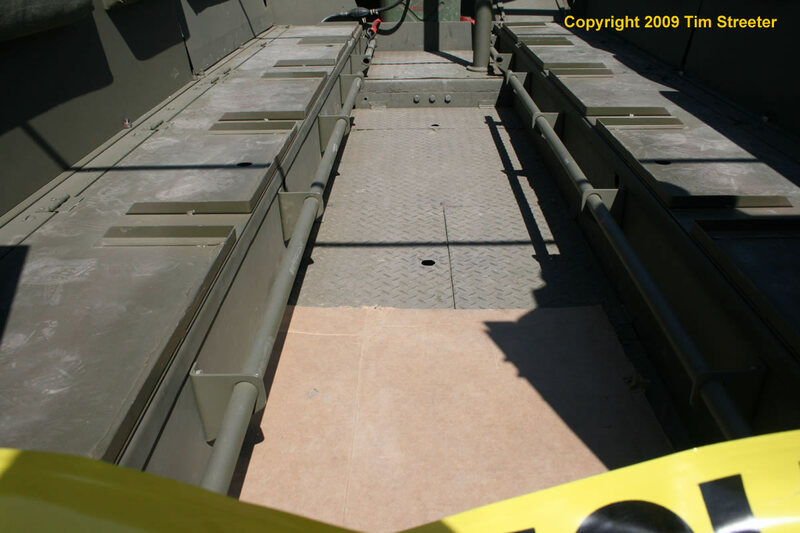 Photo #5 is of the same vehicle, looking up at the inner surface of the track on the right side. 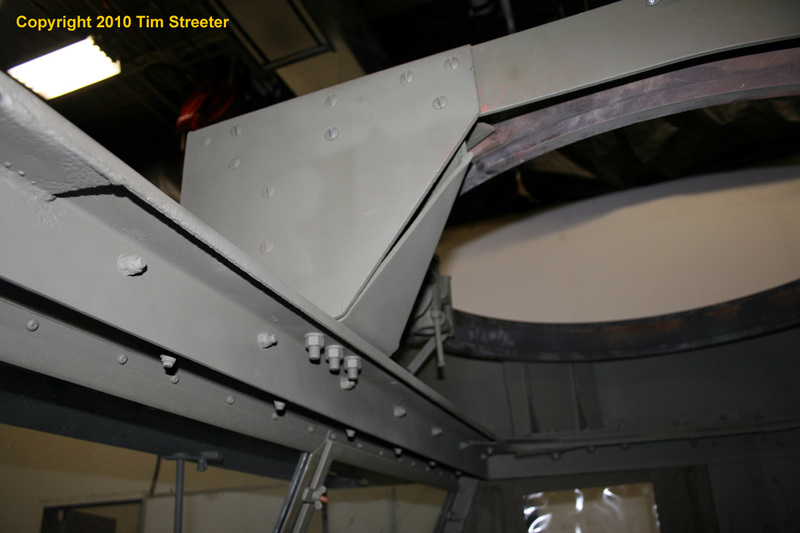 Of note here is the fact that the center guides on the track are steel molded into the rubber of the track. 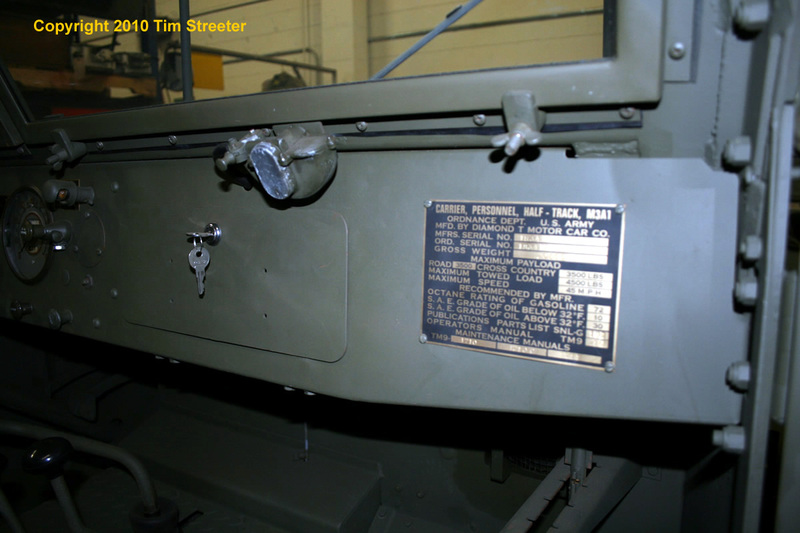 The marking stamped in the track indicates that it was manufactured by B.F. Goodrich. 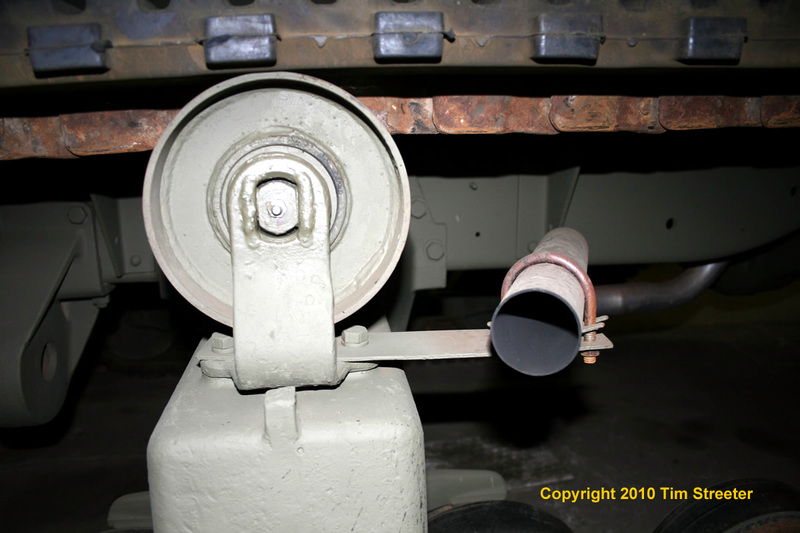 At the bottom of the photo is the bracket that supports the exhaust pipe. 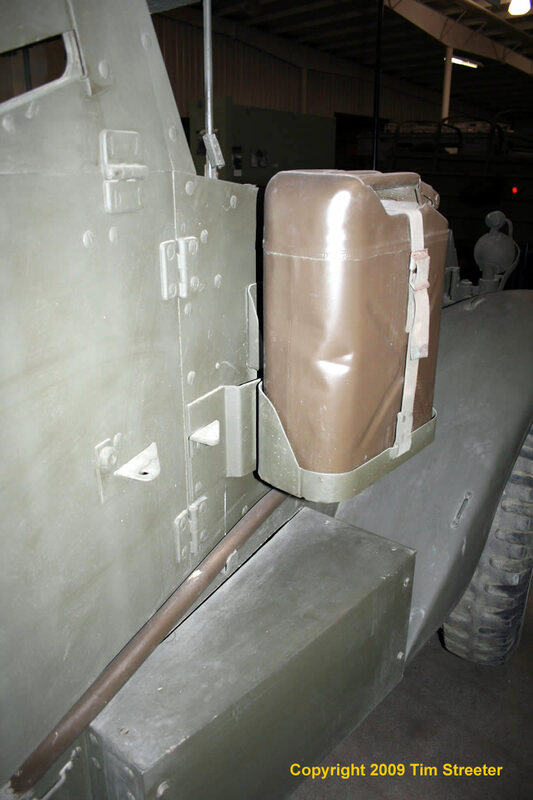 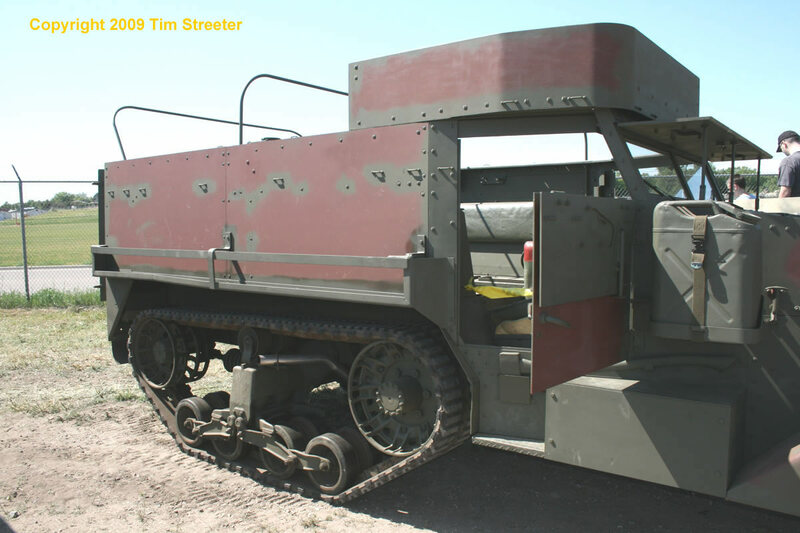 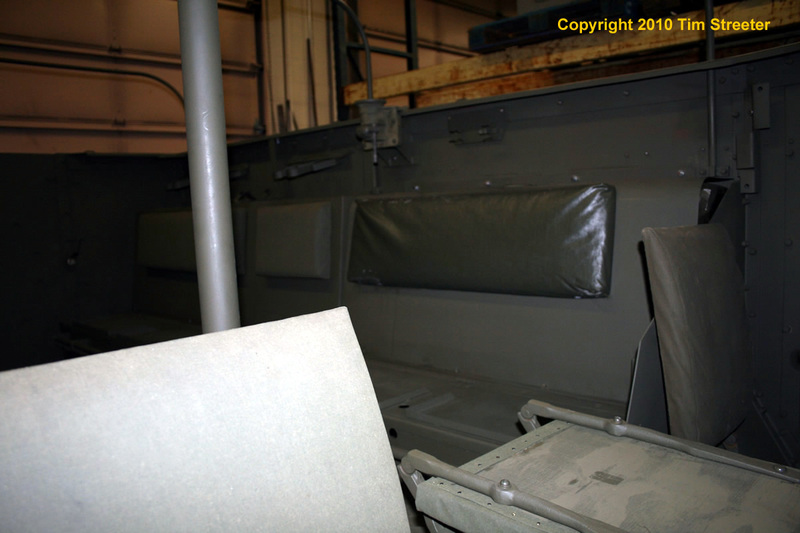 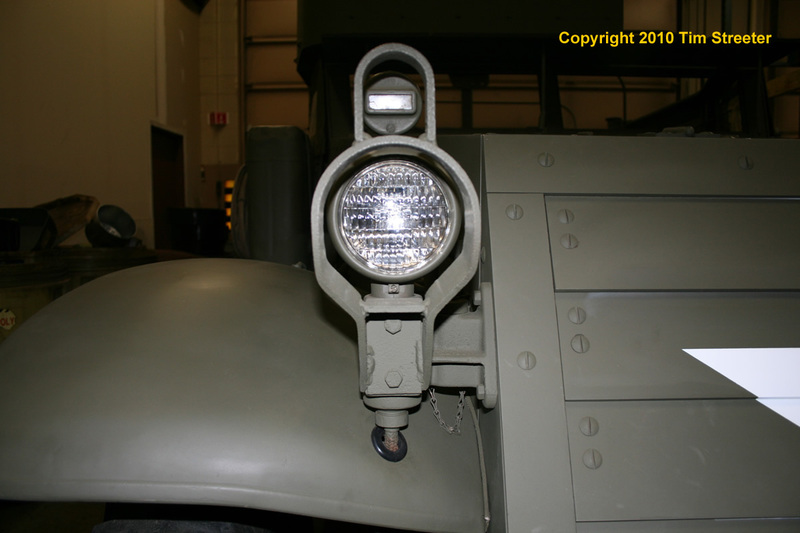 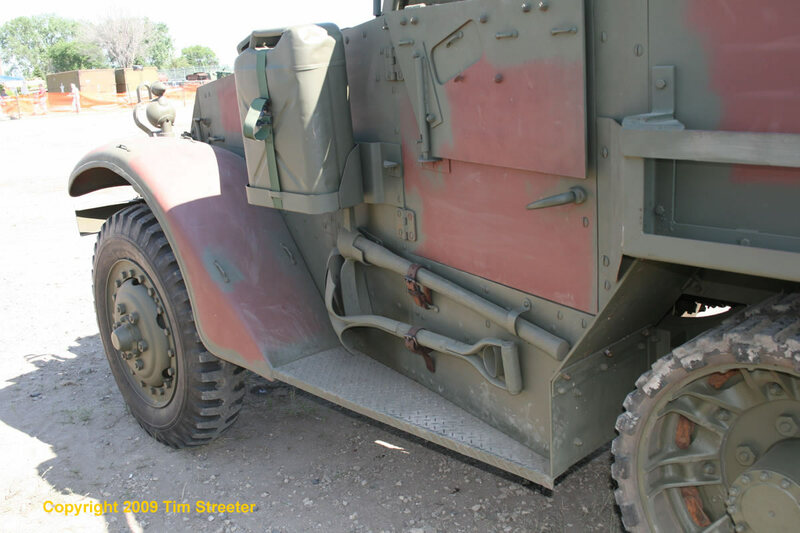 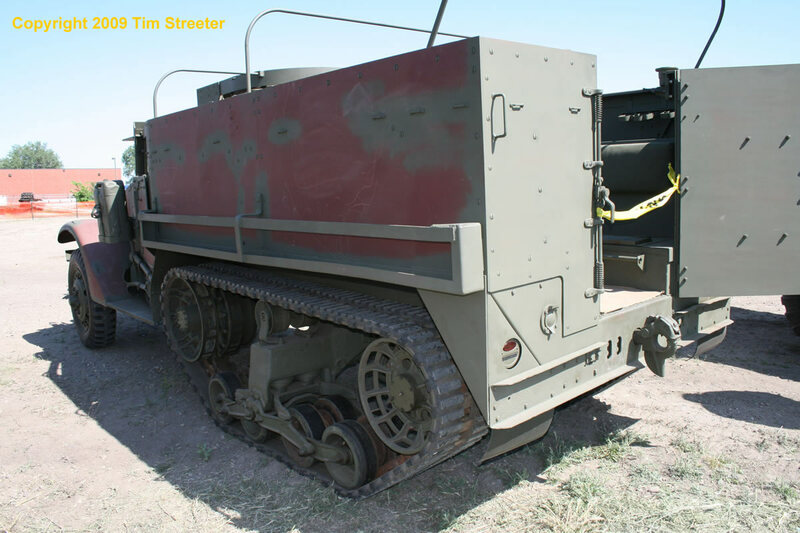 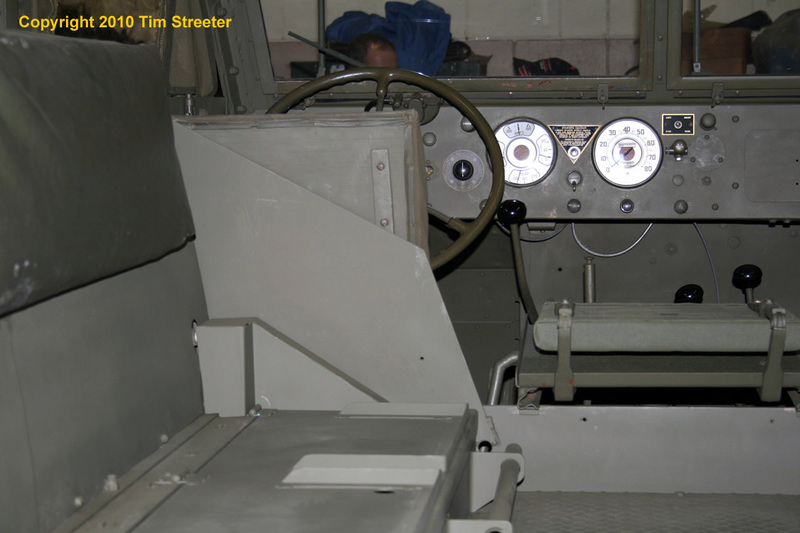 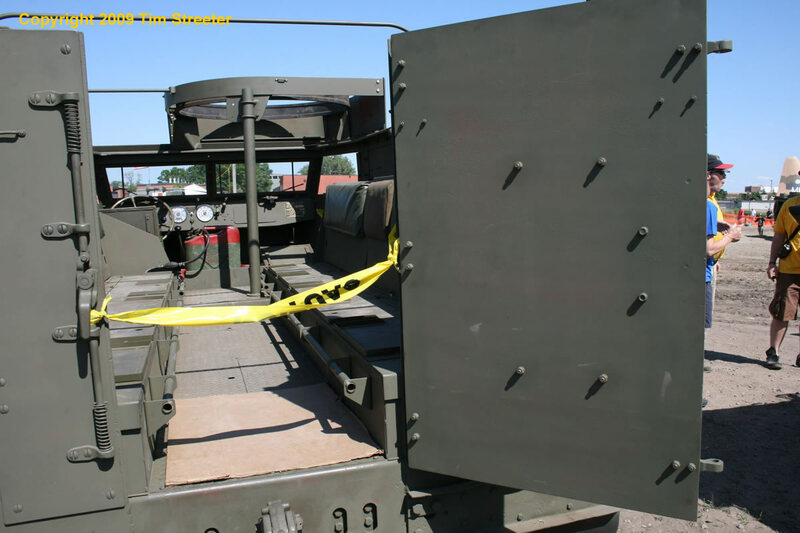 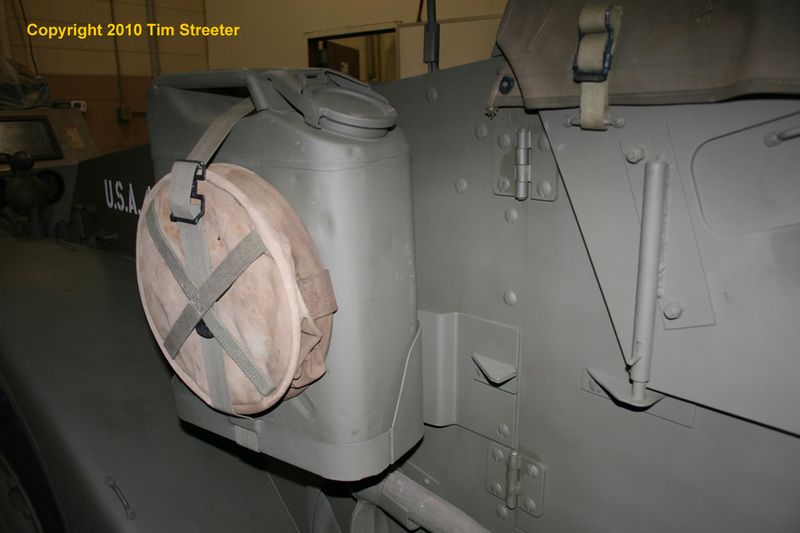 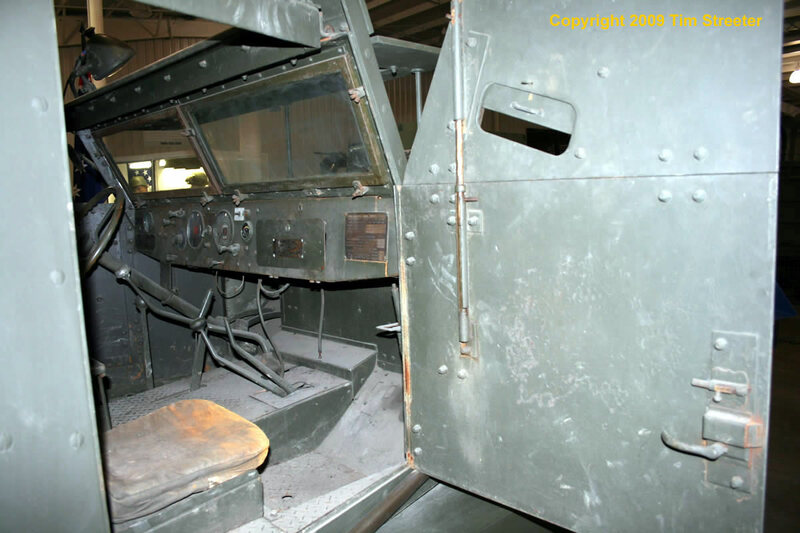 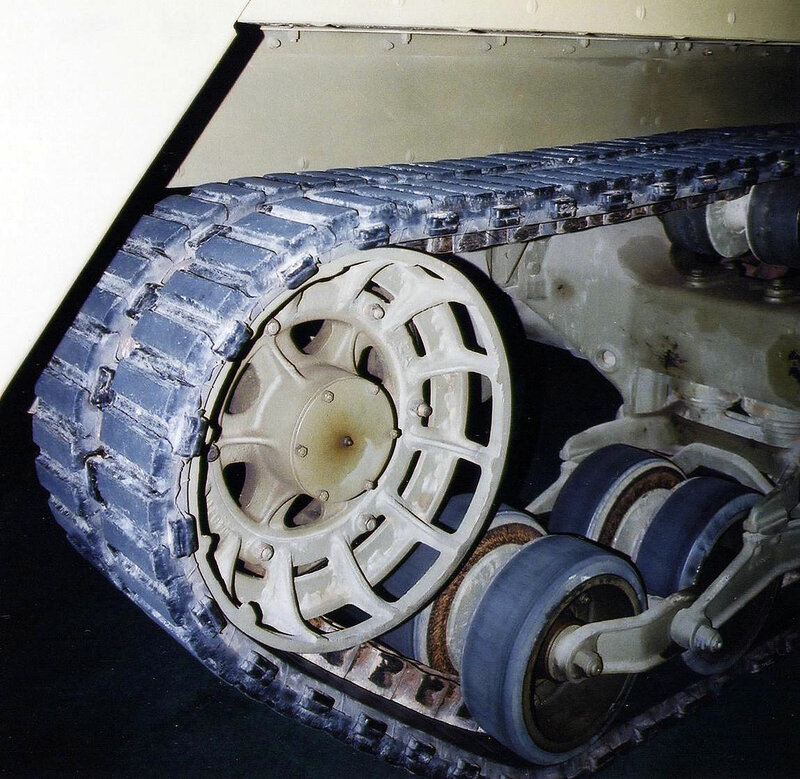 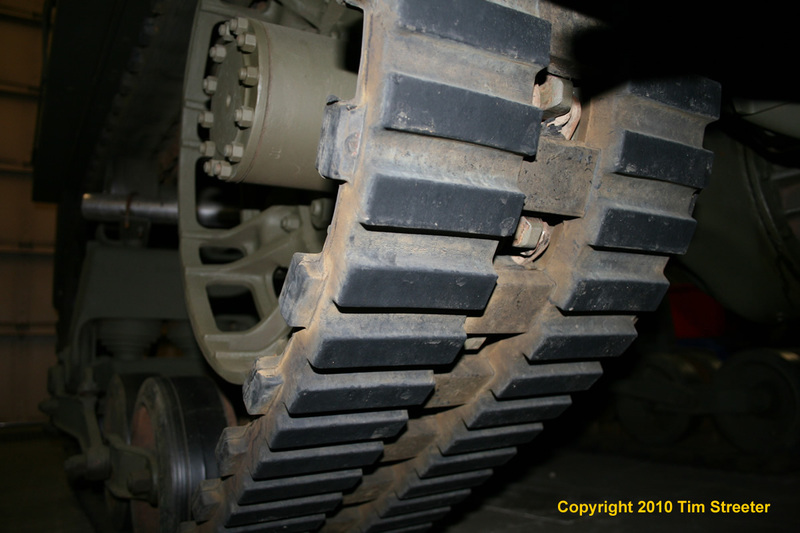 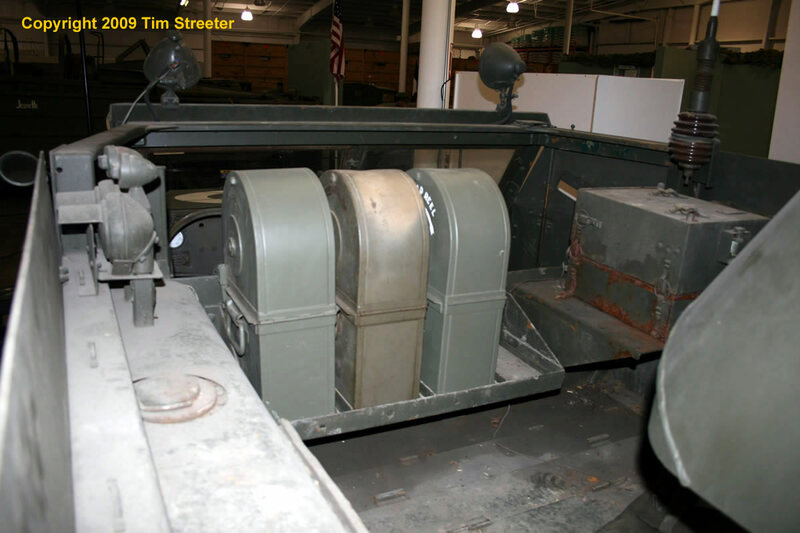 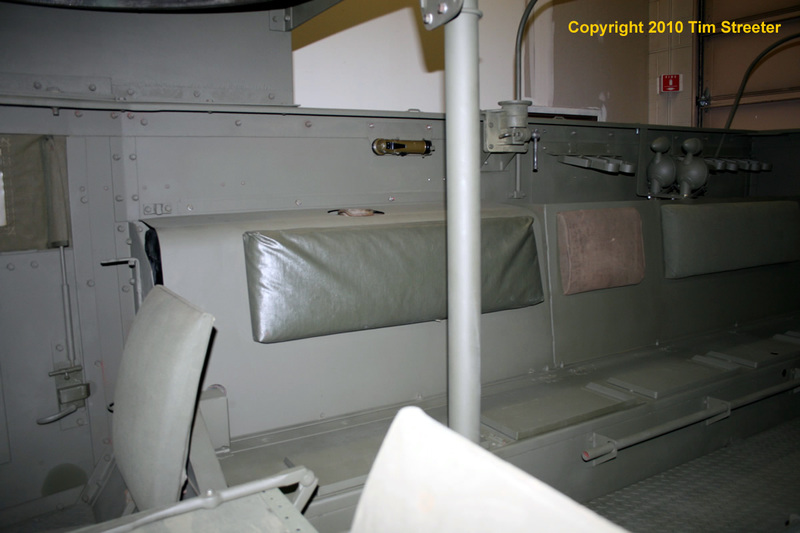 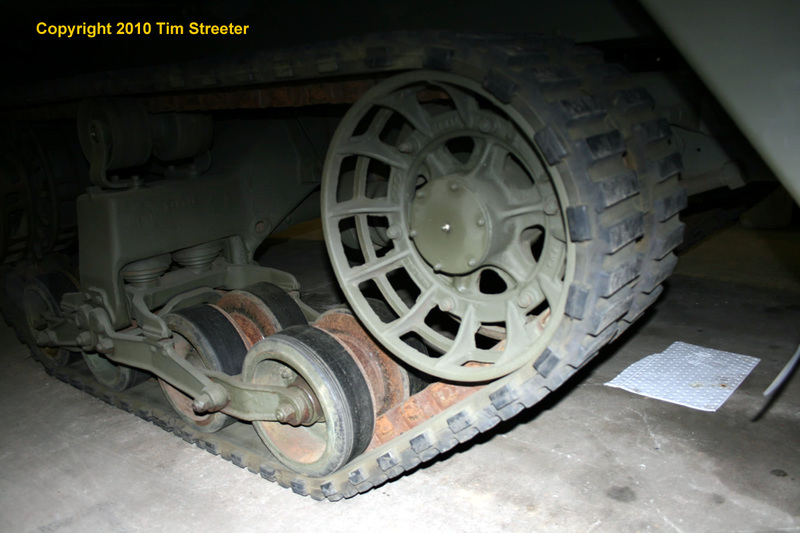 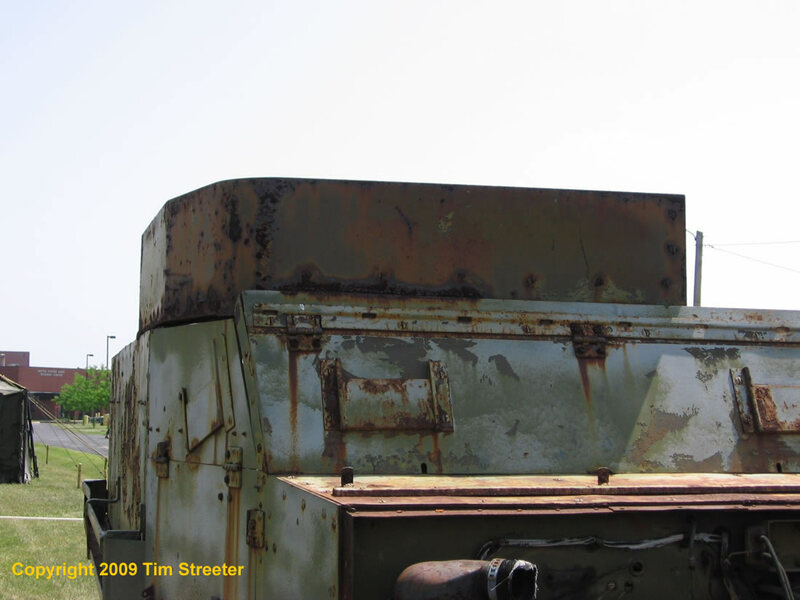 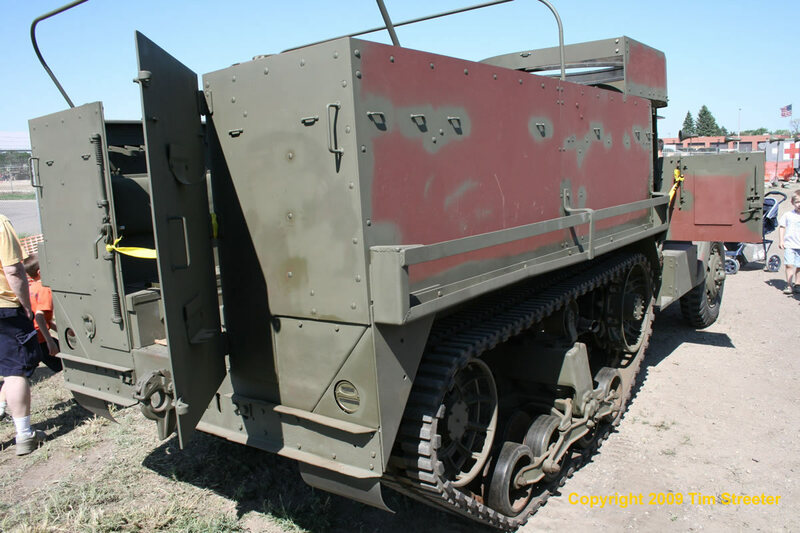 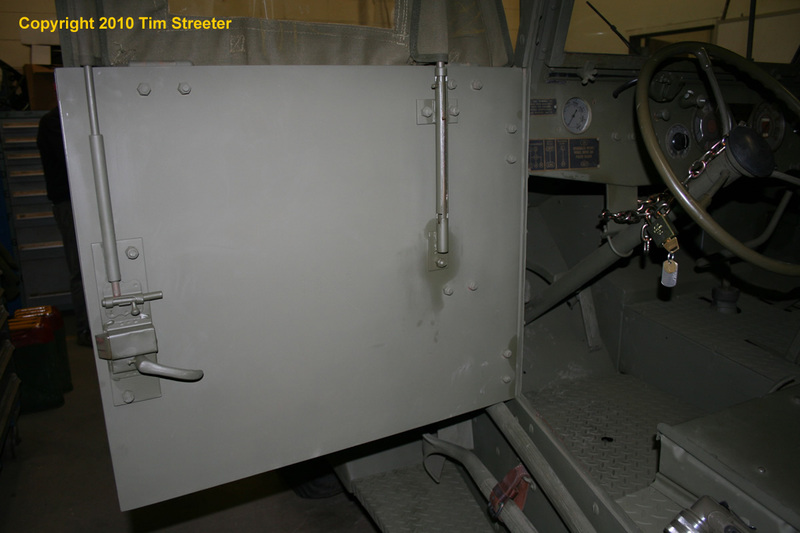 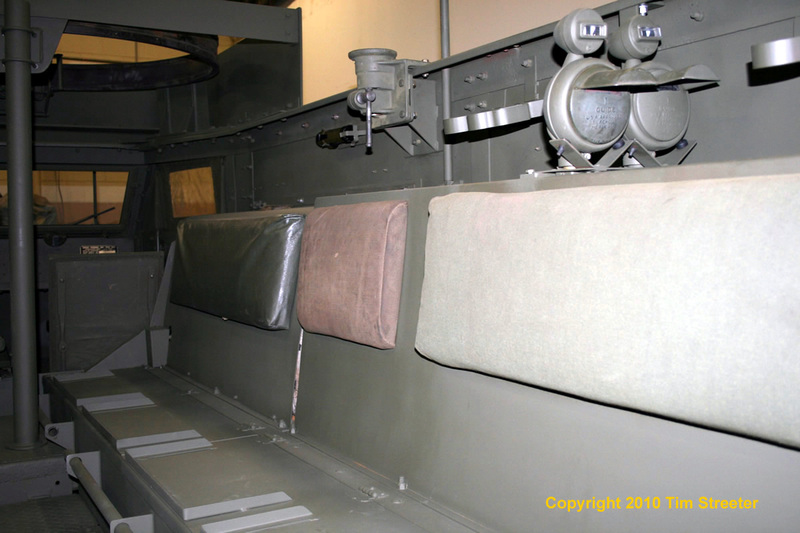 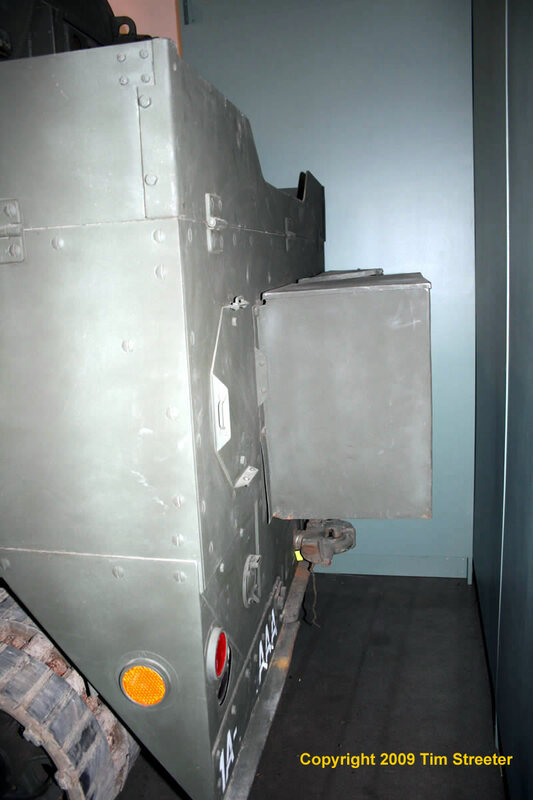 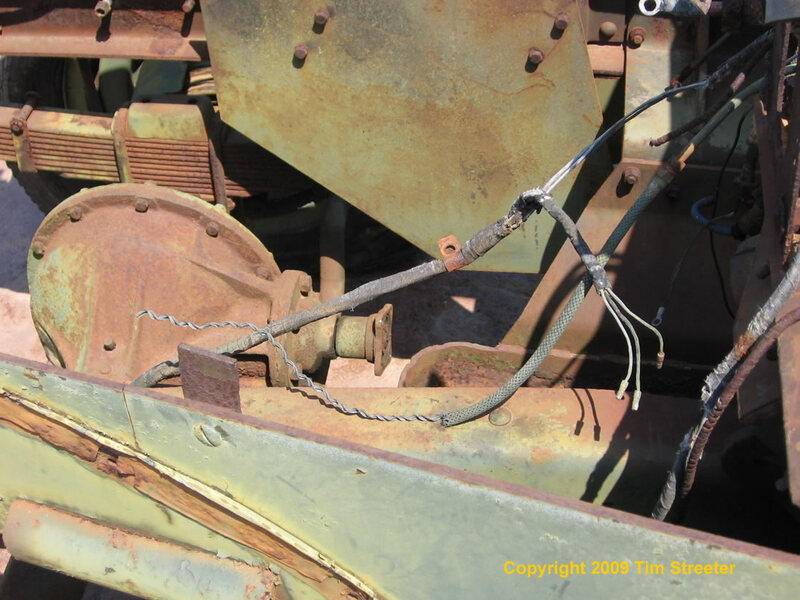 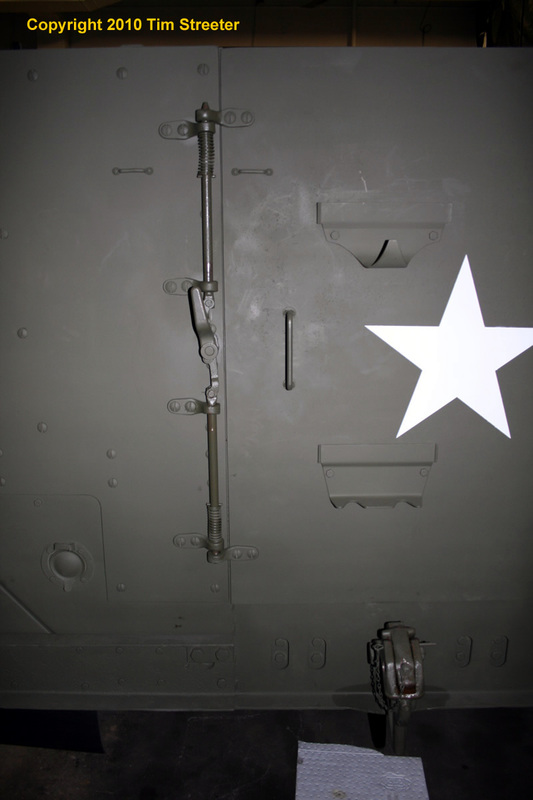 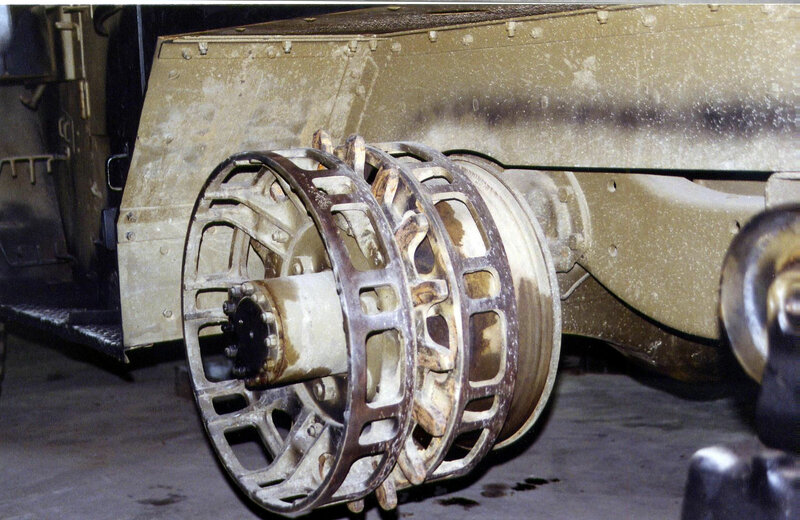 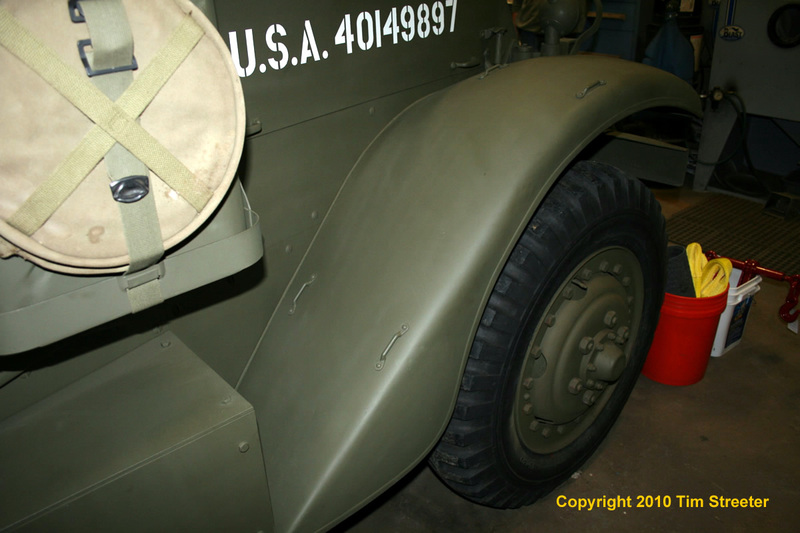 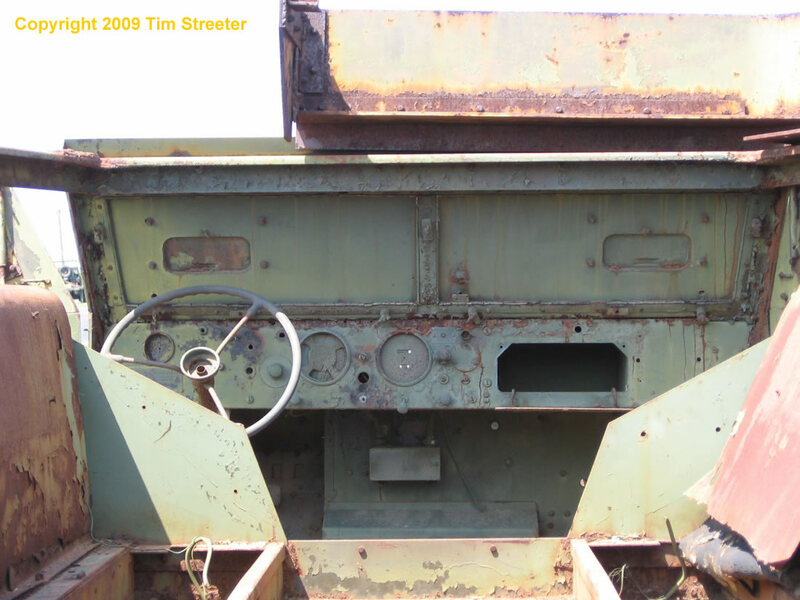 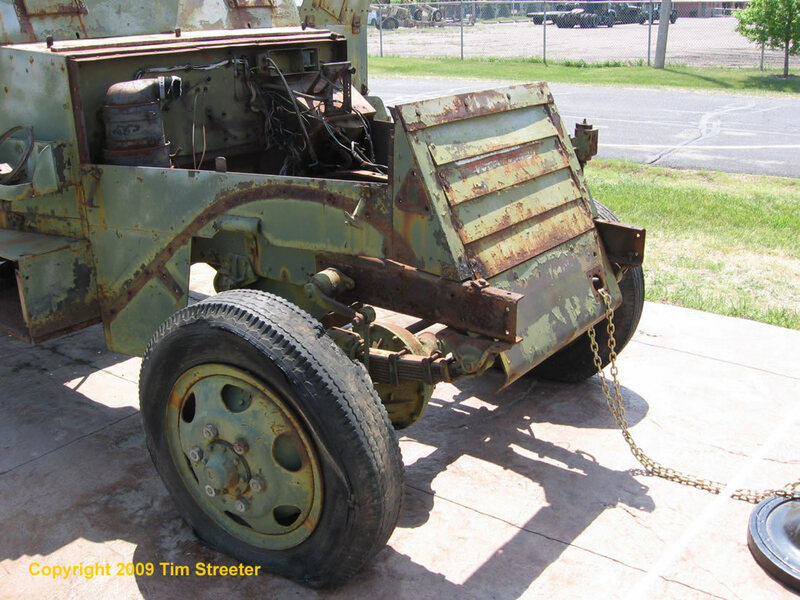 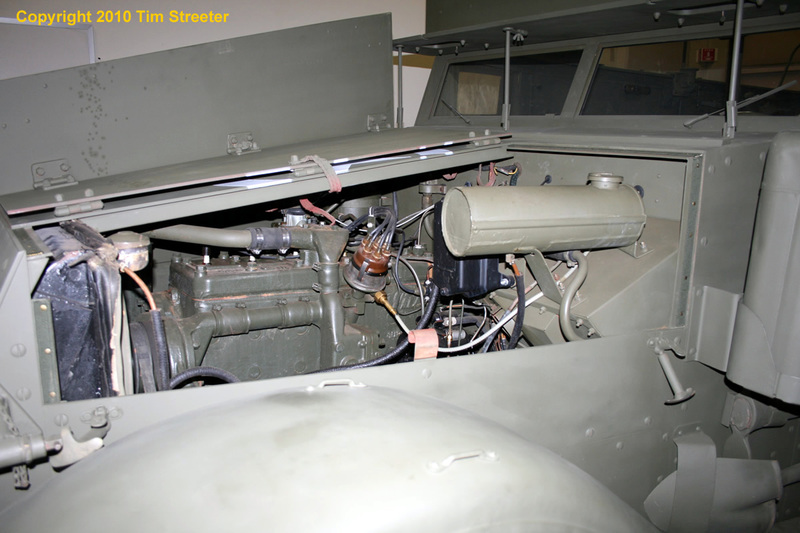 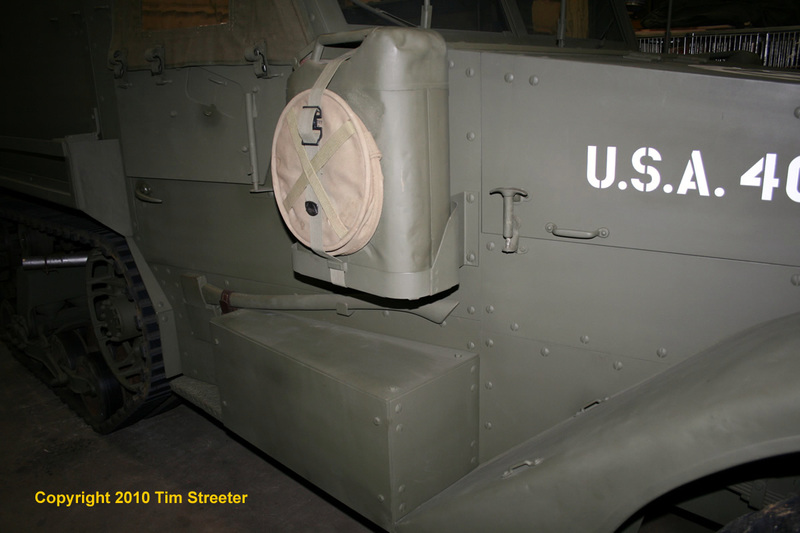 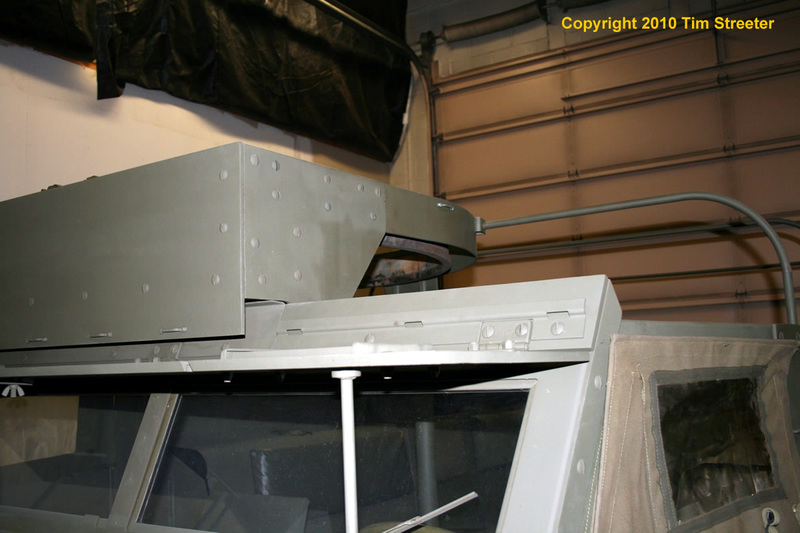 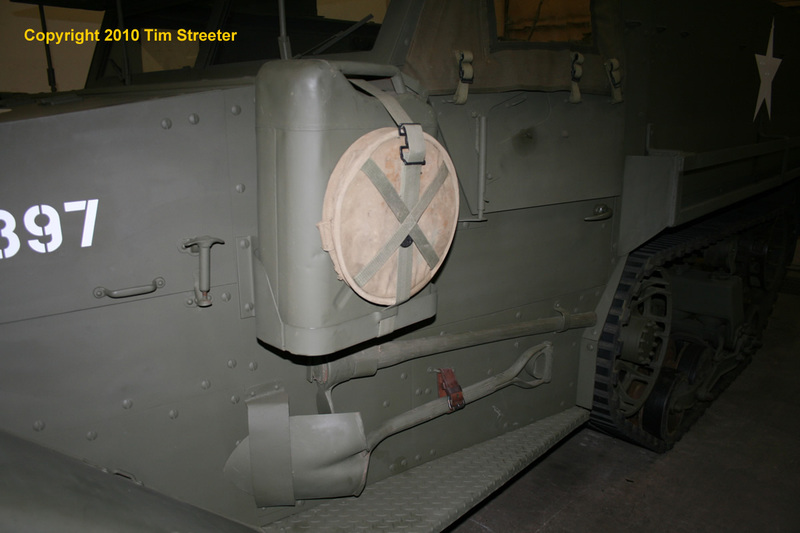 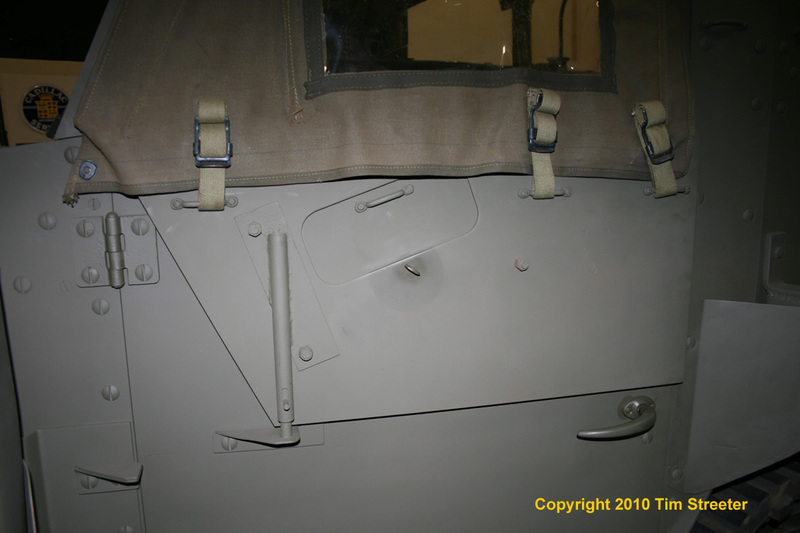 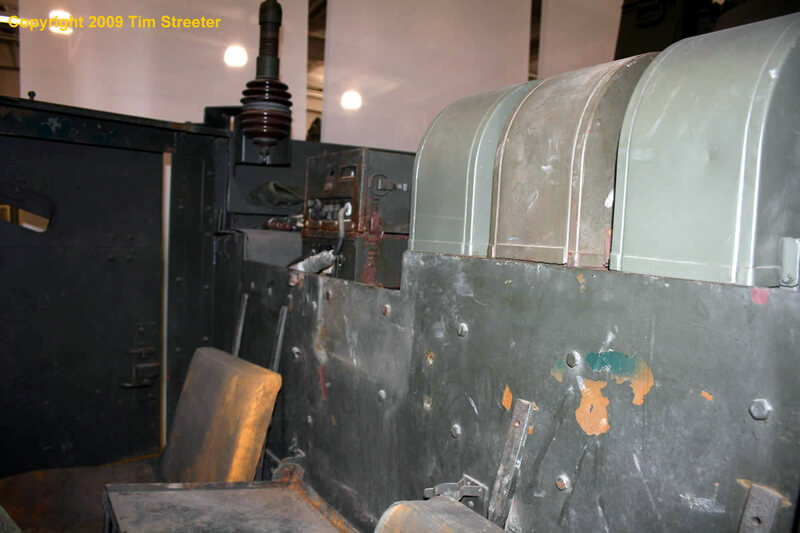 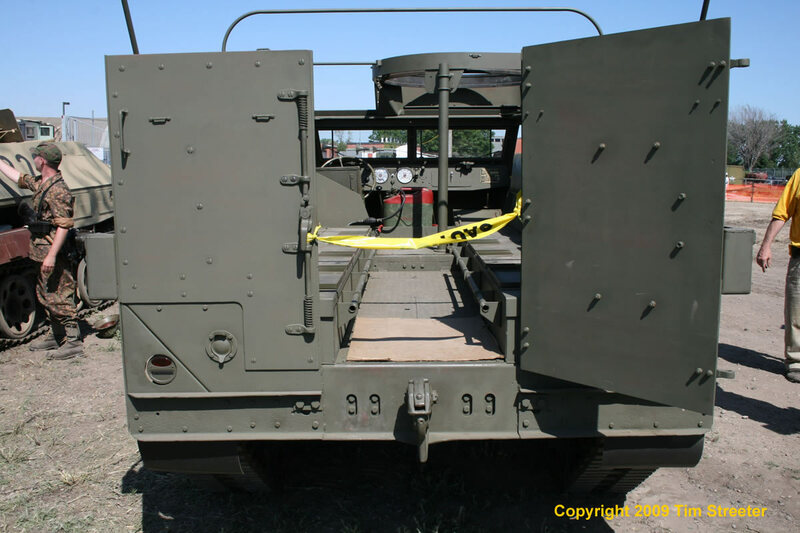 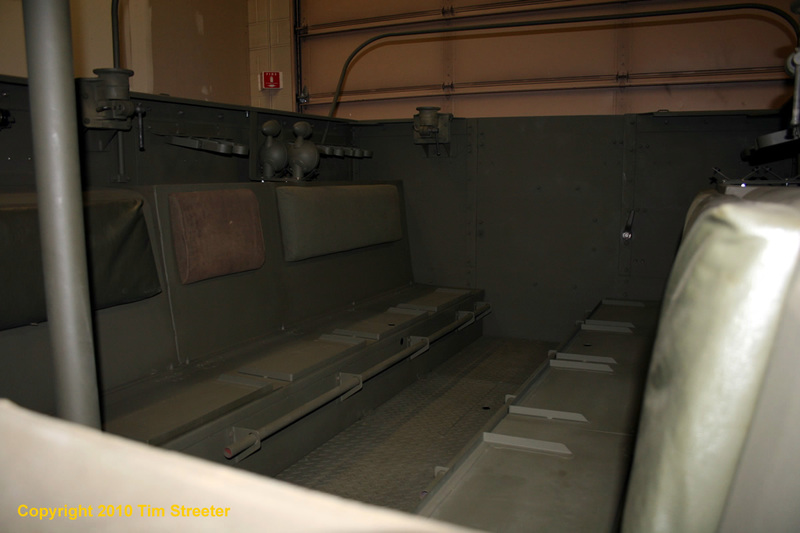 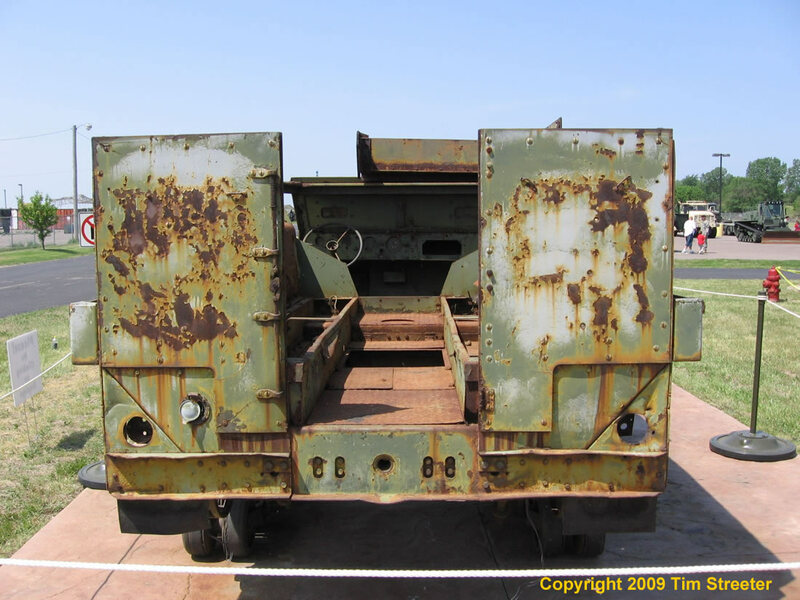 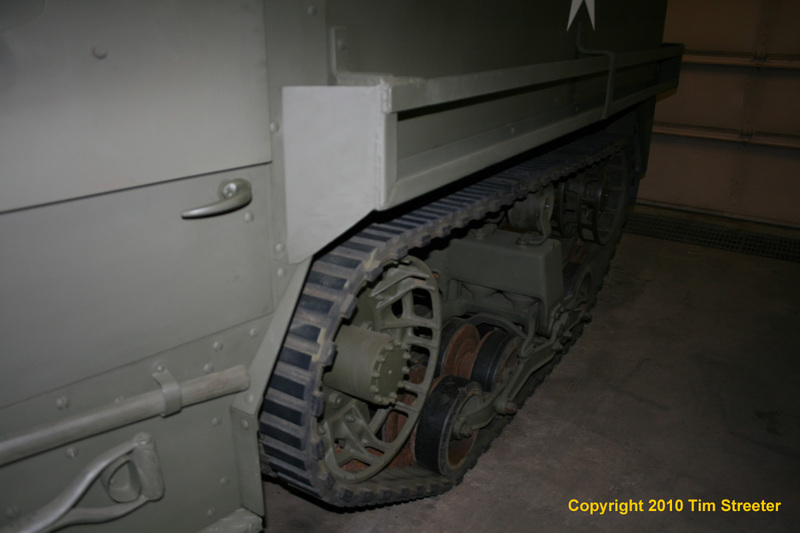 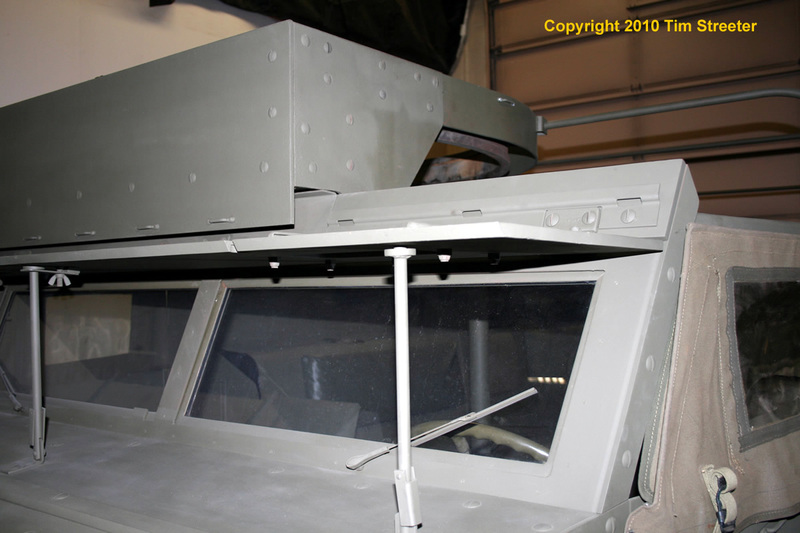 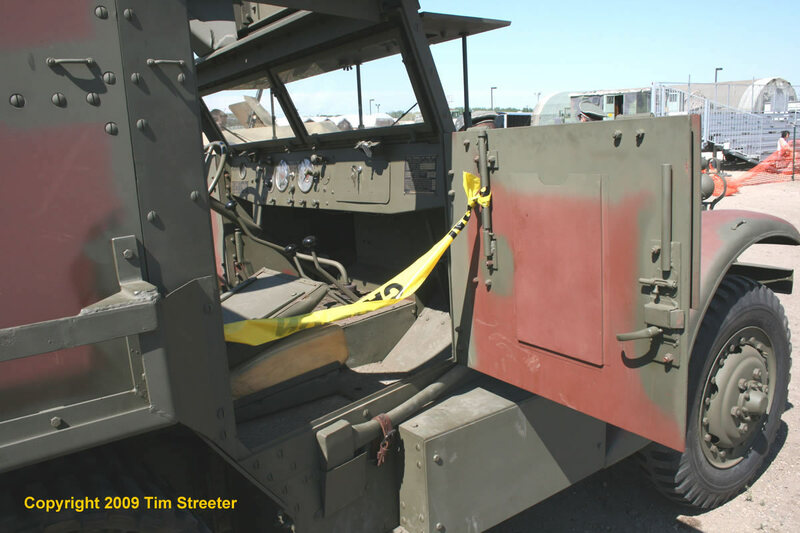 Photo #6 shows the track from the outside, looking at the right rear of an M3A1 half-track. 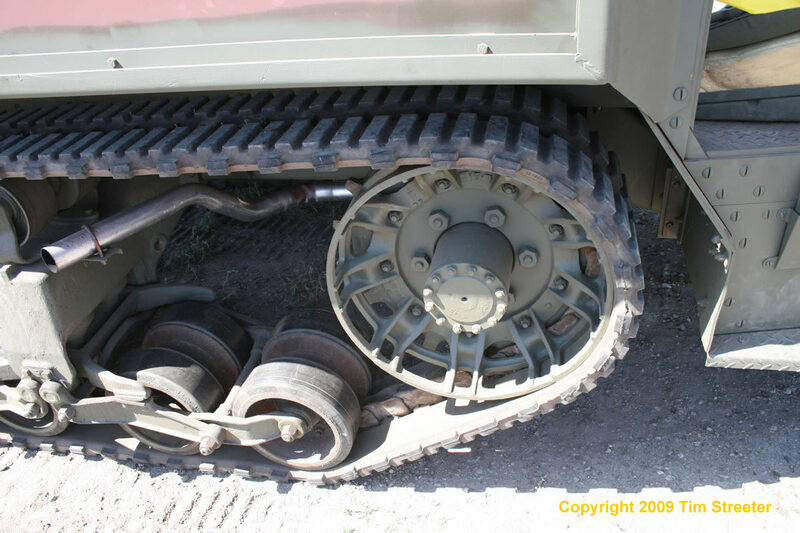 Some details of the roadwheels and their mounts can be seen. 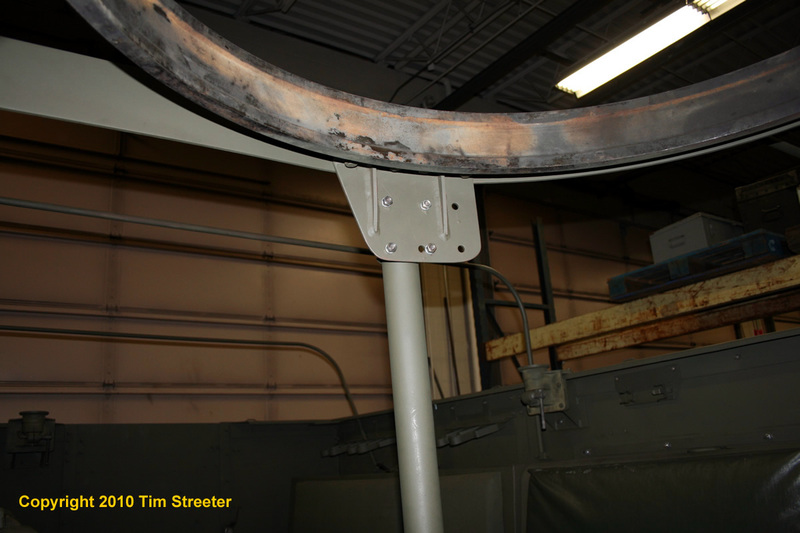 Of note here is the wear on the inner surfaces of the roadwheels from the steel center guides of the track. 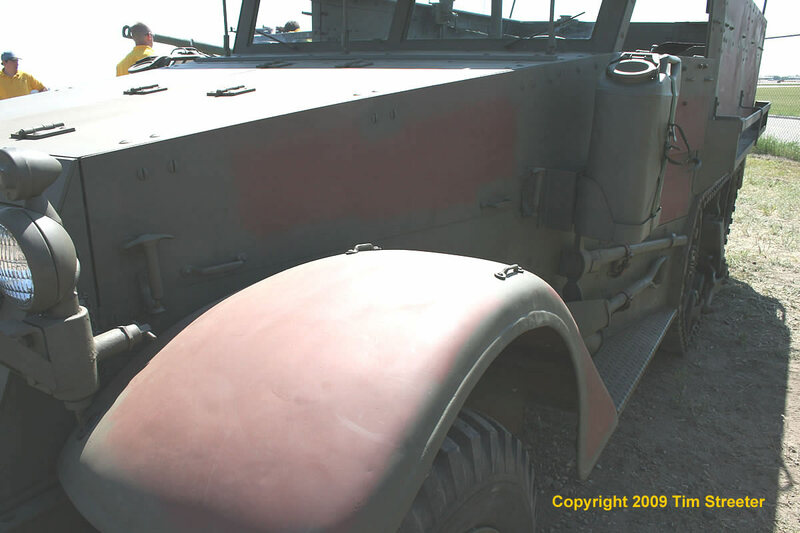 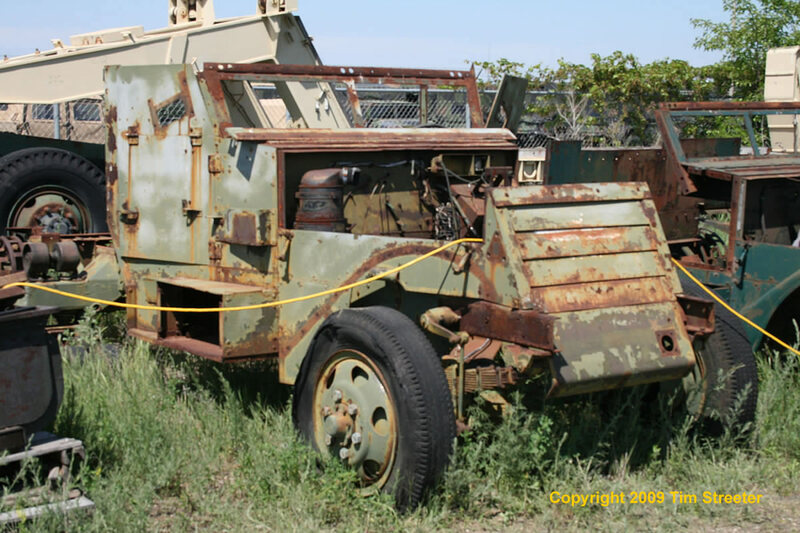 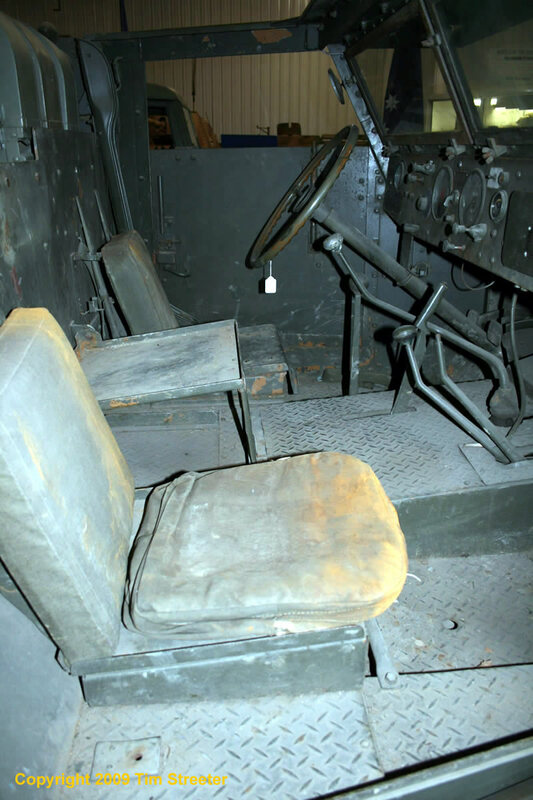 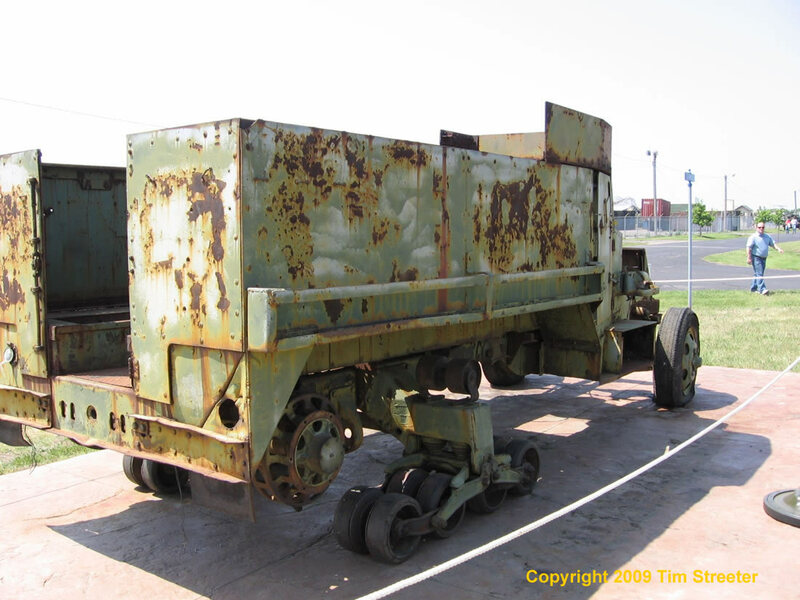 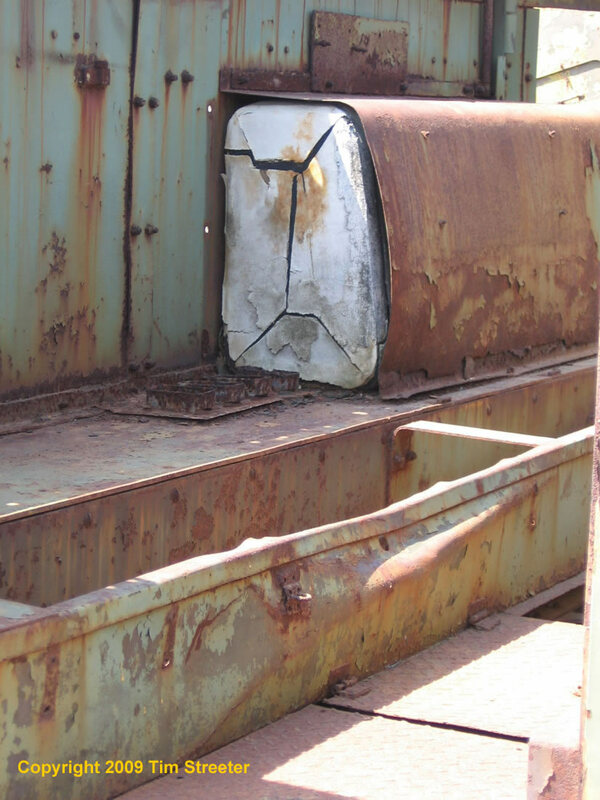 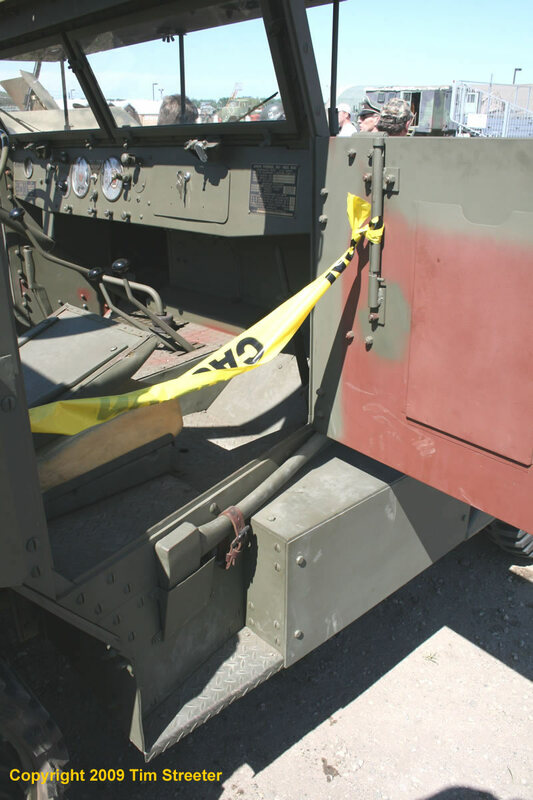 Photo #7 is of an unrestored vehicle that was in the Oshawa Military Museum. 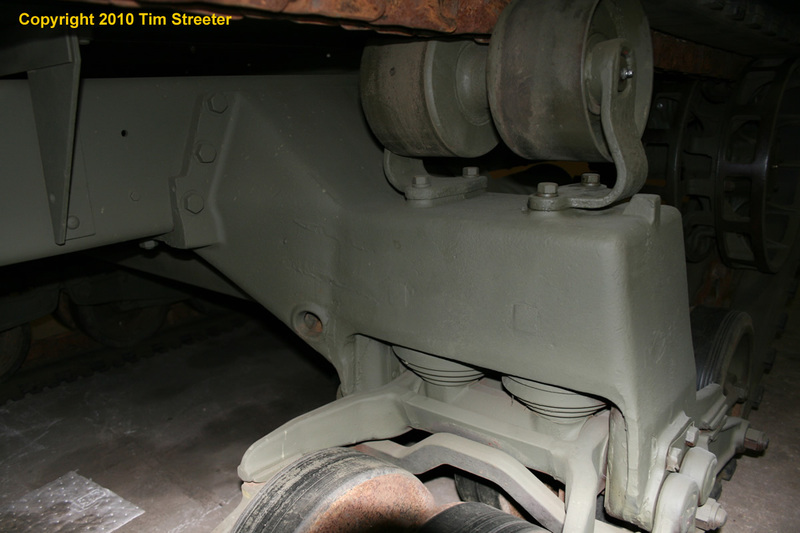 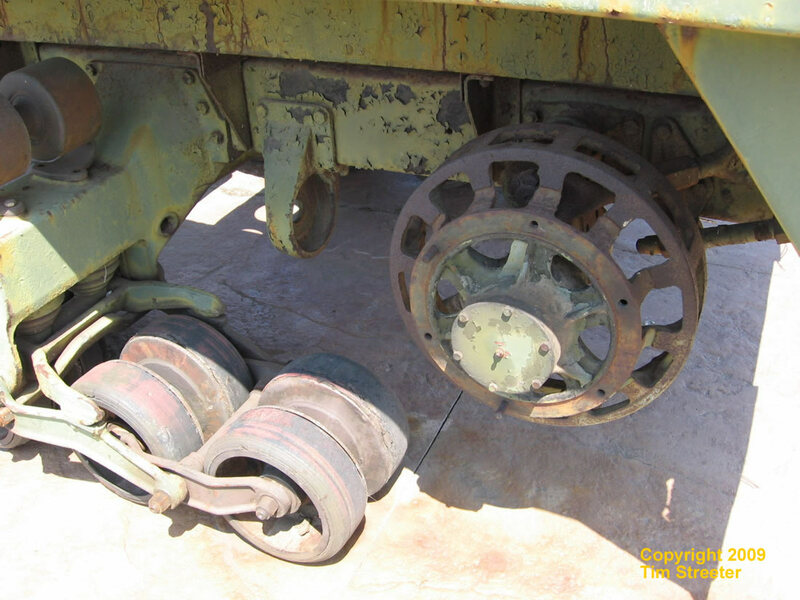 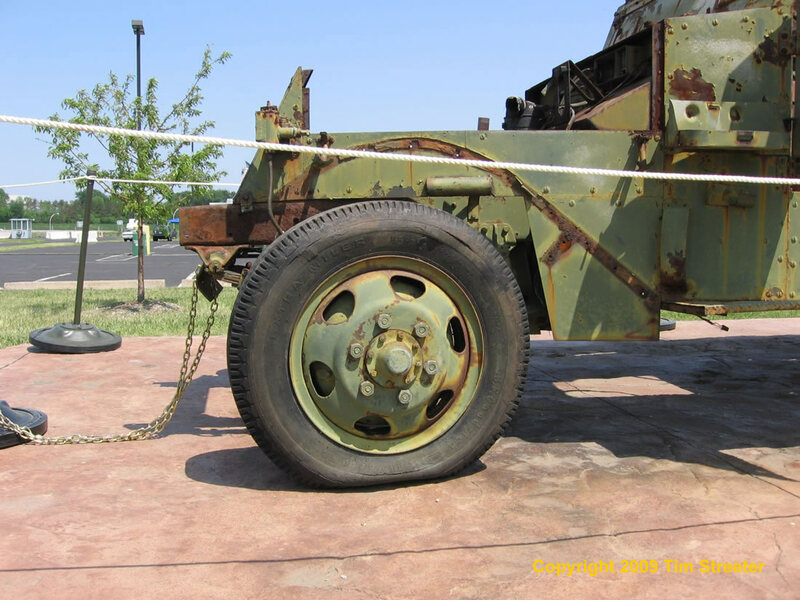 Note that the support bracket for the roadwheels on this vehicle has a lightening hole under the return roller mounting (not present) that was not on the other vehicles. 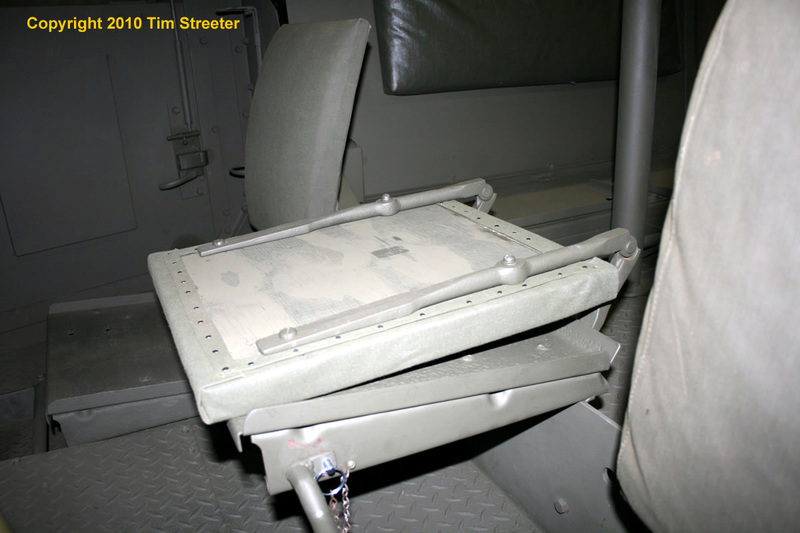 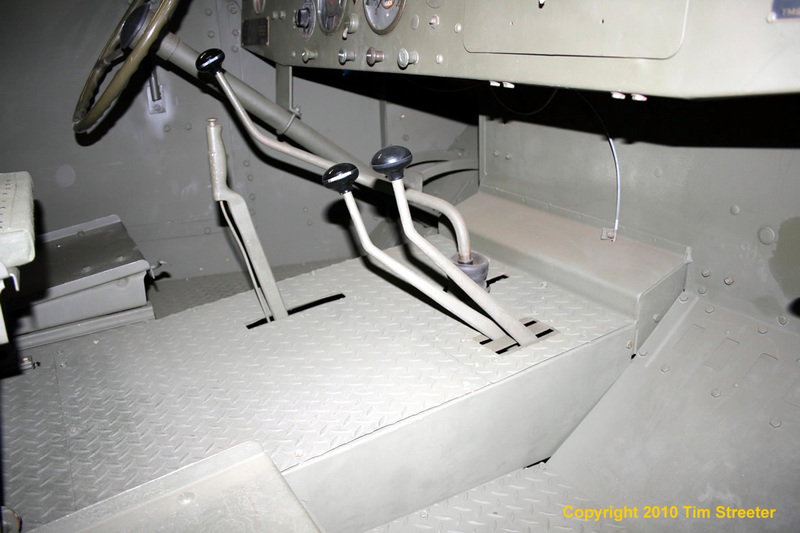 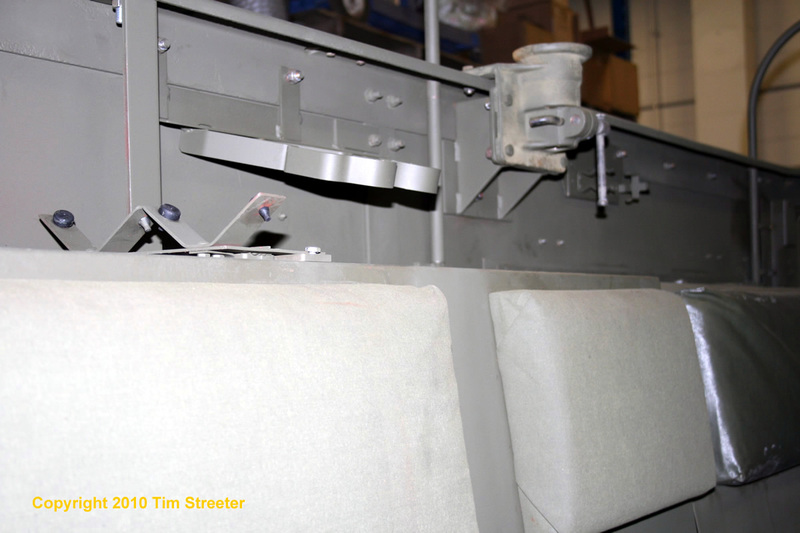 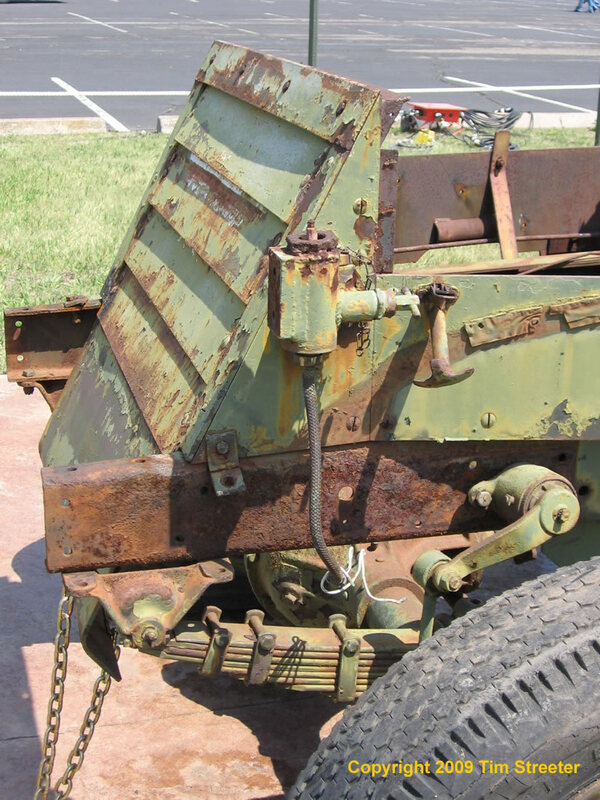 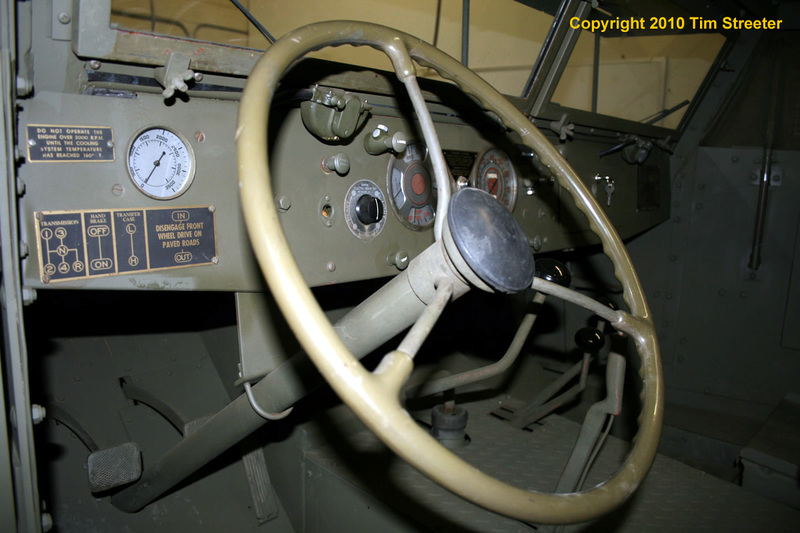 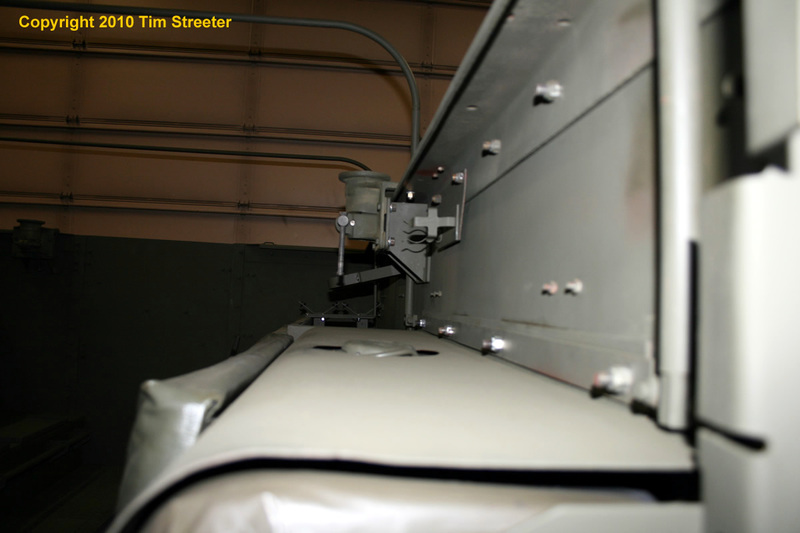 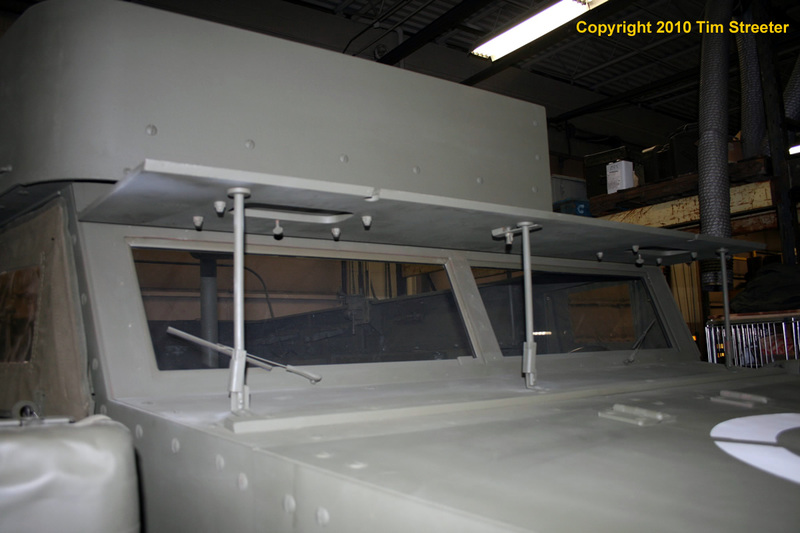 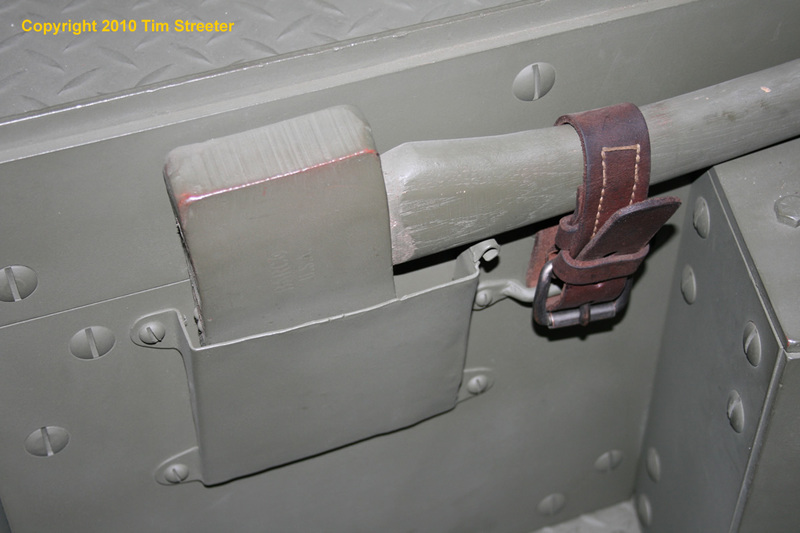 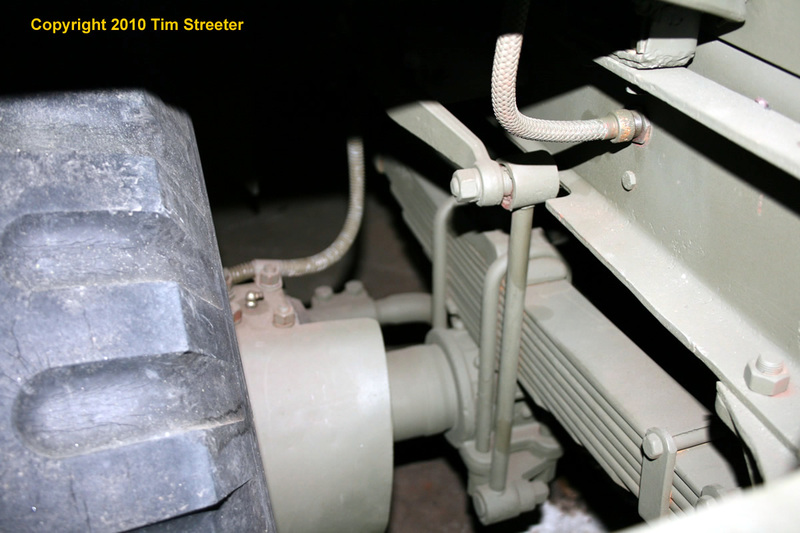 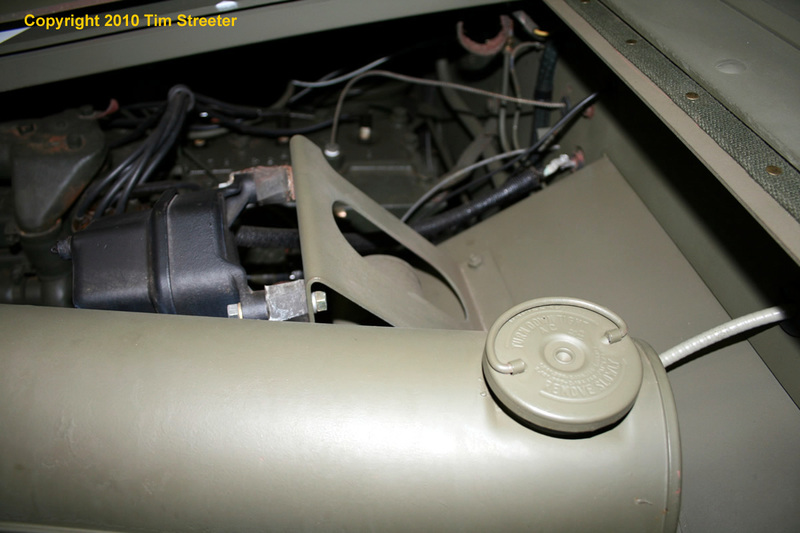 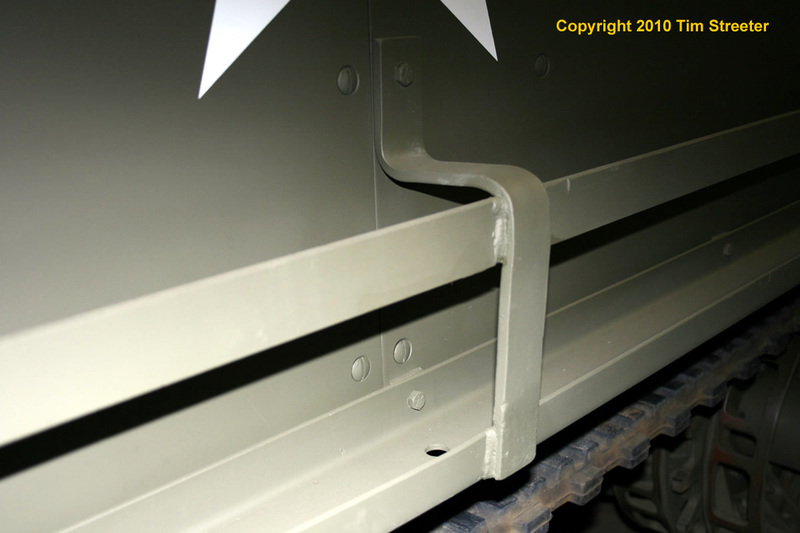 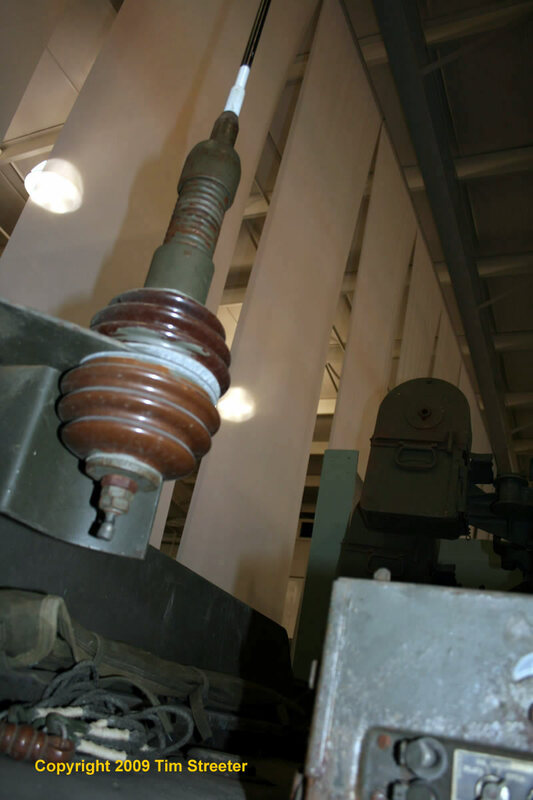 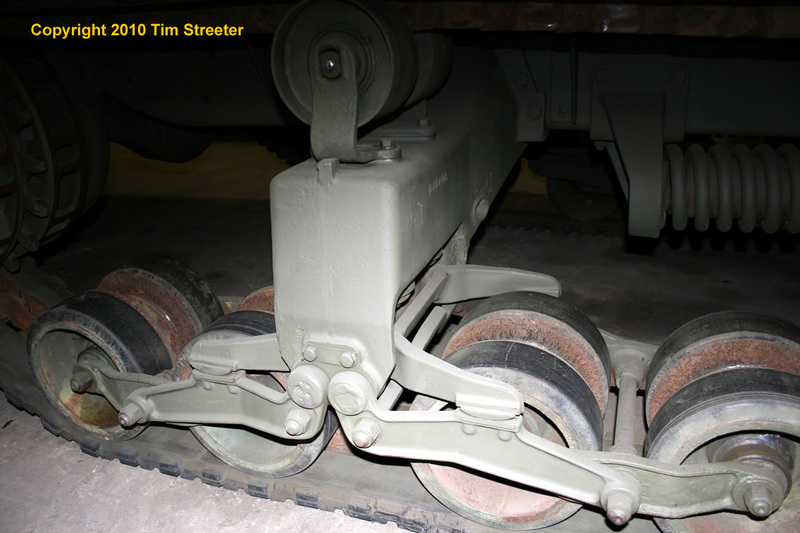 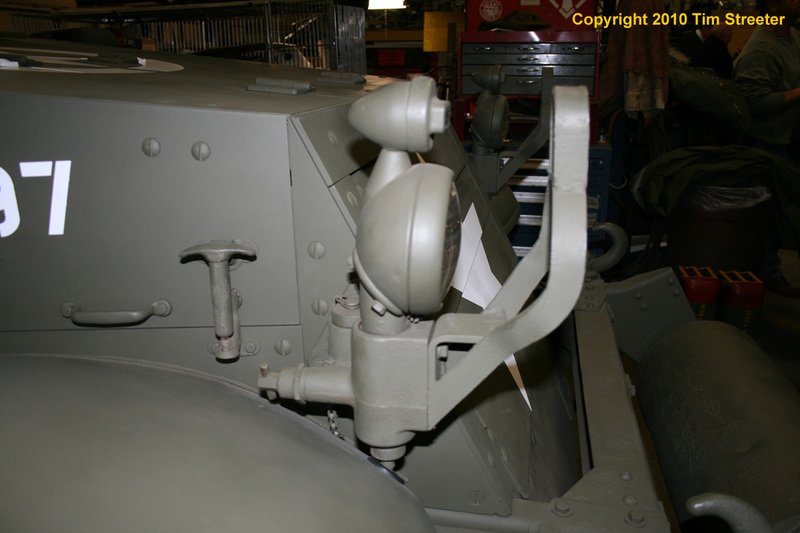 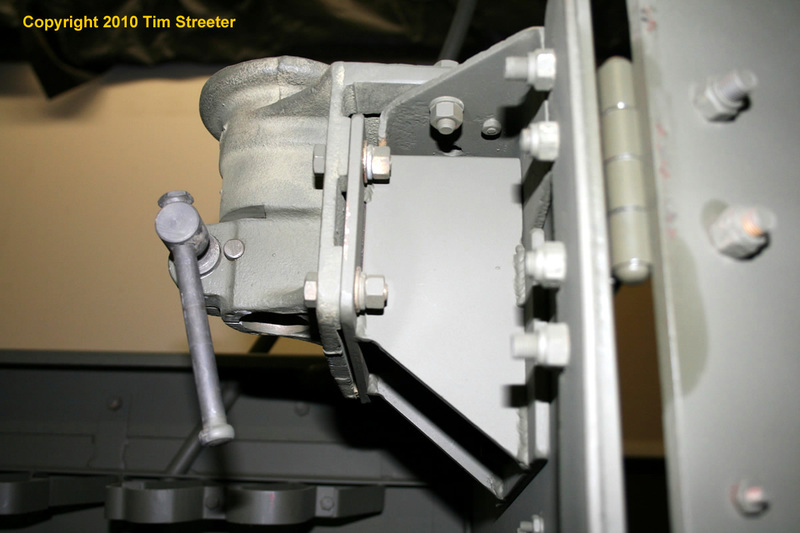 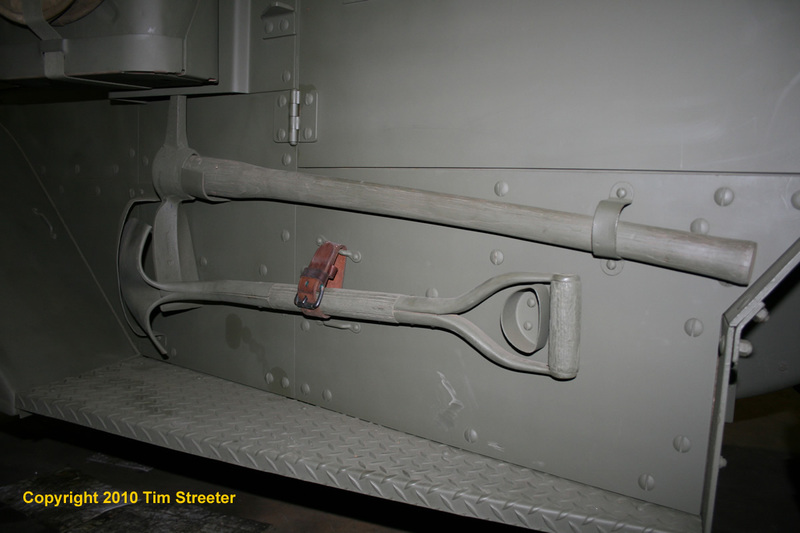 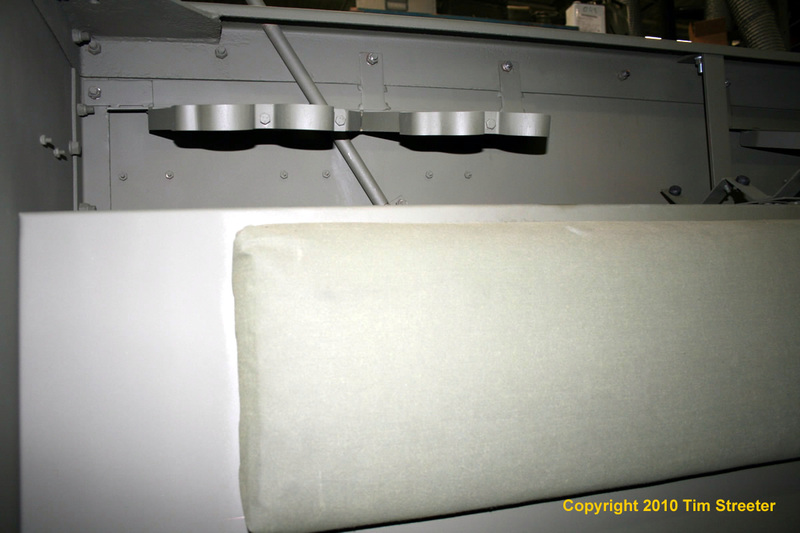 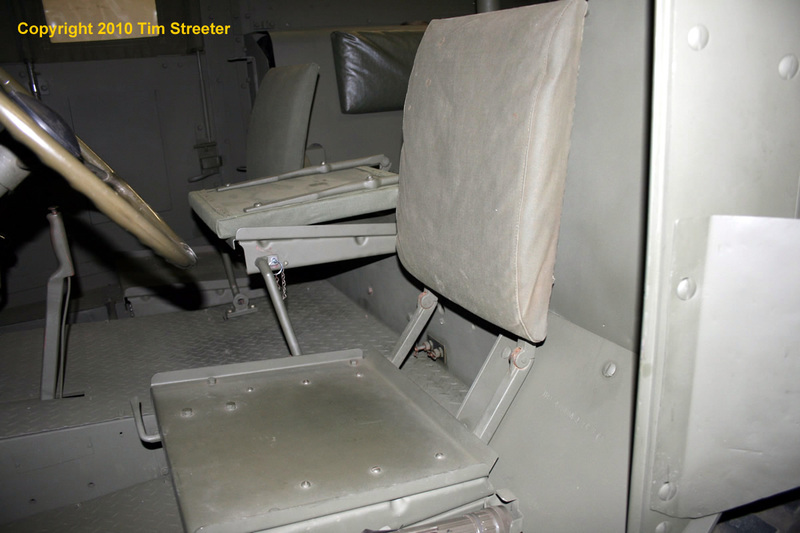 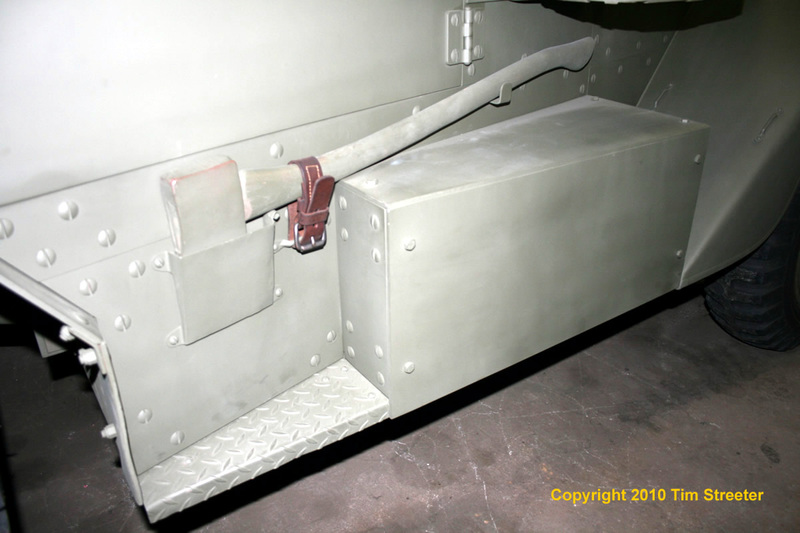 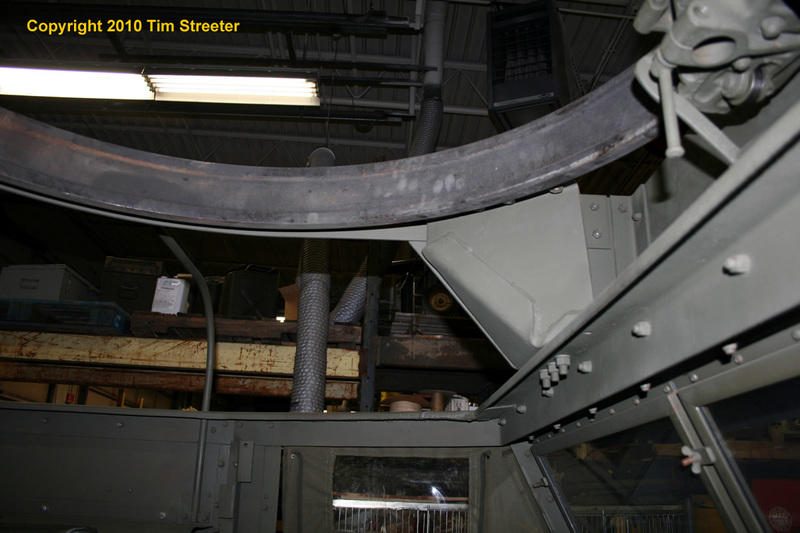 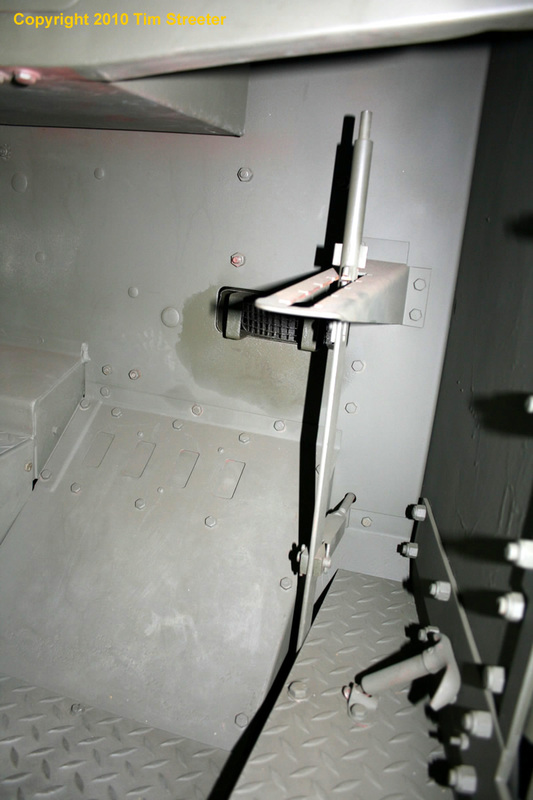 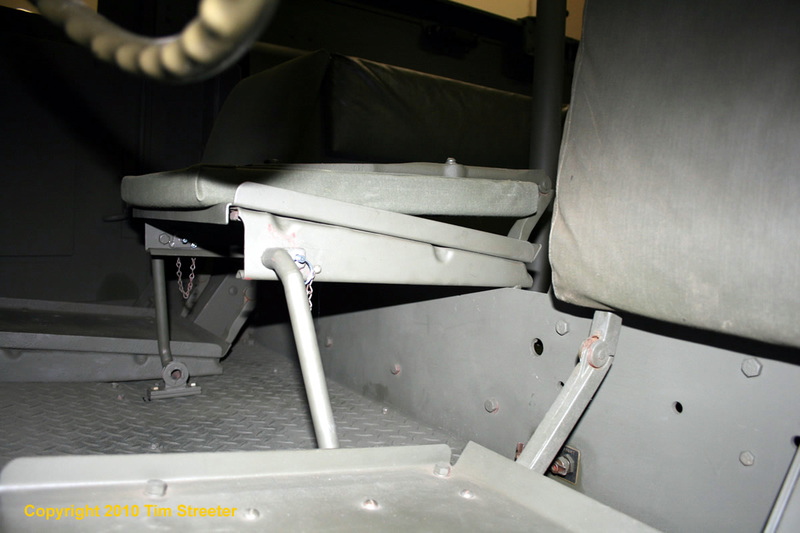 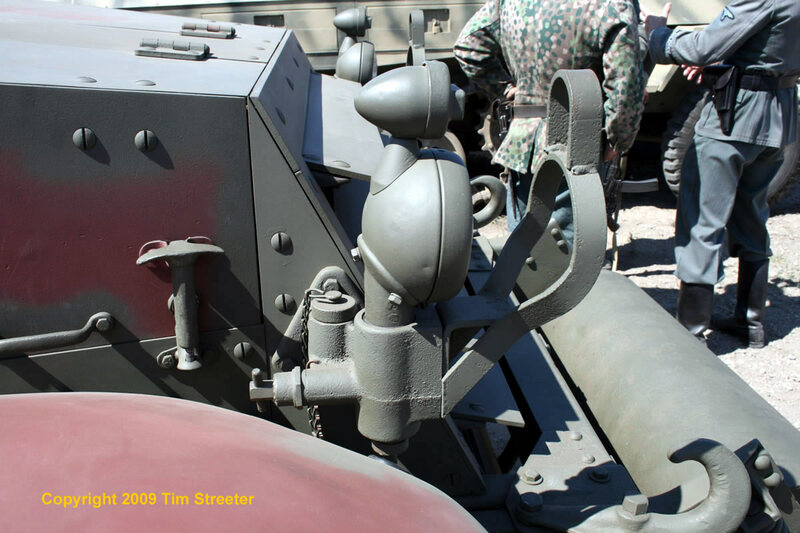 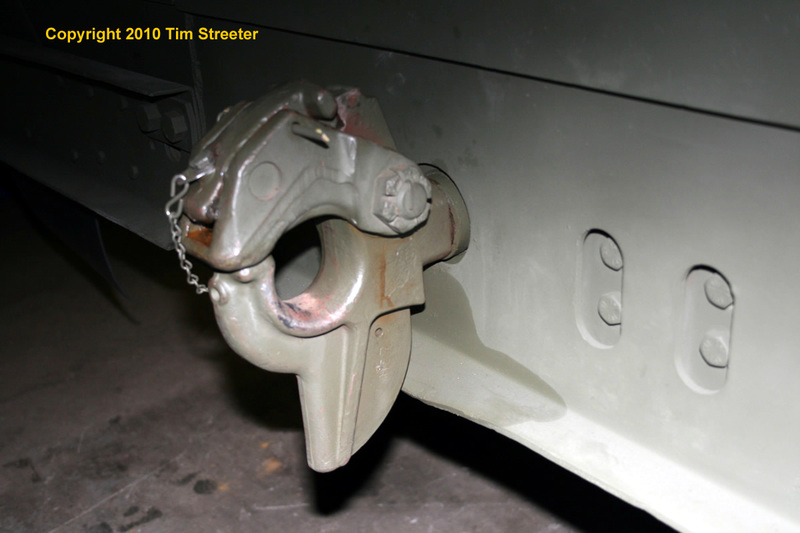 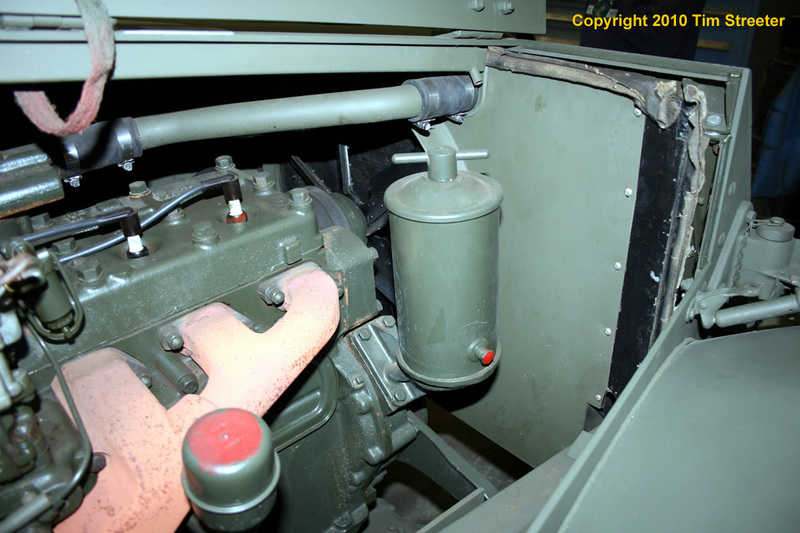 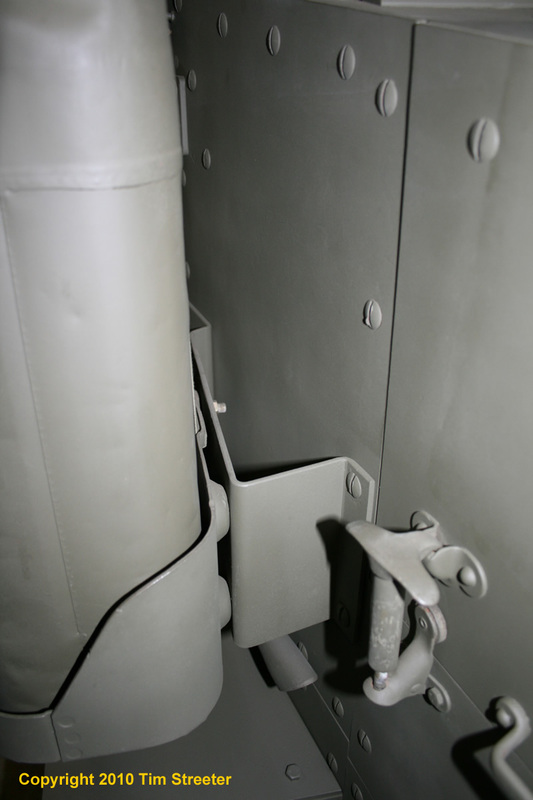 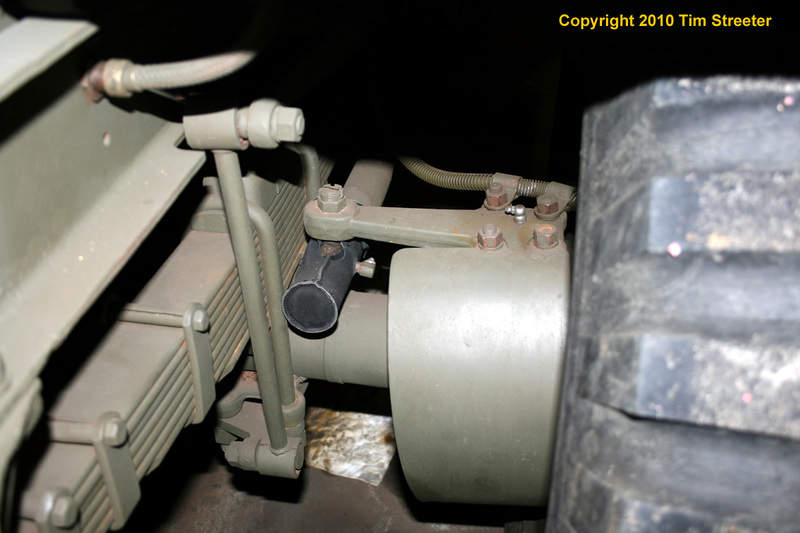 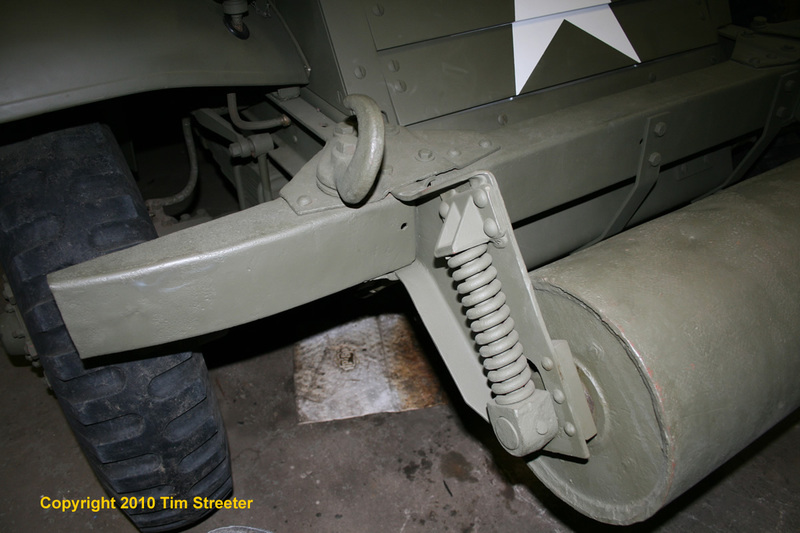 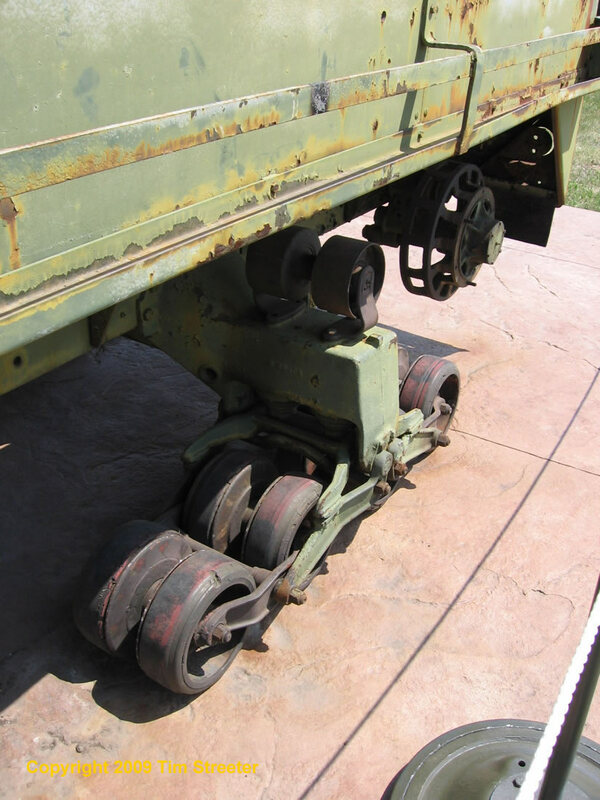 Photo #8 is of the same vehicle, showing the idler mount from a lower angle. 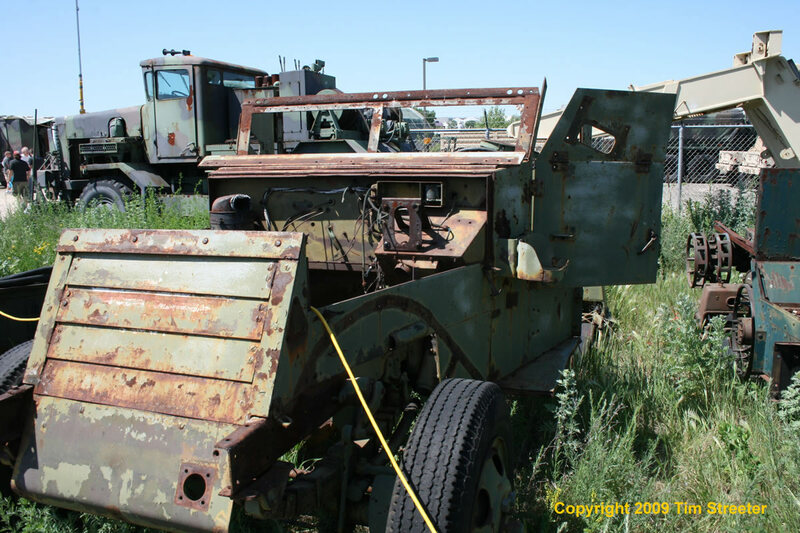 Sorry for the vegetation in the way! 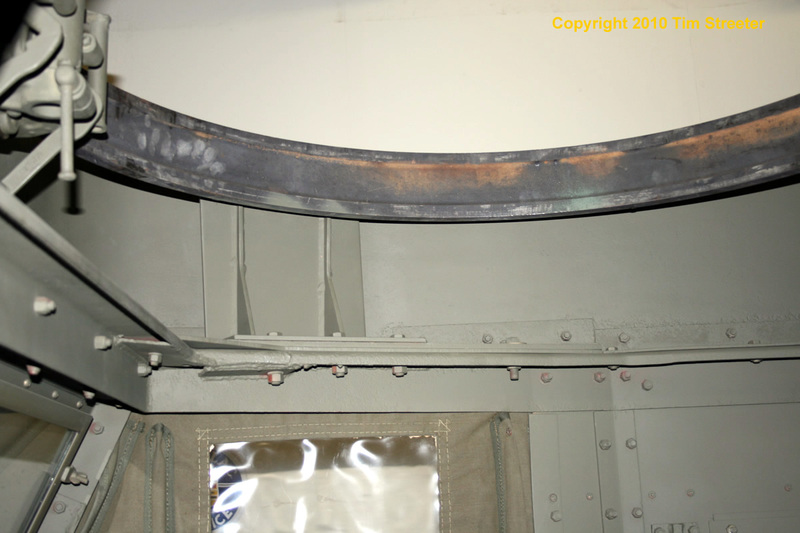 Photo #9 shows an unmounted track. 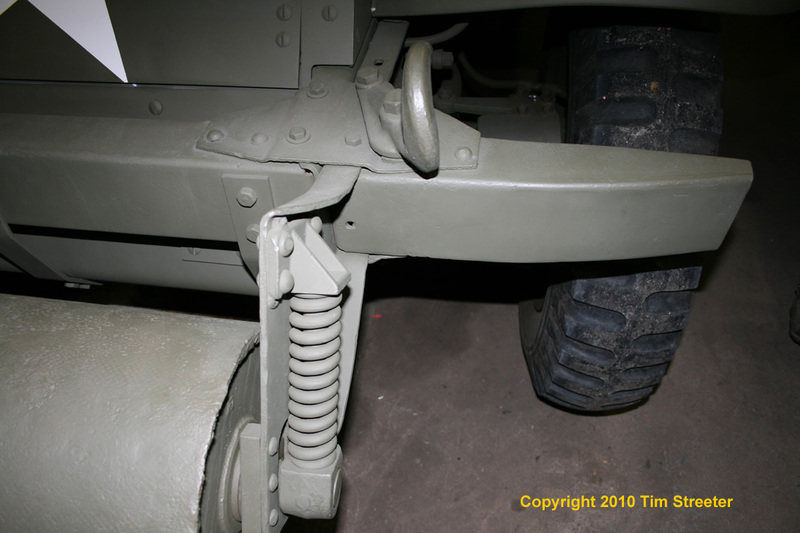 The "rubber band" construction of the track is obvious here. 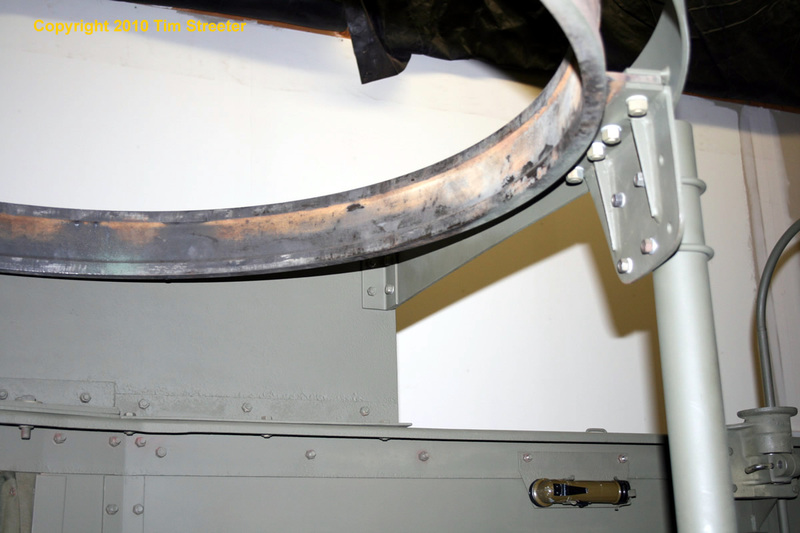 The lightening hole in the roadwheel support bracket can be seen more clearly as well. 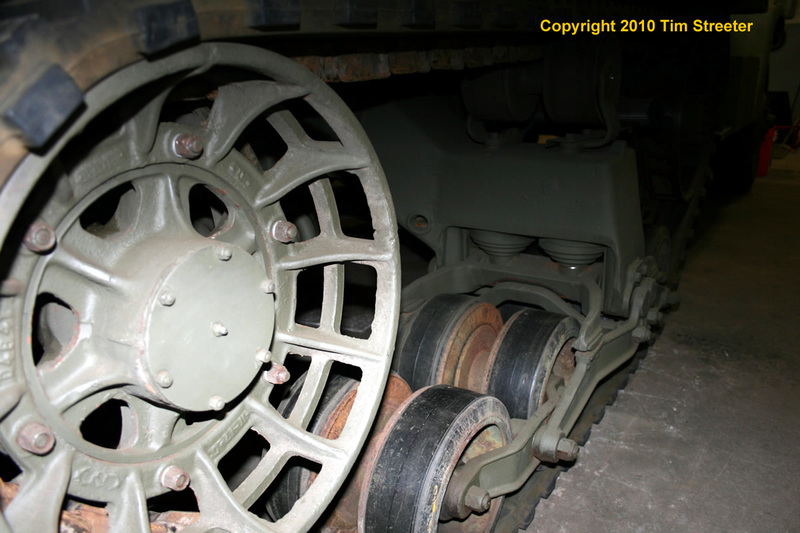 Sitting atop the roadwheels is part of a drive sprocket (the drive sprockets have a different pattern of holes around the outer edge than the idlers do). 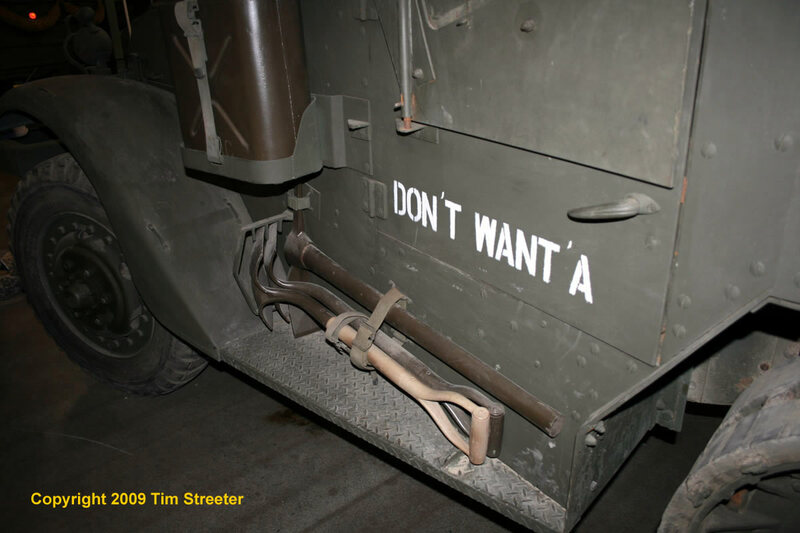 Finally, we have a donor that was displayed during one of the Fort Snelling Military Expos. 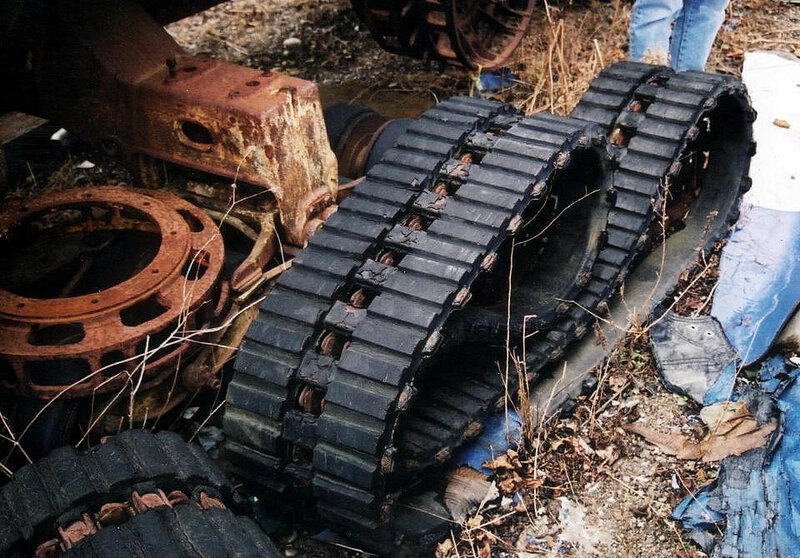 A couple years later I saw even less of it "in the pasture" next to another shell and some worn treads.